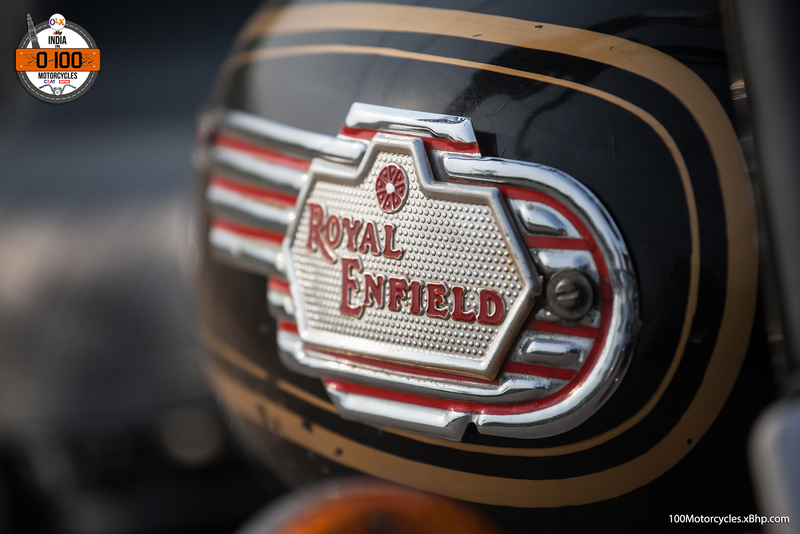 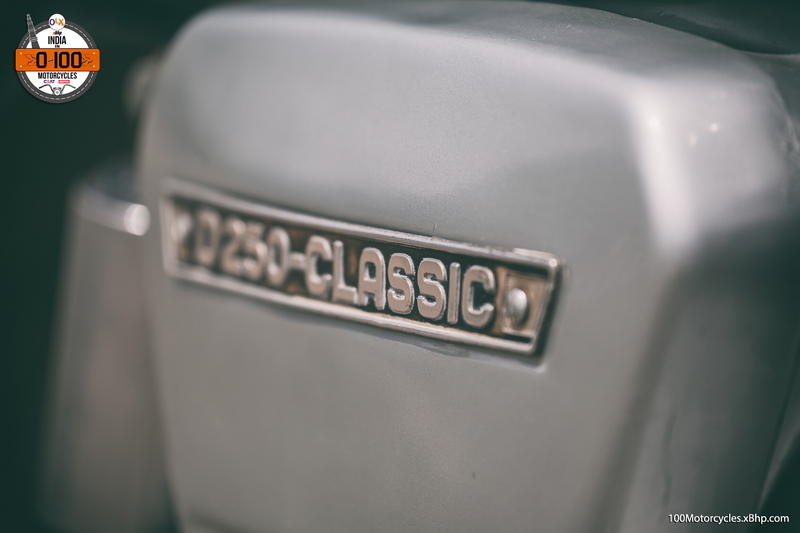 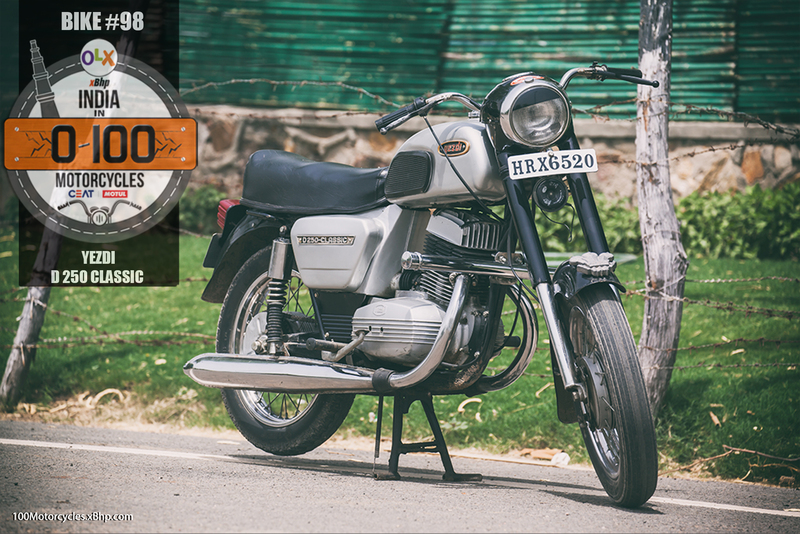 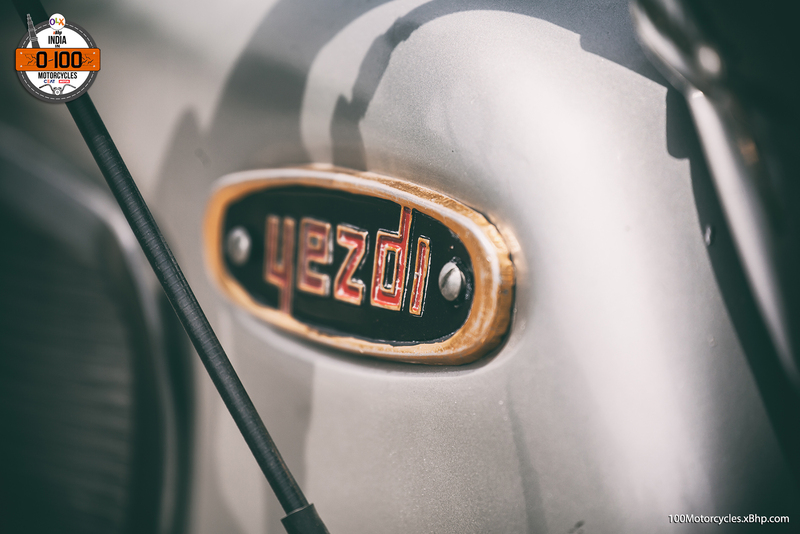 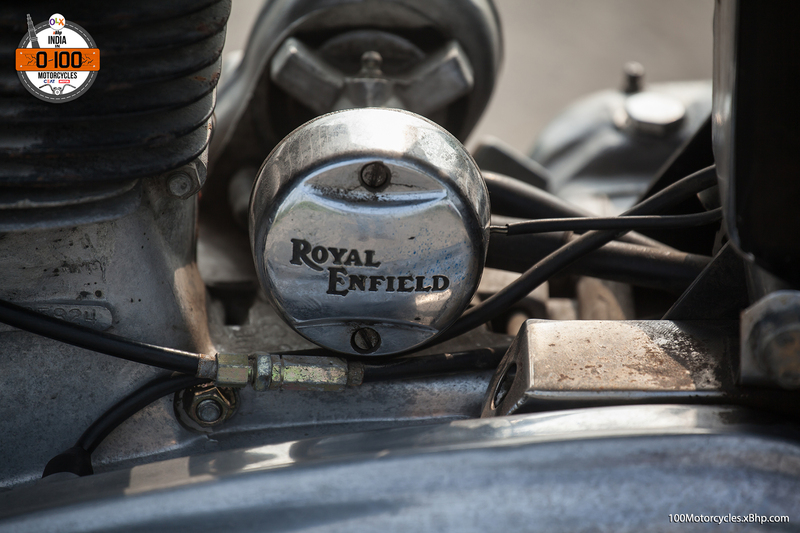 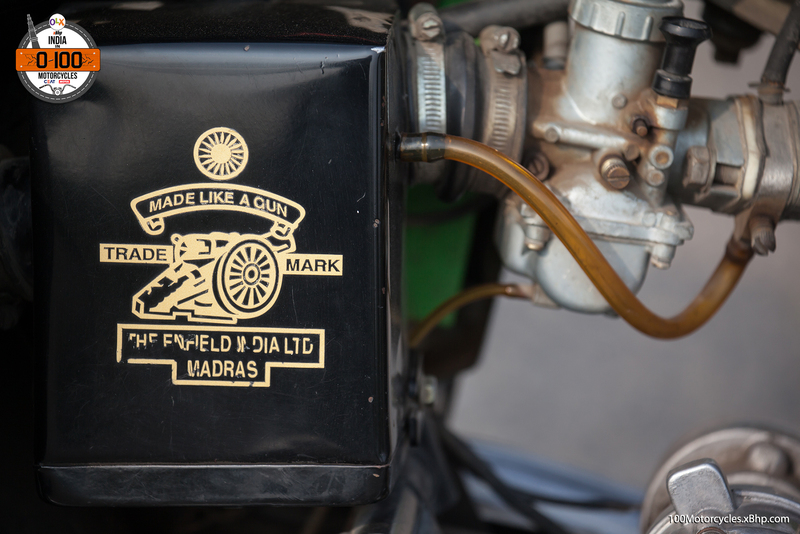 The Indian brand has a lot of history behind it. 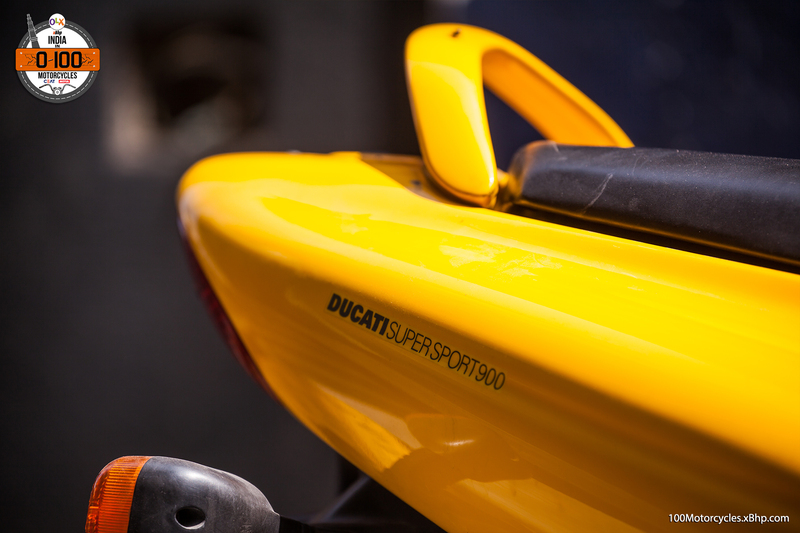 Ever since 1953 when the main factory was closed down, it was struggling to keep its head out of the water. 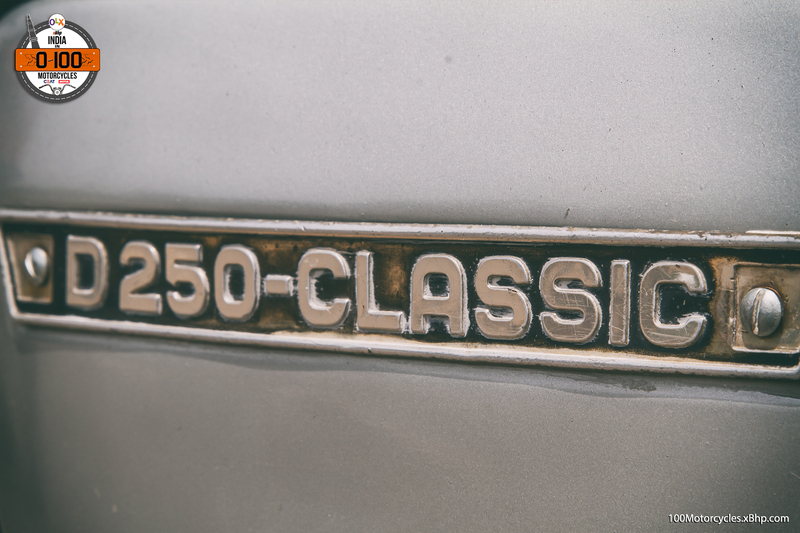 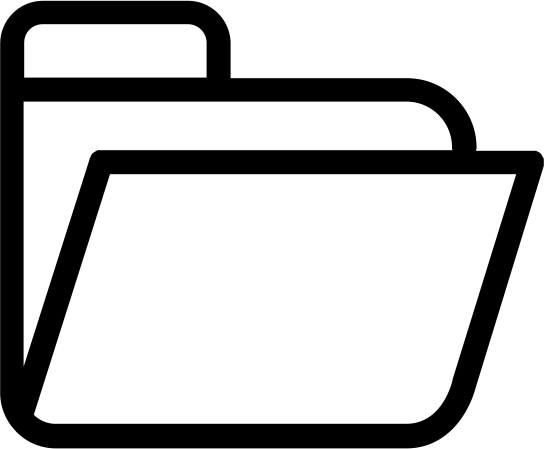 But the brand is so strong (and evidently loved) that it seems to have been finally successfully revived once Polaris bought it over. 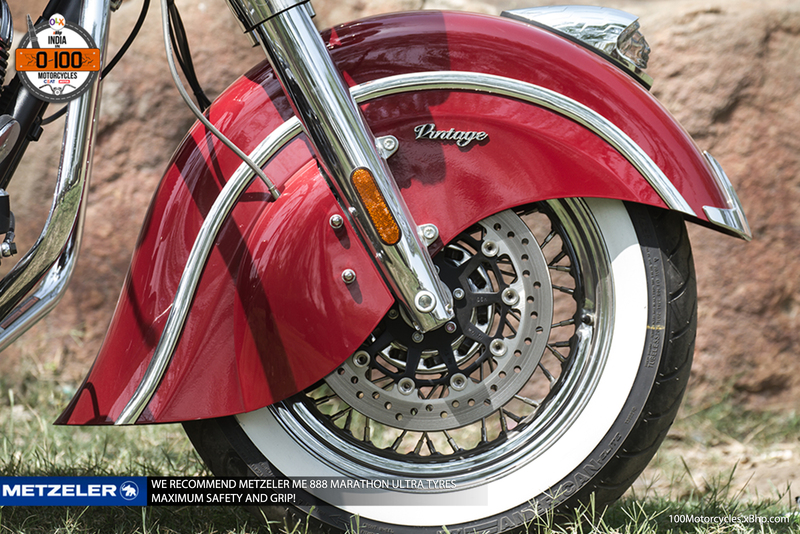 Polaris’ experience with Victory Motorcycles was a big advantage in reviving this piece of history. 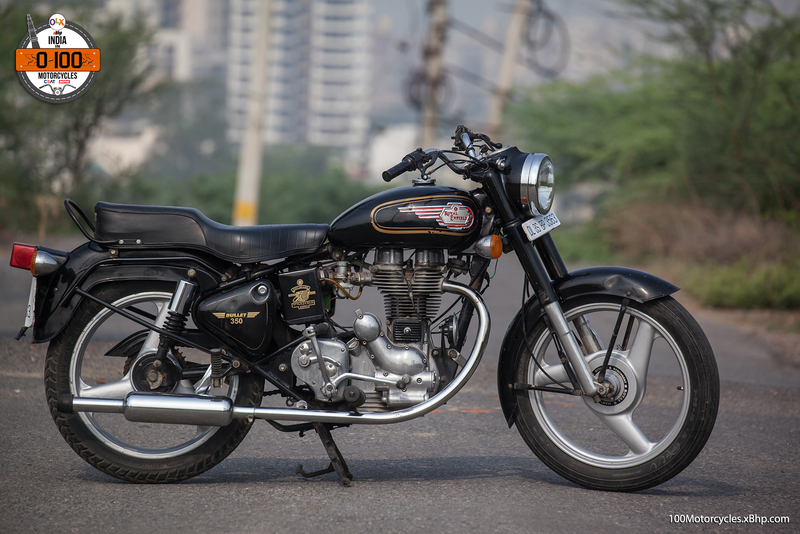 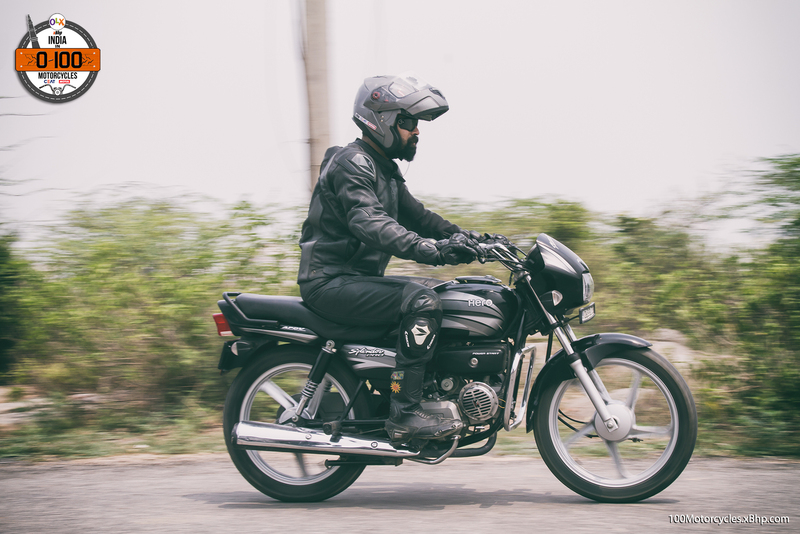 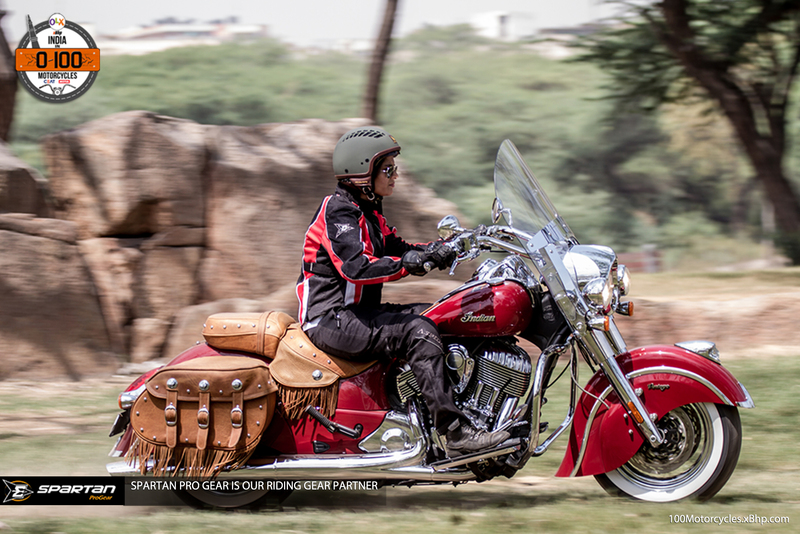 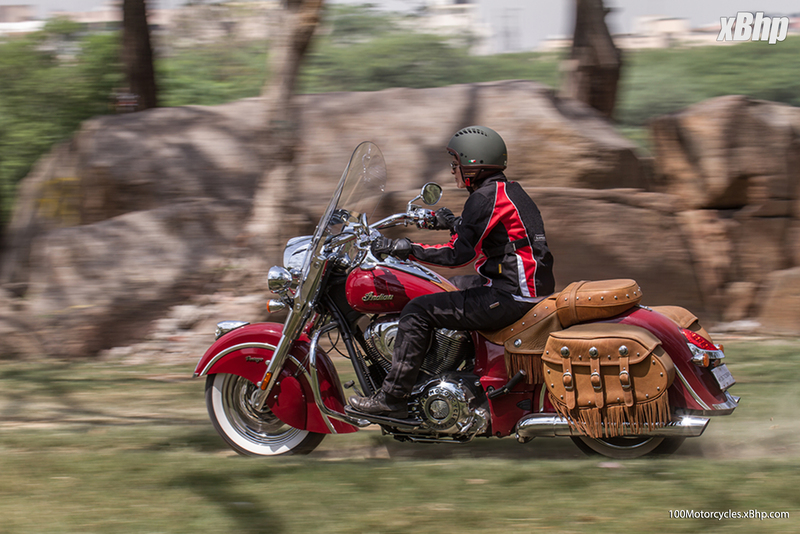 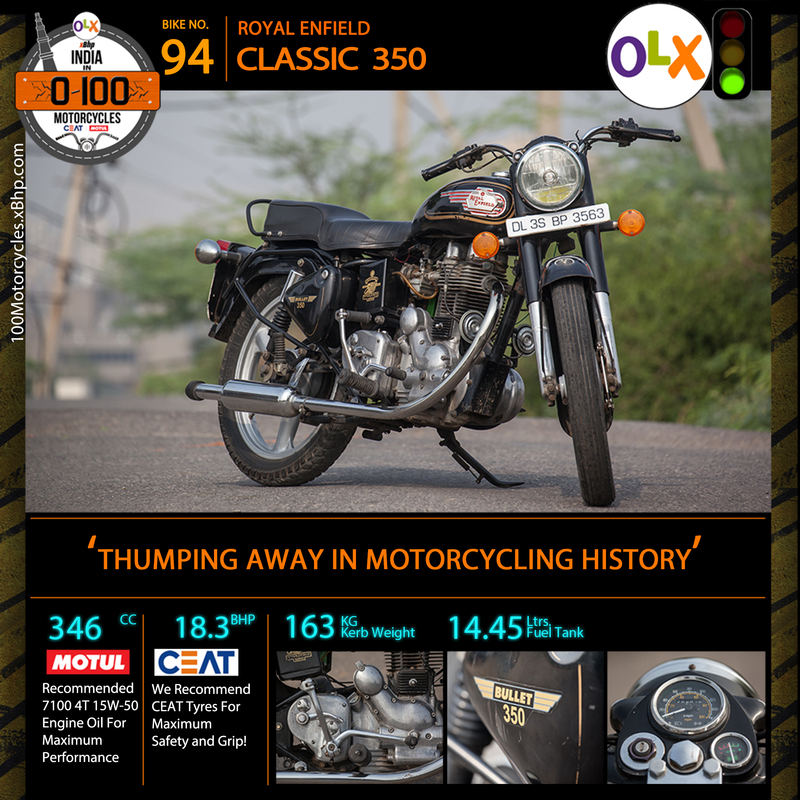 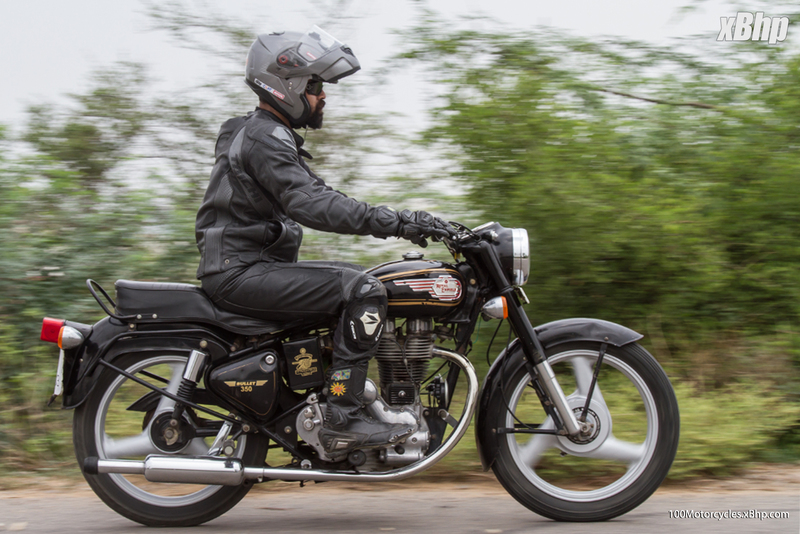 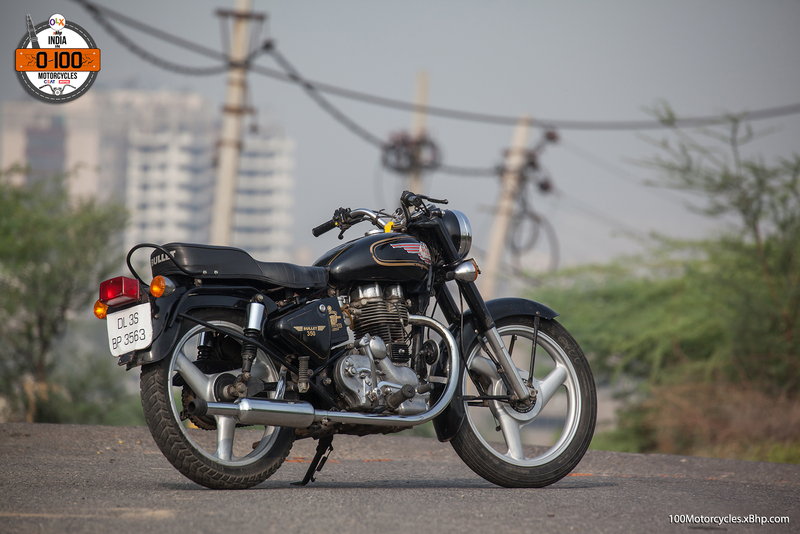 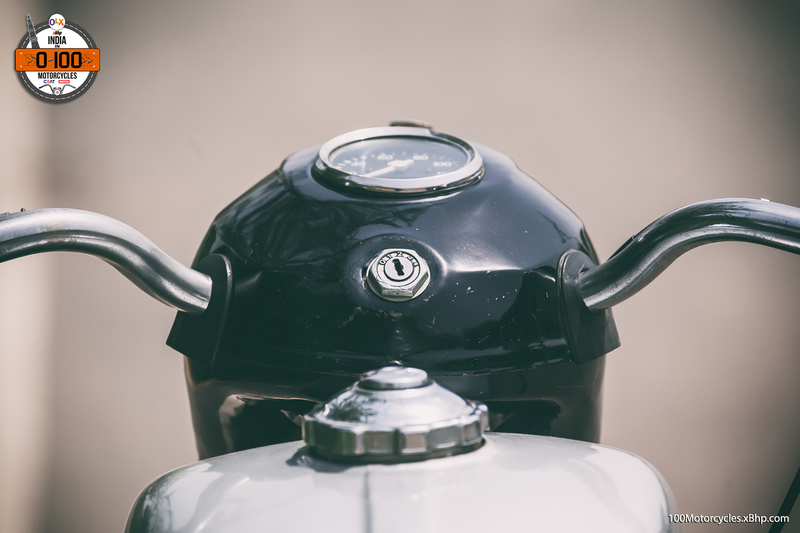 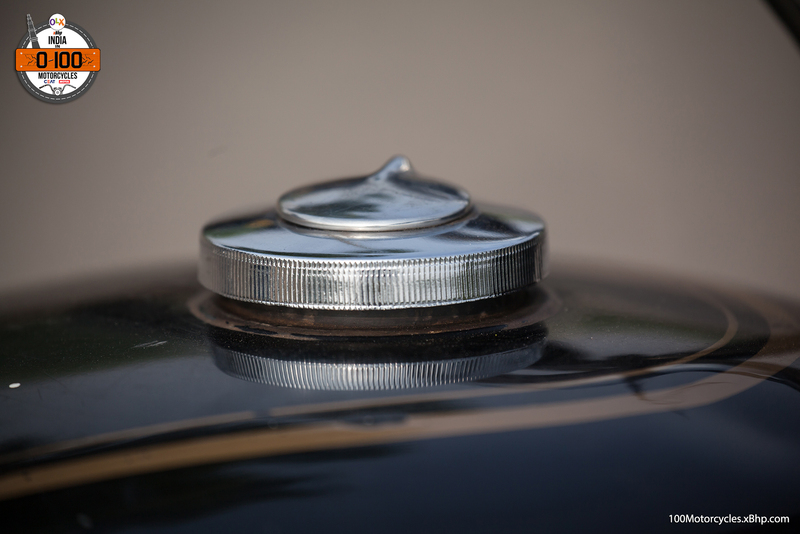 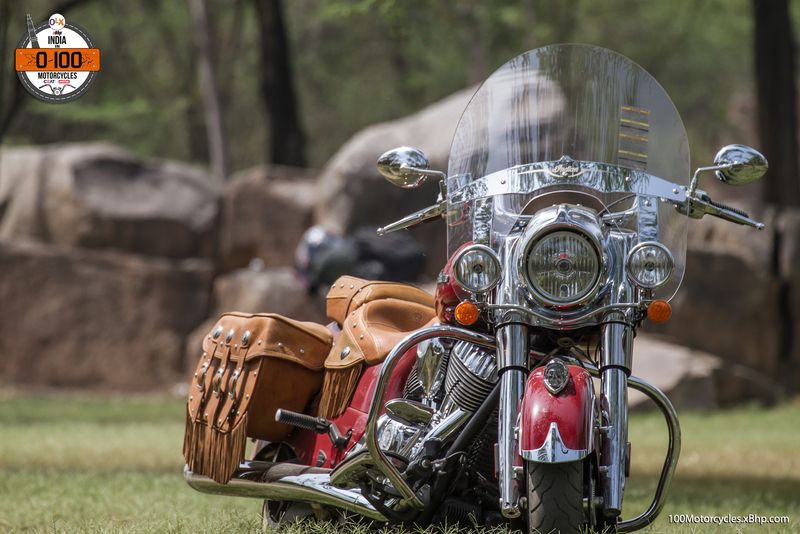 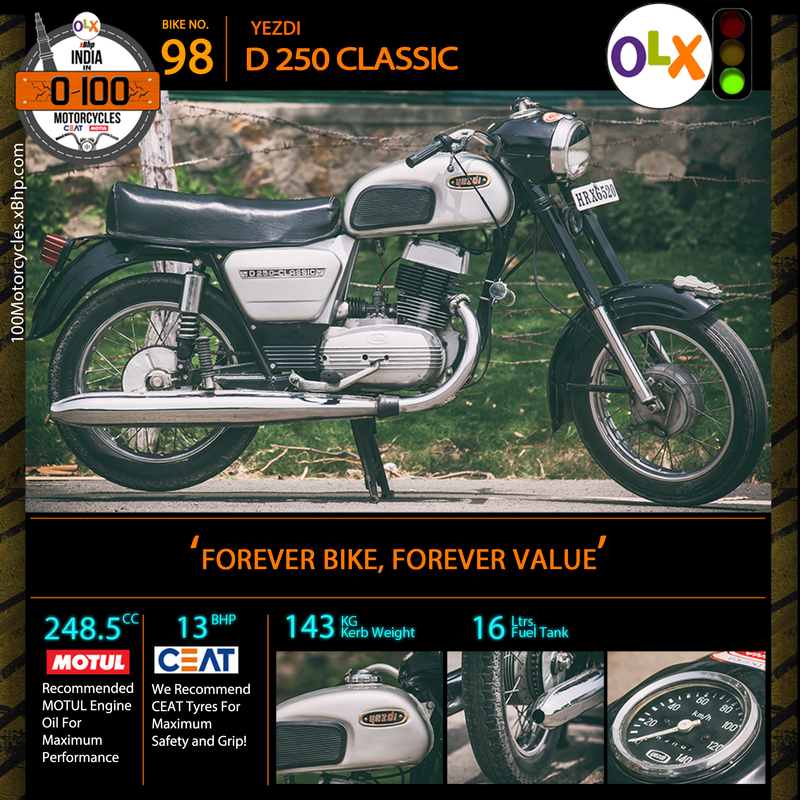 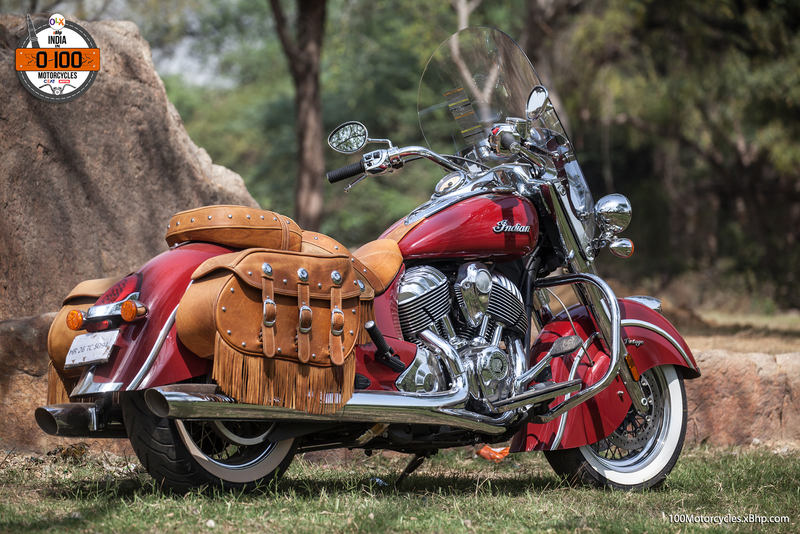 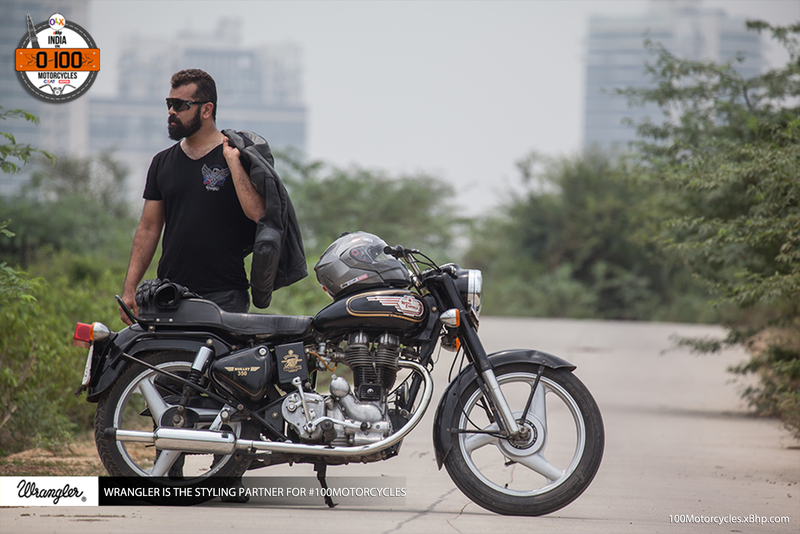 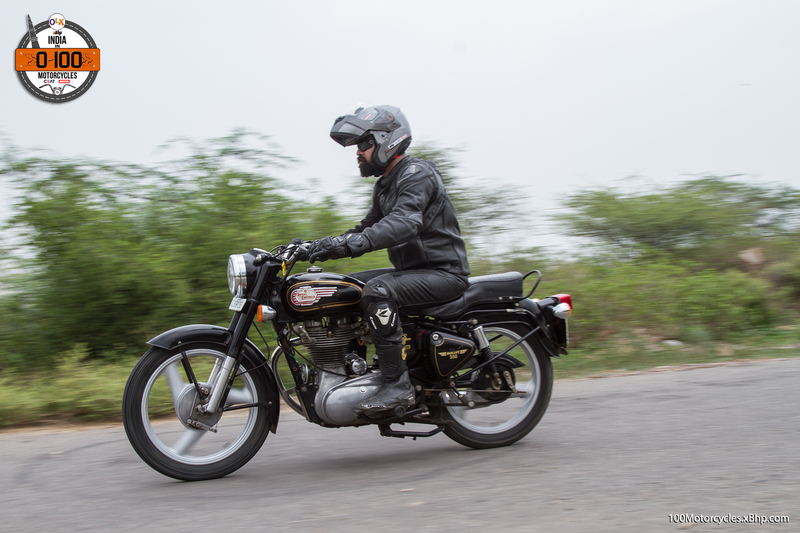 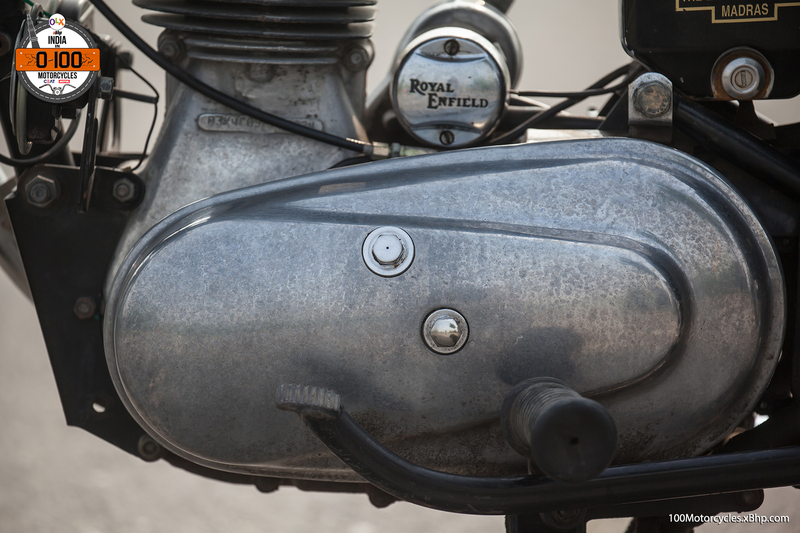 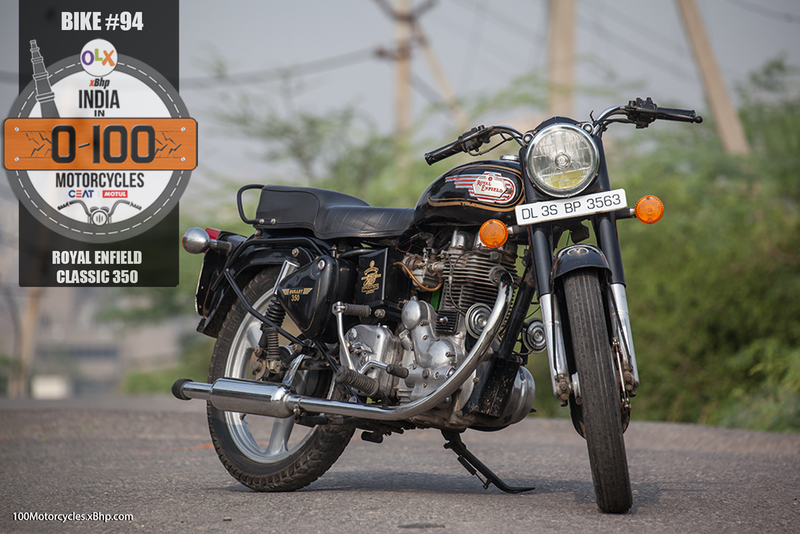 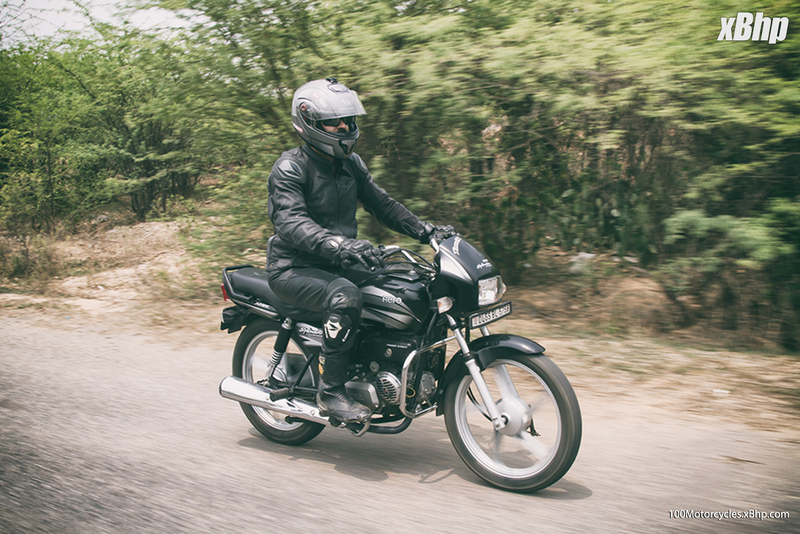 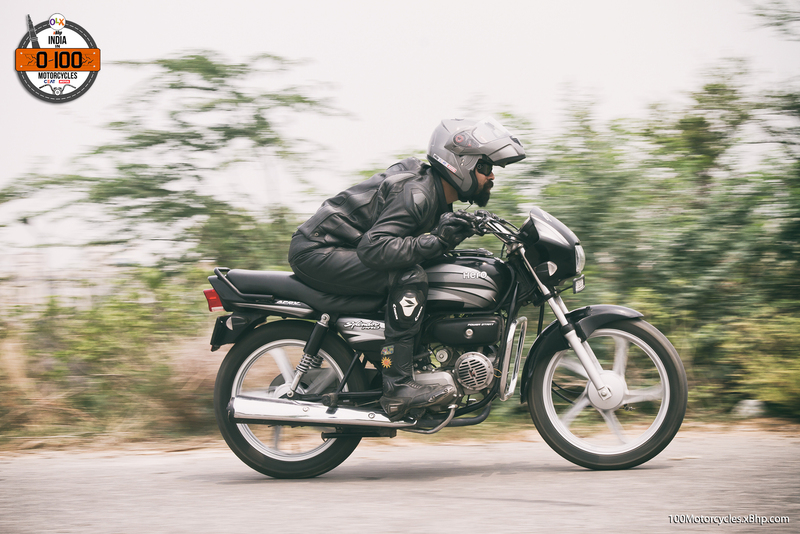 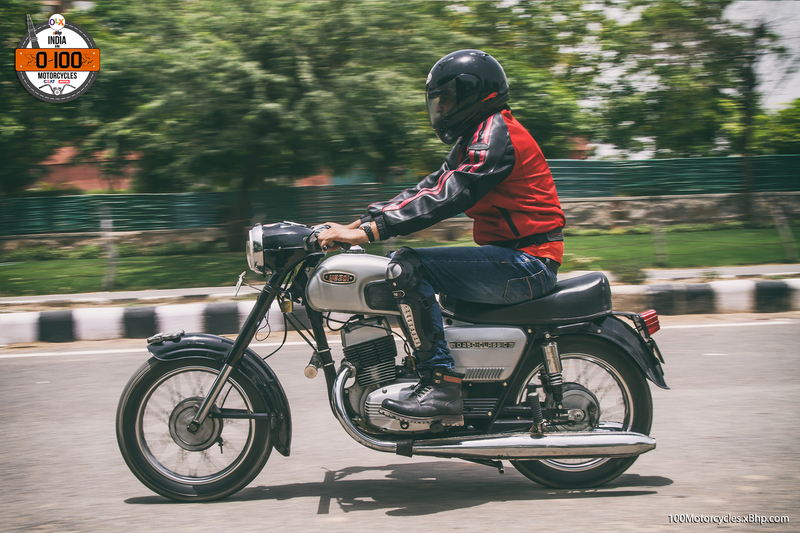 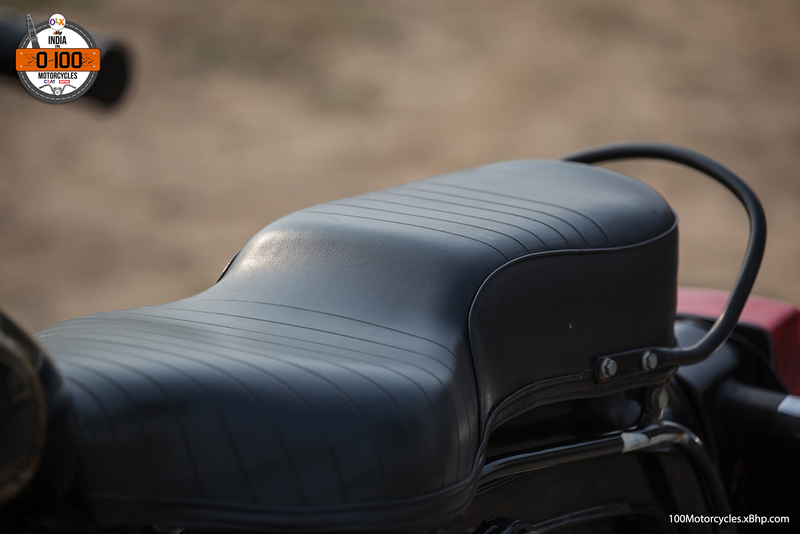 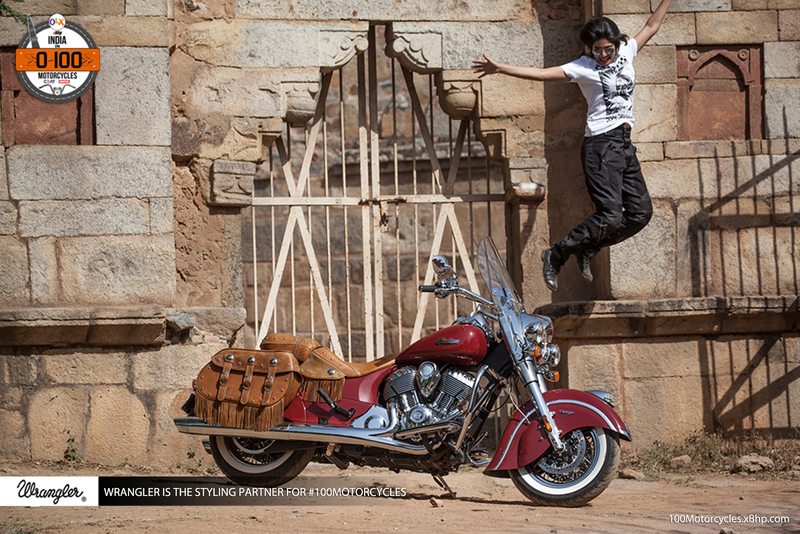 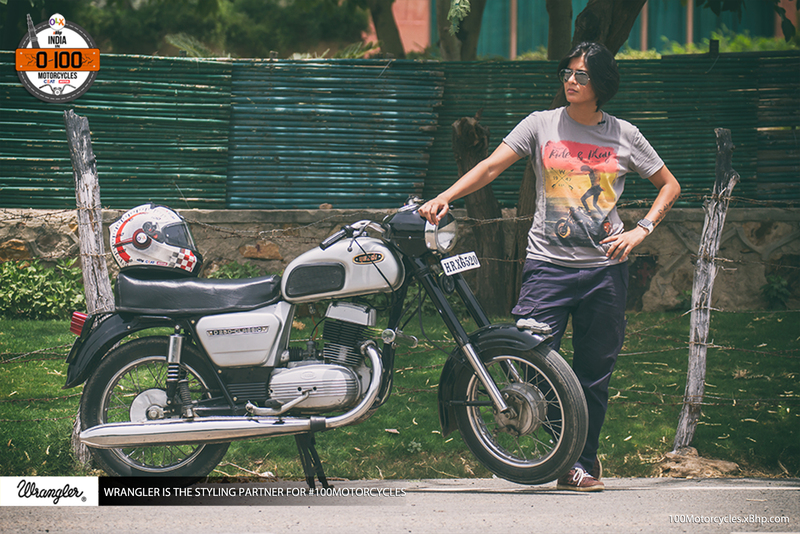 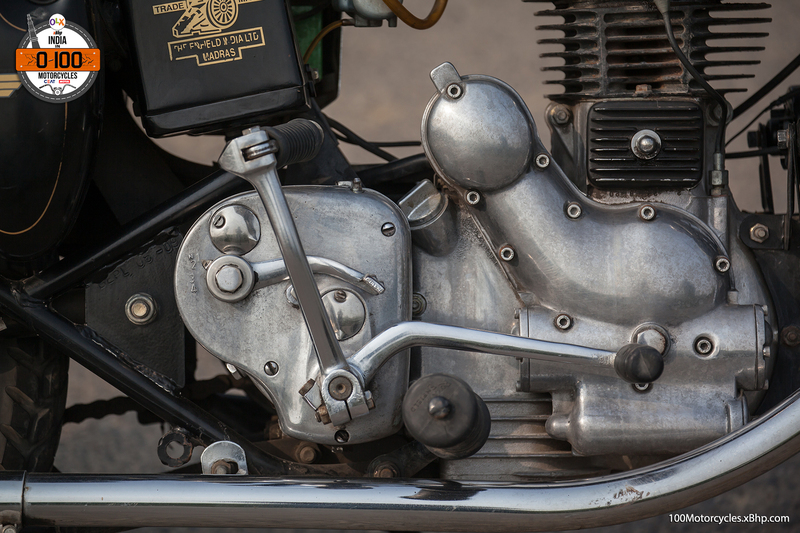 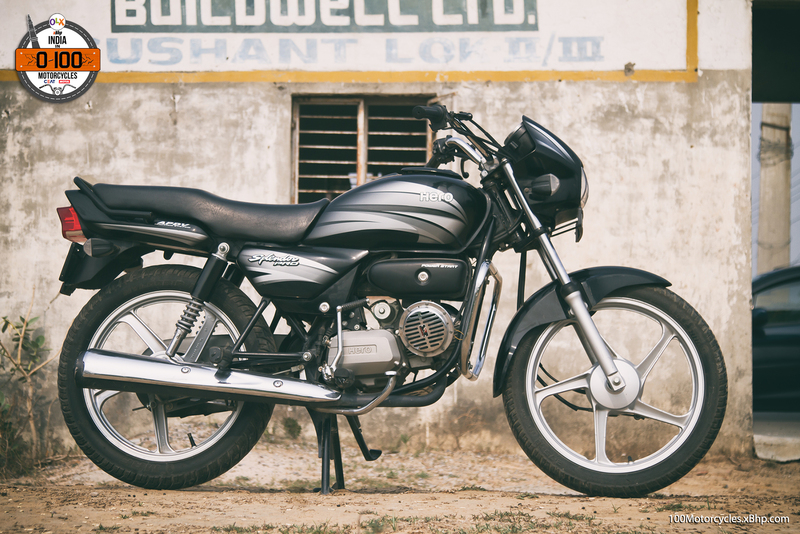 The first impression you will get on the Indian Vintage is that it is beautiful, in the truest sense of the word. 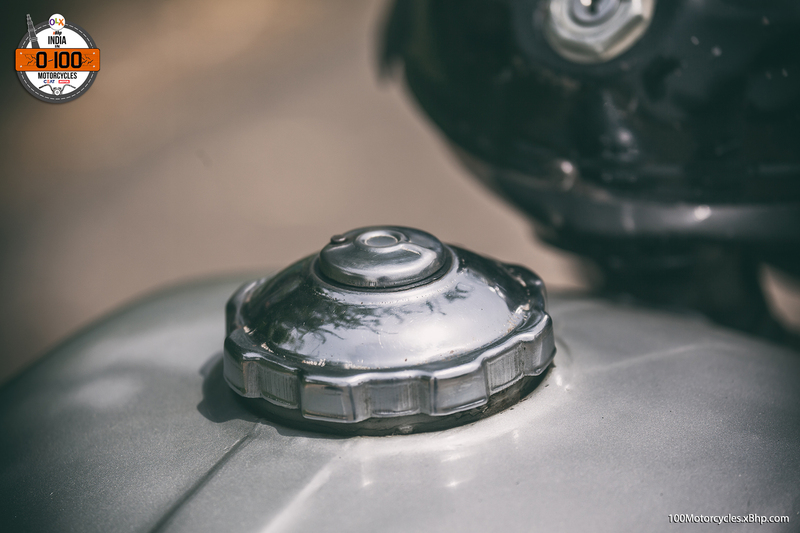 It seemed to have been chromed in every bit possible and it does look stunning under a clear sky, as it seems to change its colour to blue with that plethora of ultra-reflective surfaces. 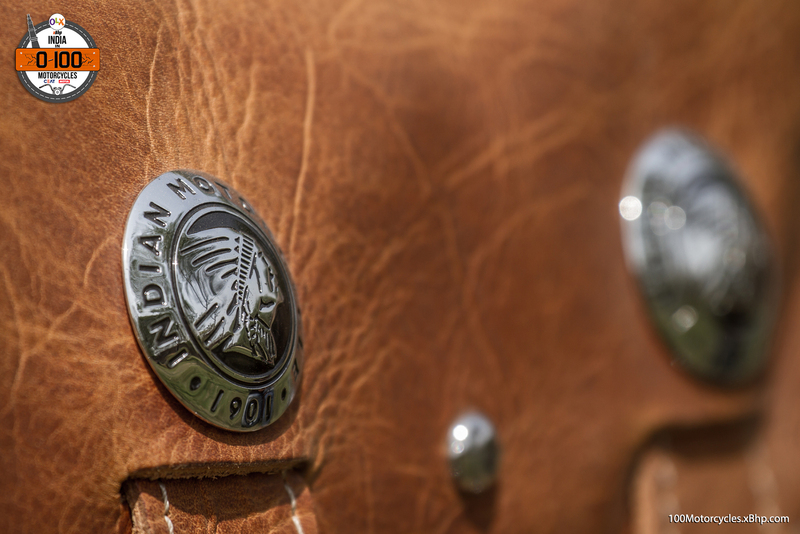 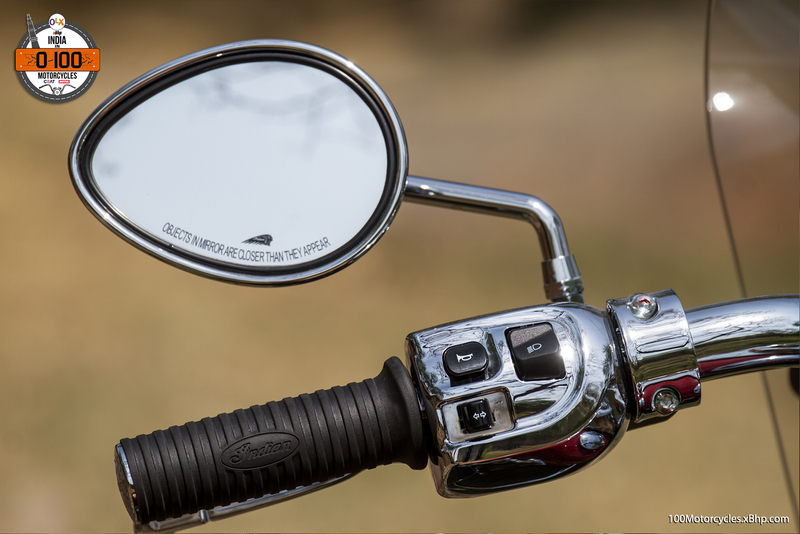 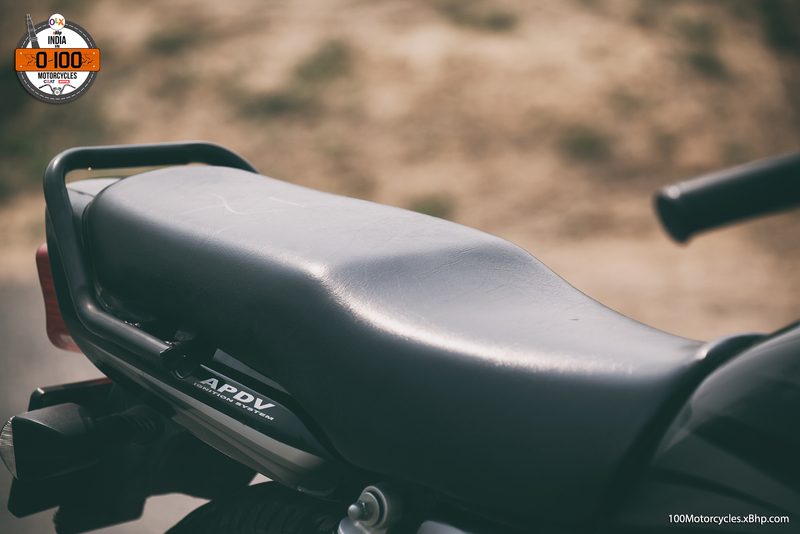 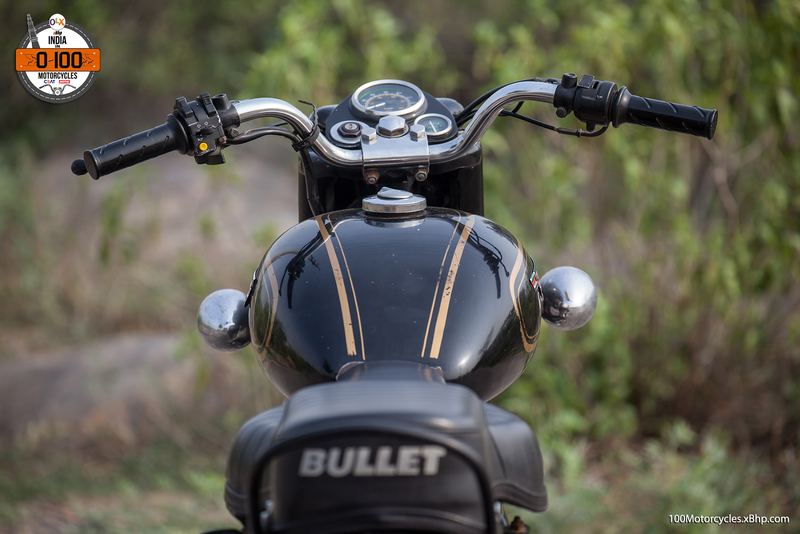 The fit and finish are excellent with detailing like the embossed Indian logo on the mirrors and the Indian bevelled script logo on the tank giving it a lot of character to discover as your eyes flow around the bike. 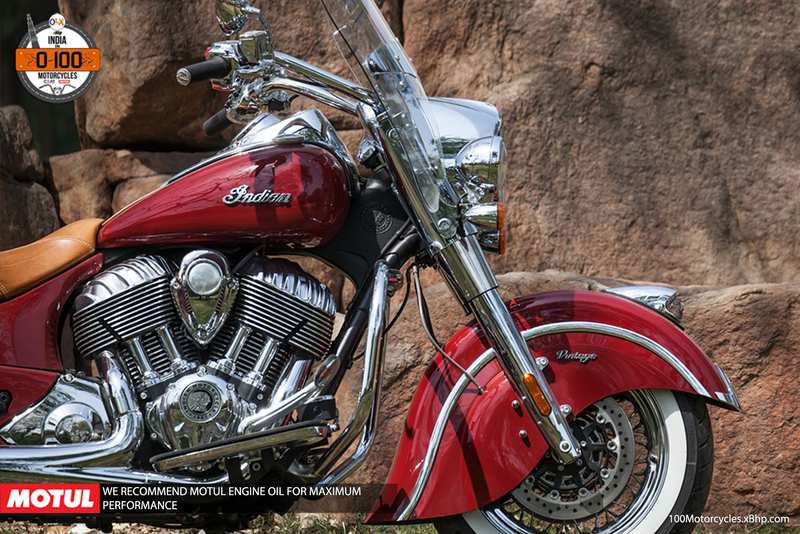 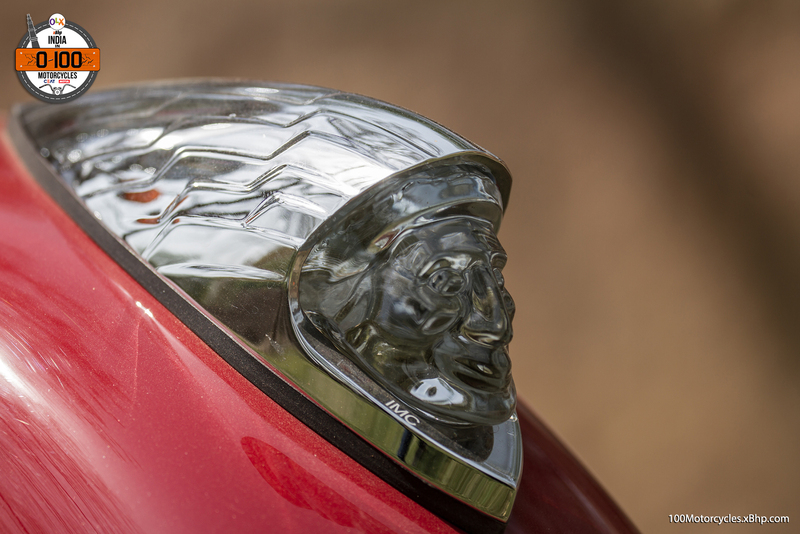 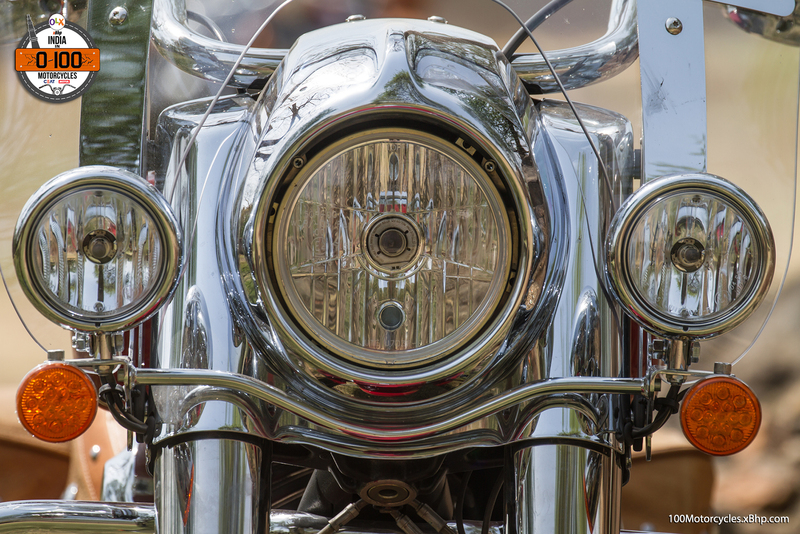 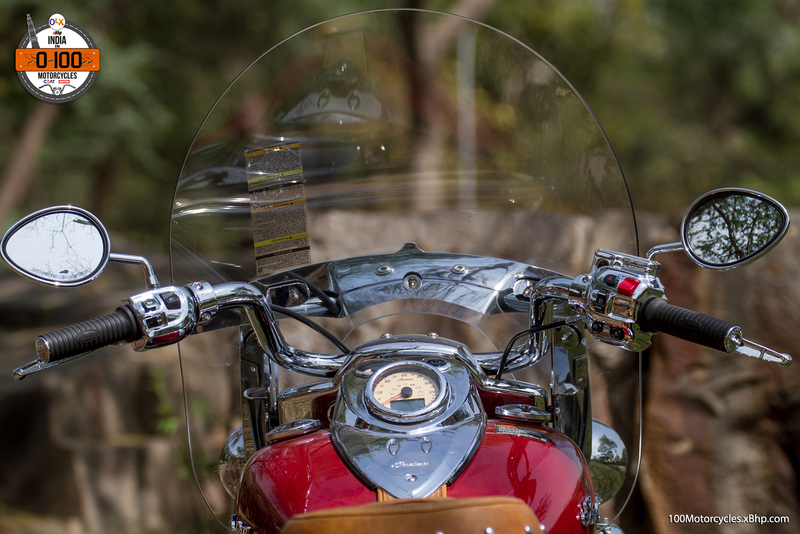 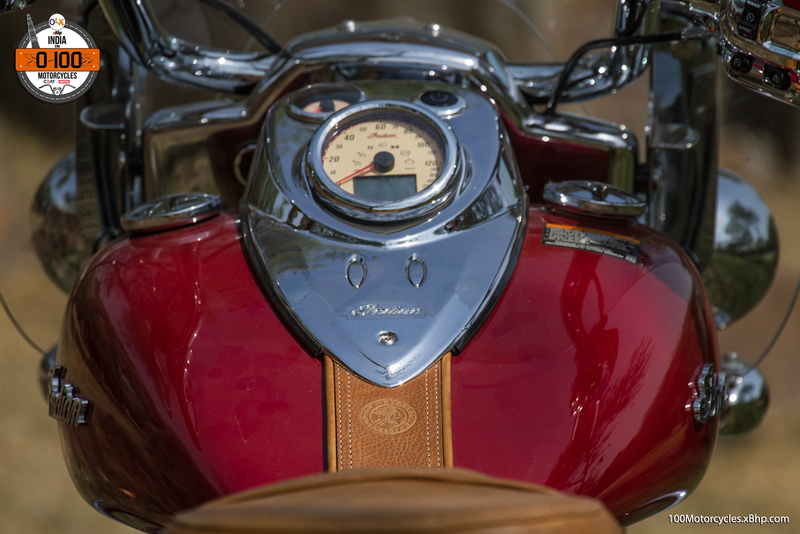 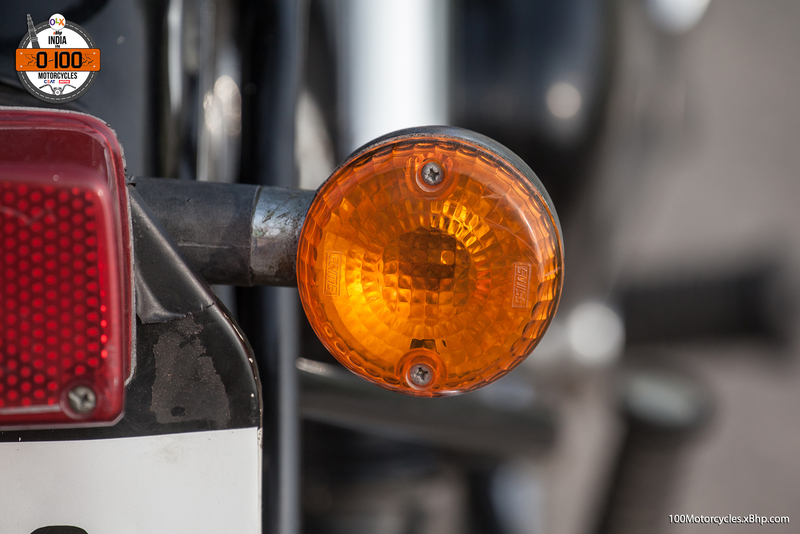 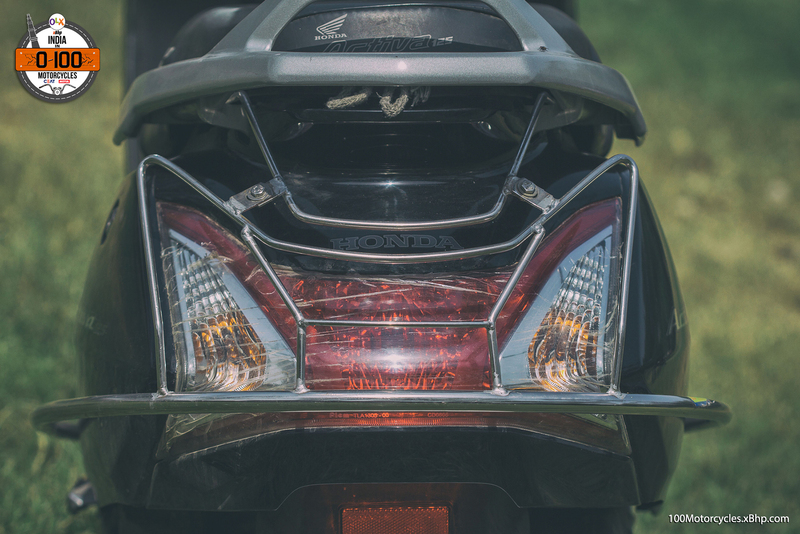 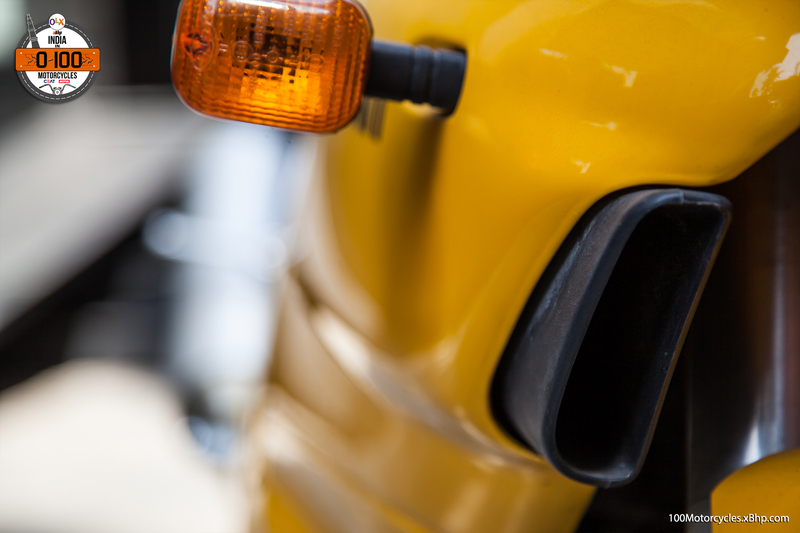 The Indian’s head on the front fender glows along with the parking light and makes for an attractive brand statement. 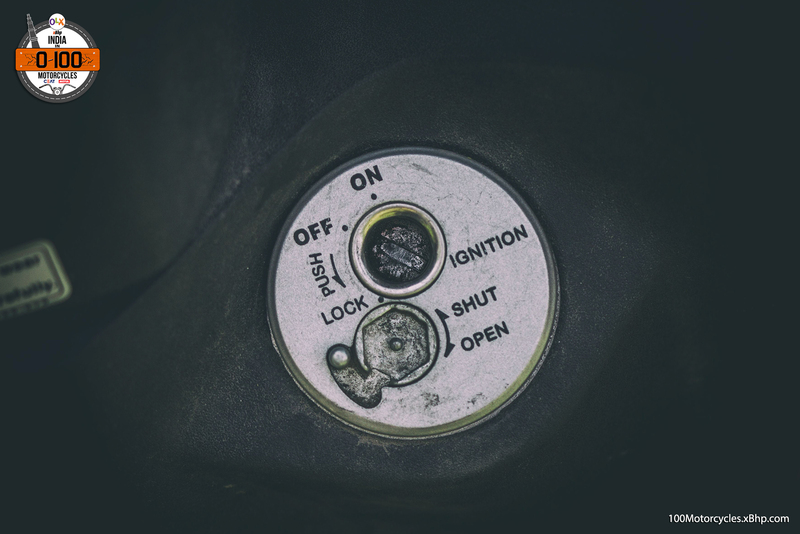 The next deal sweetener is the ignition switch. 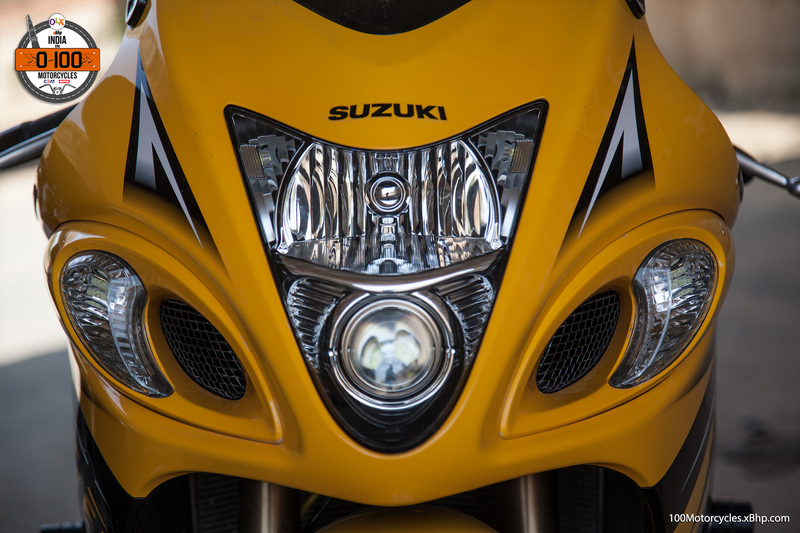 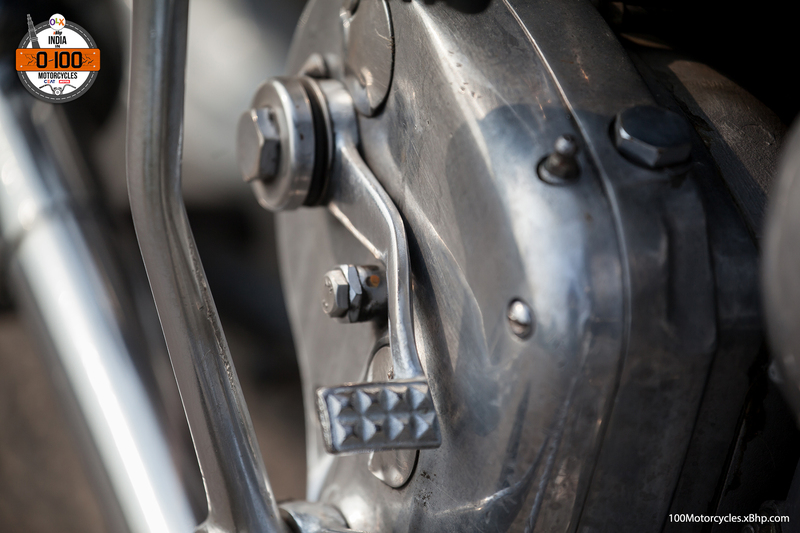 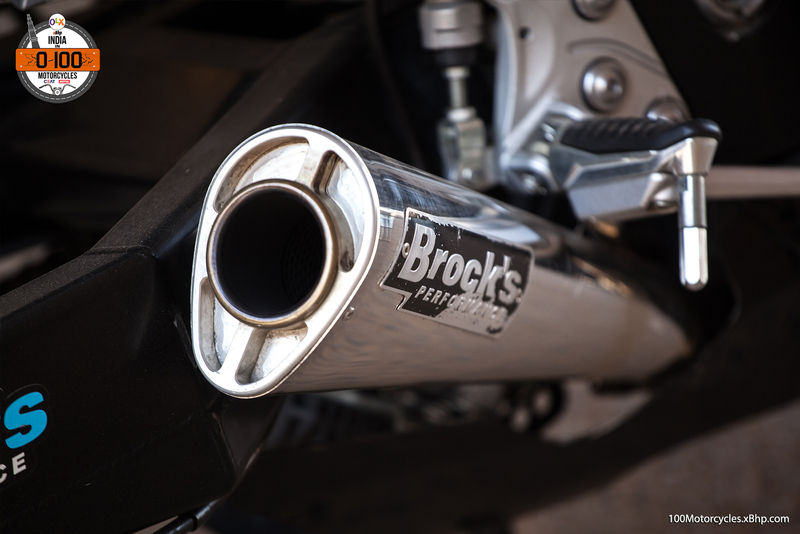 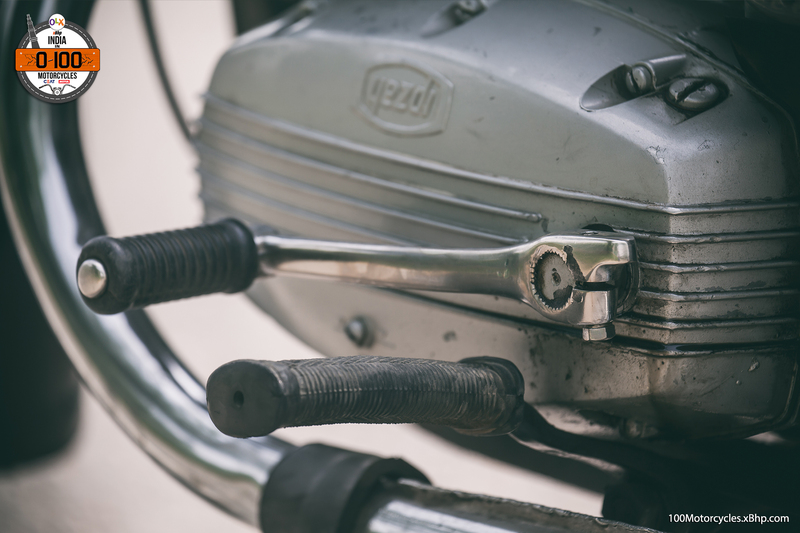 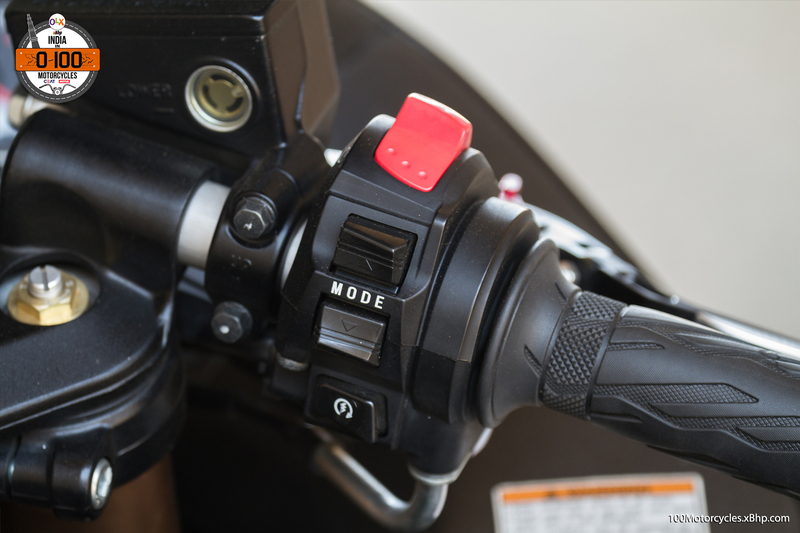 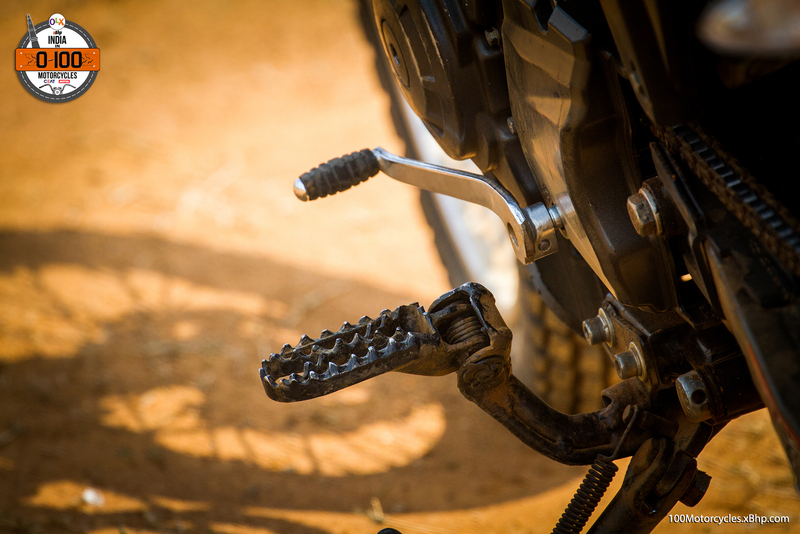 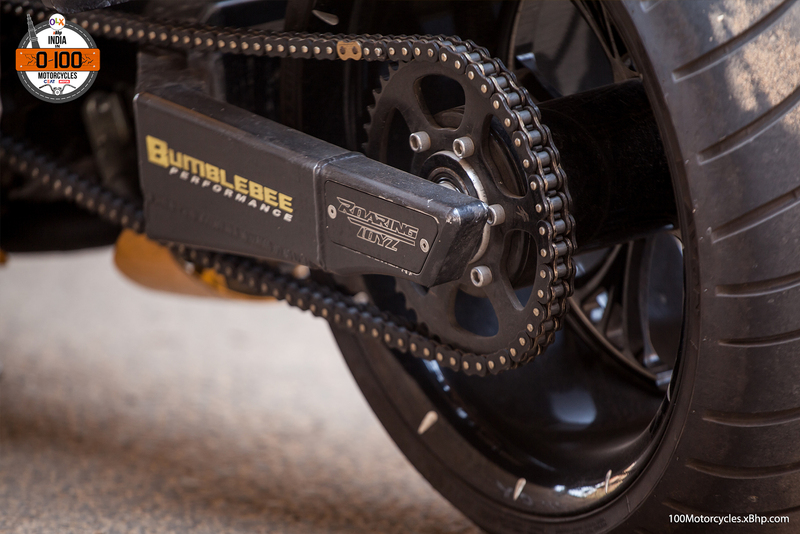 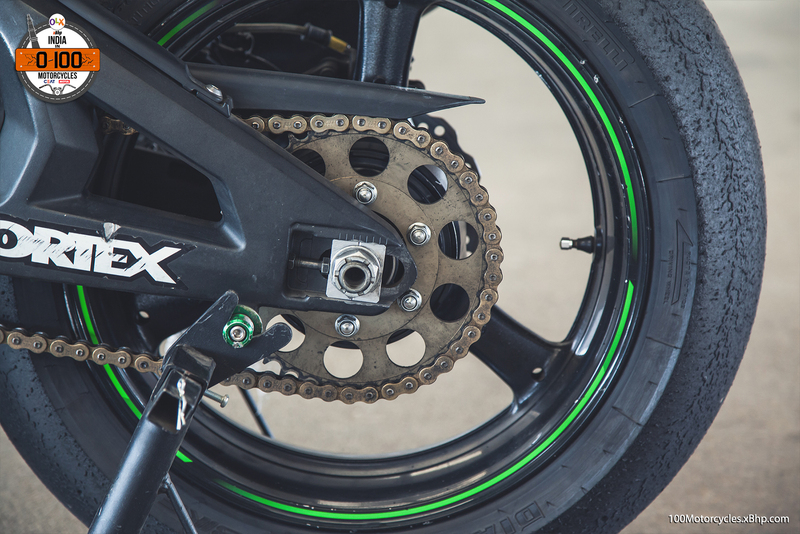 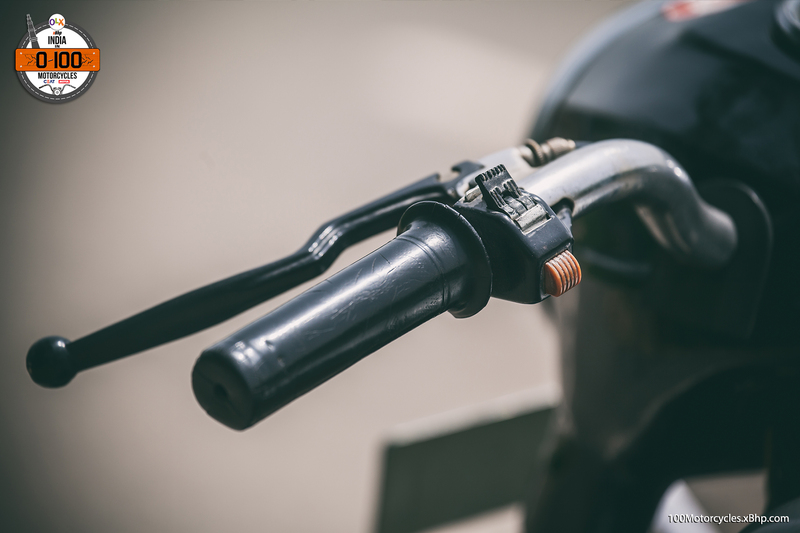 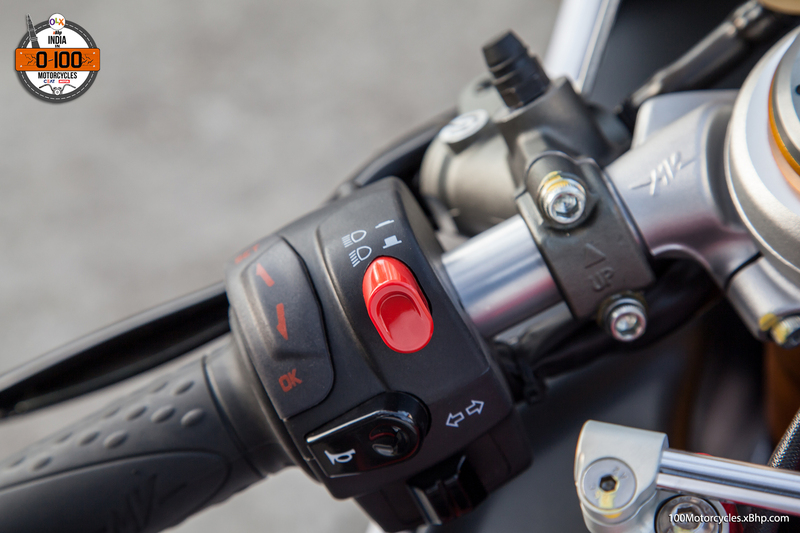 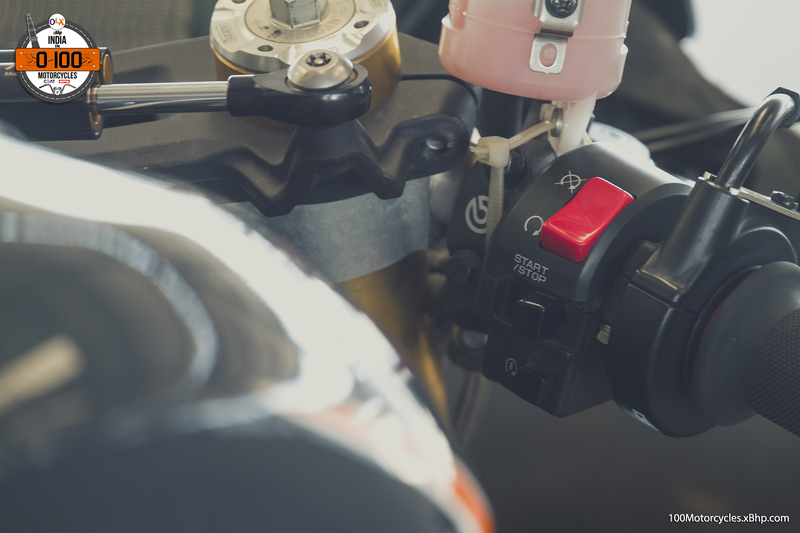 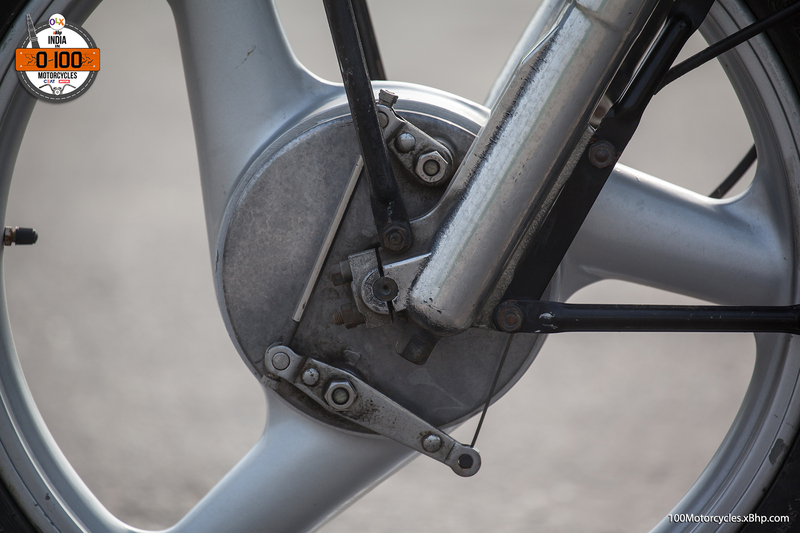 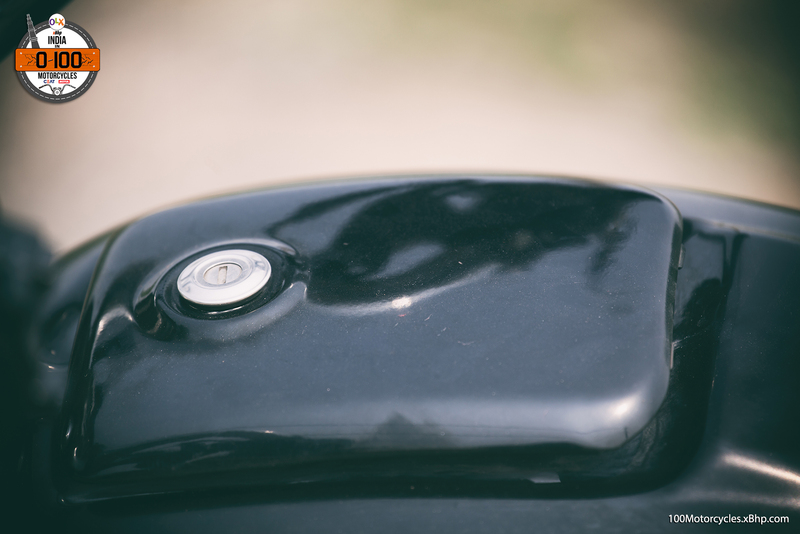 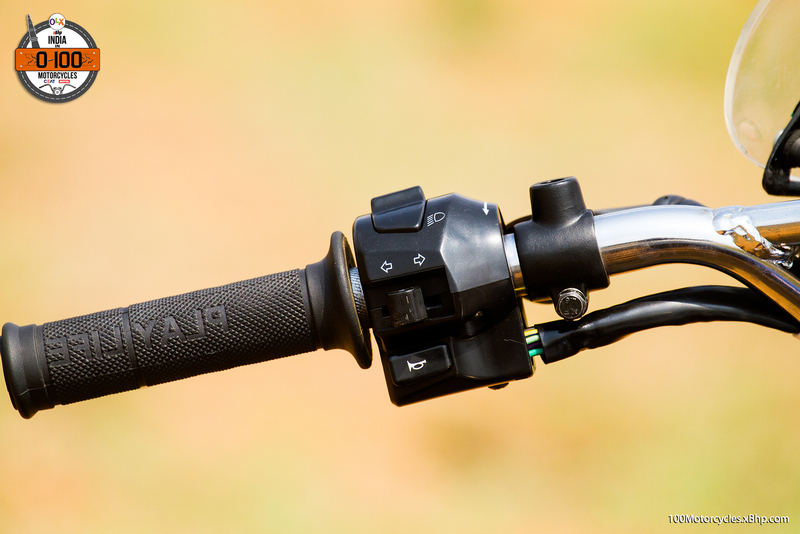 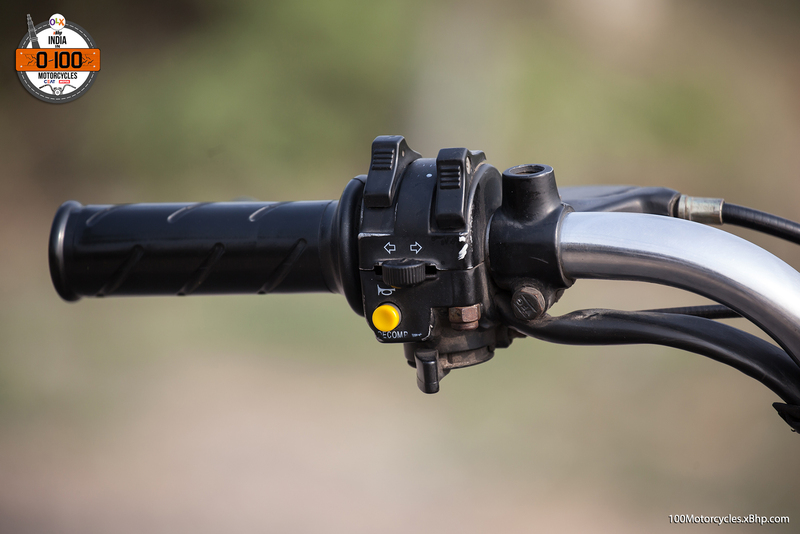 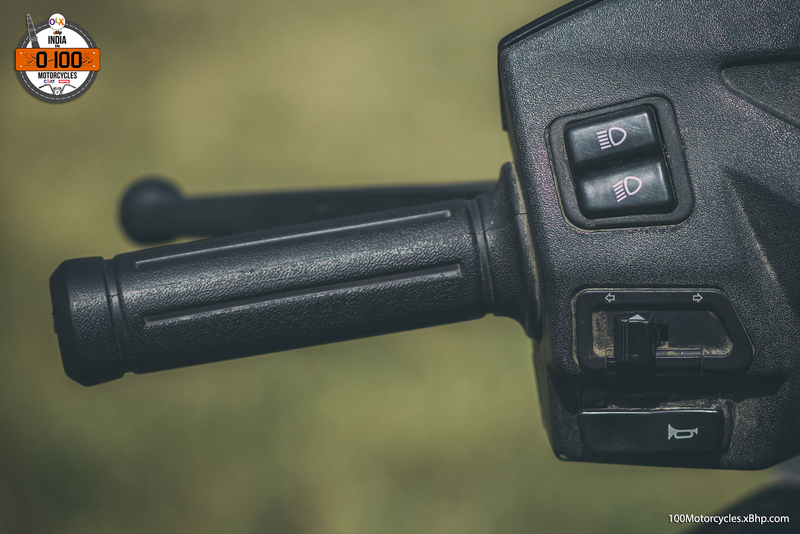 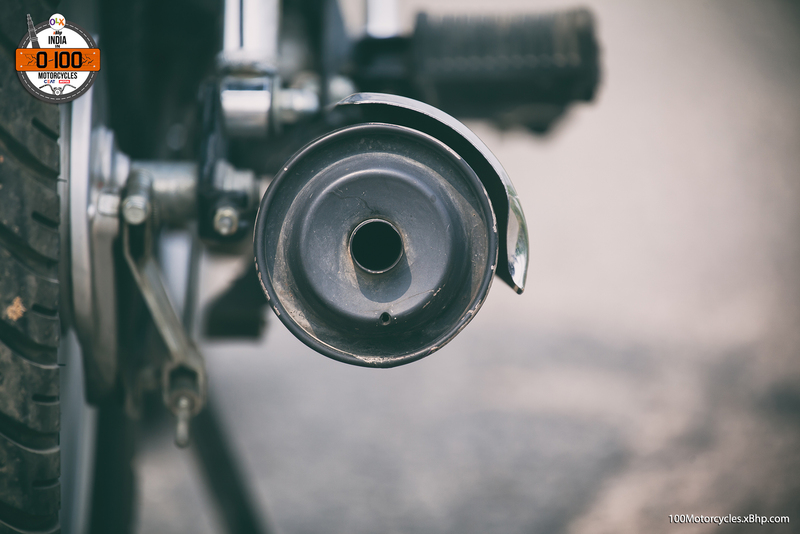 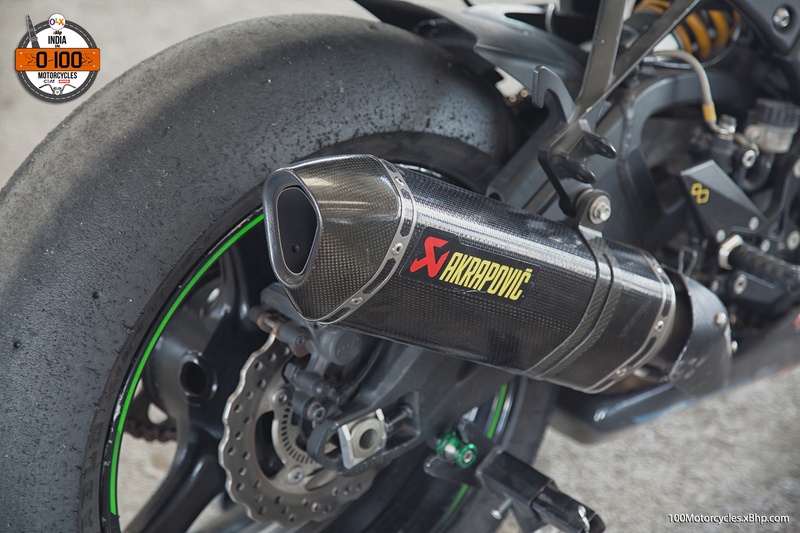 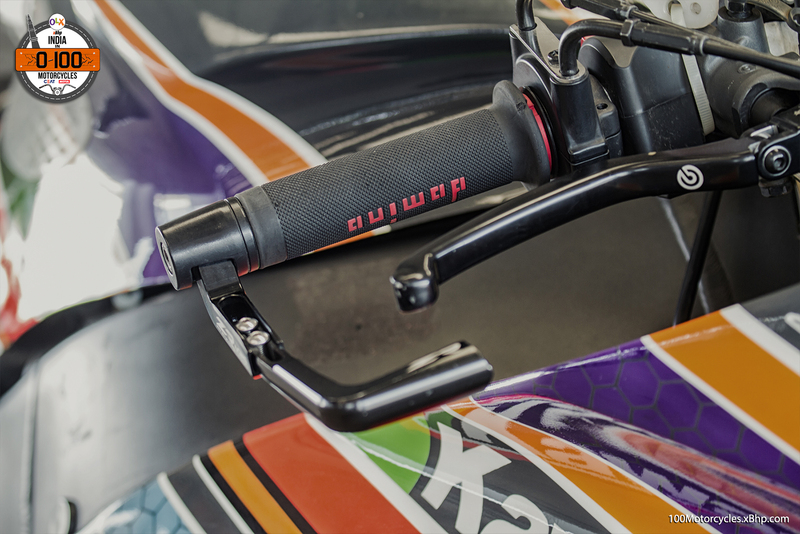 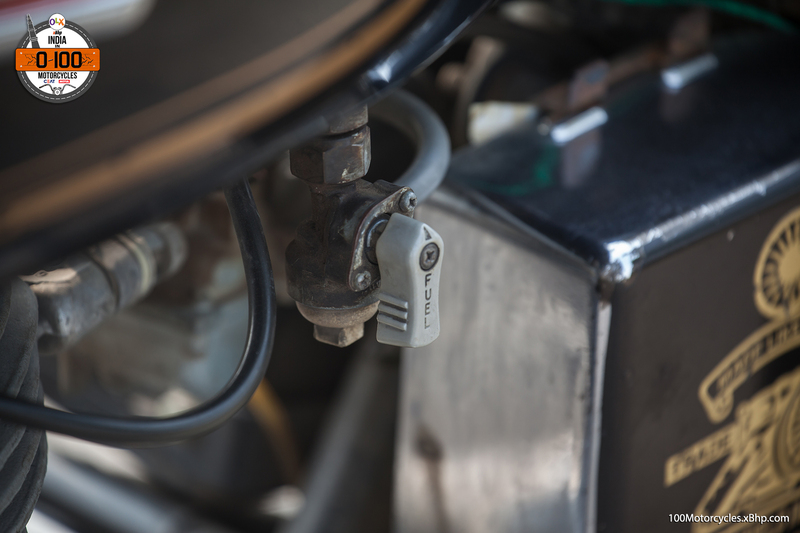 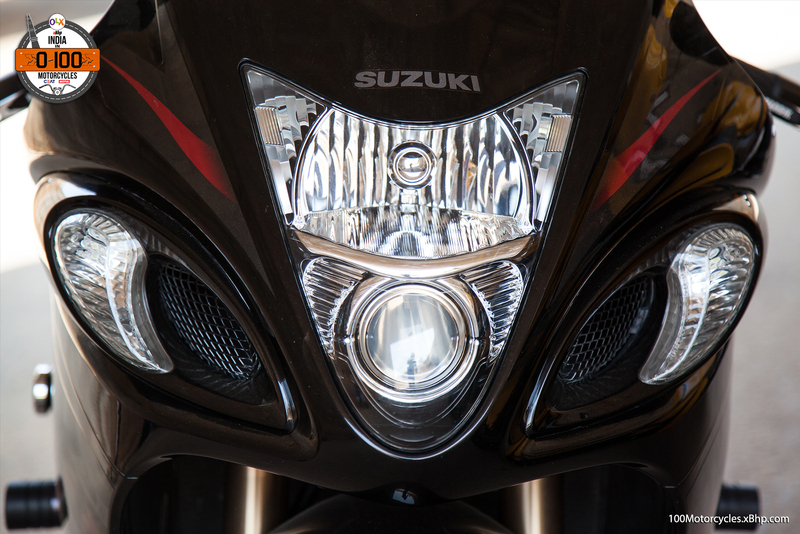 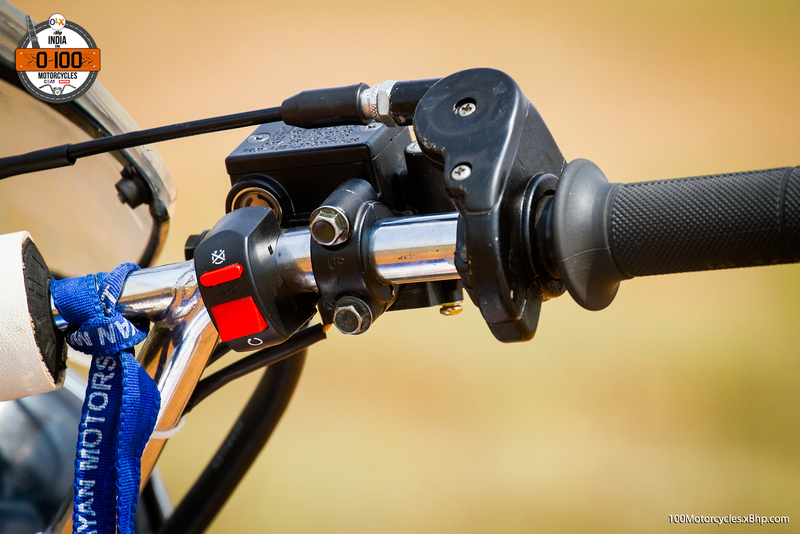 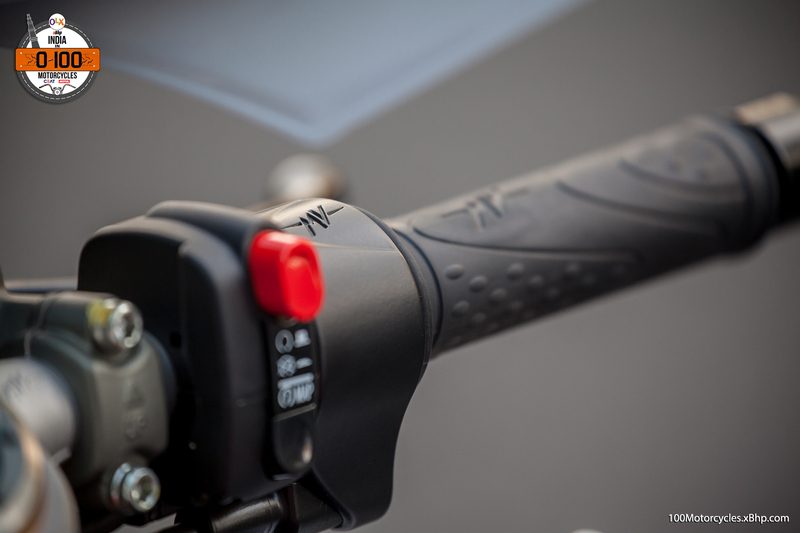 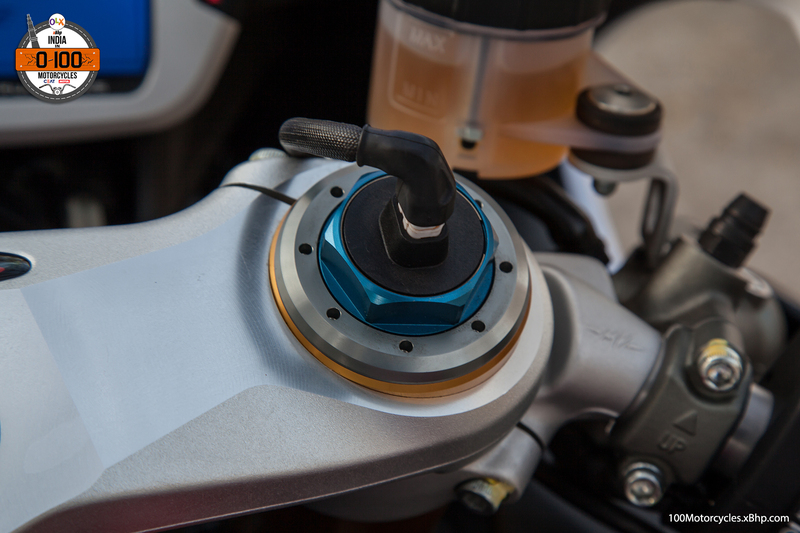 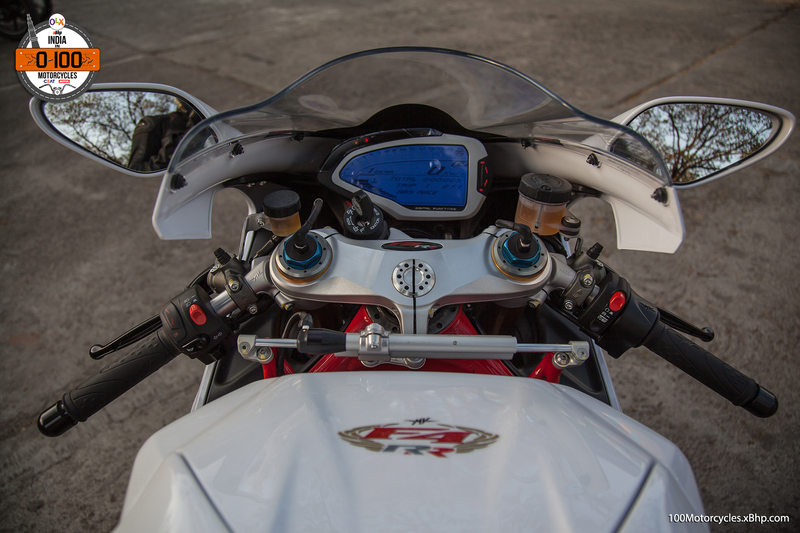 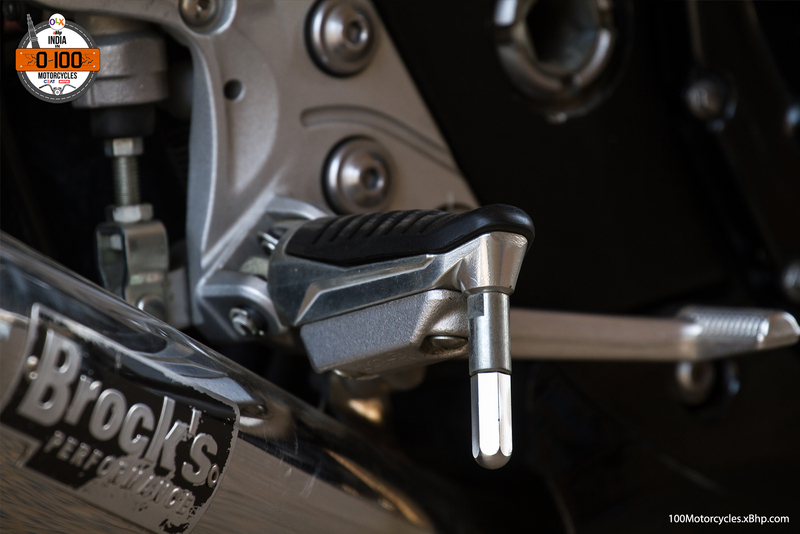 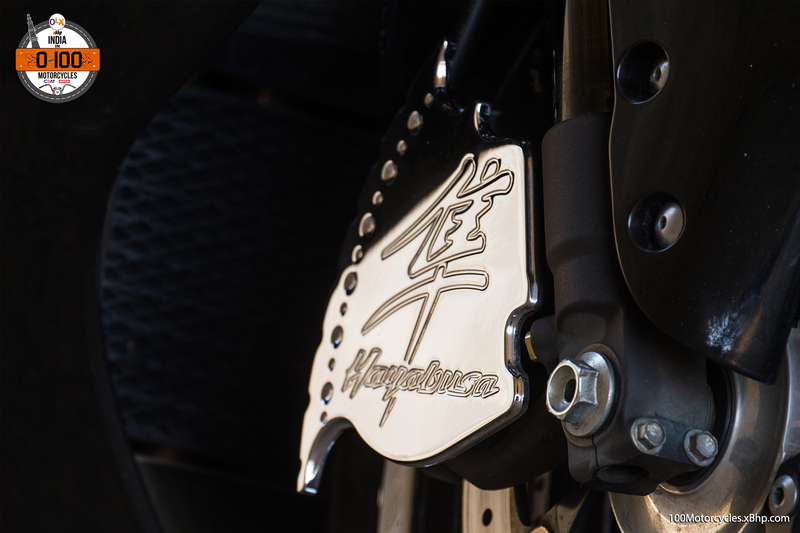 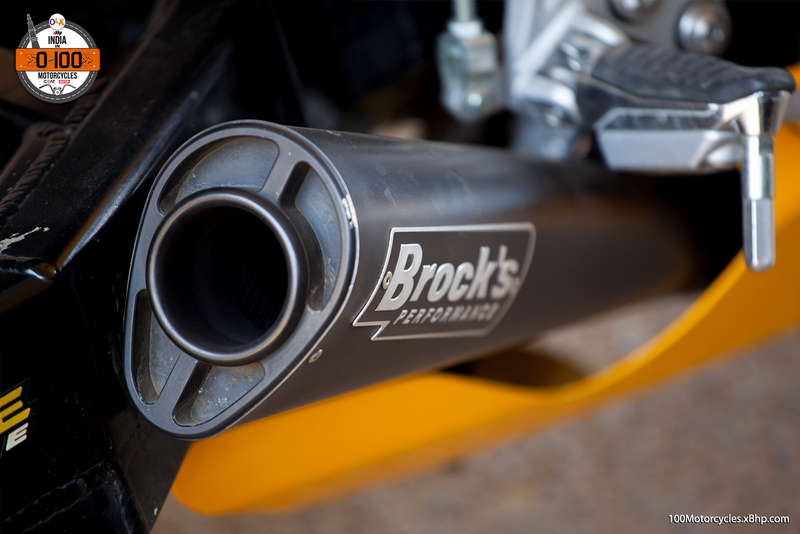 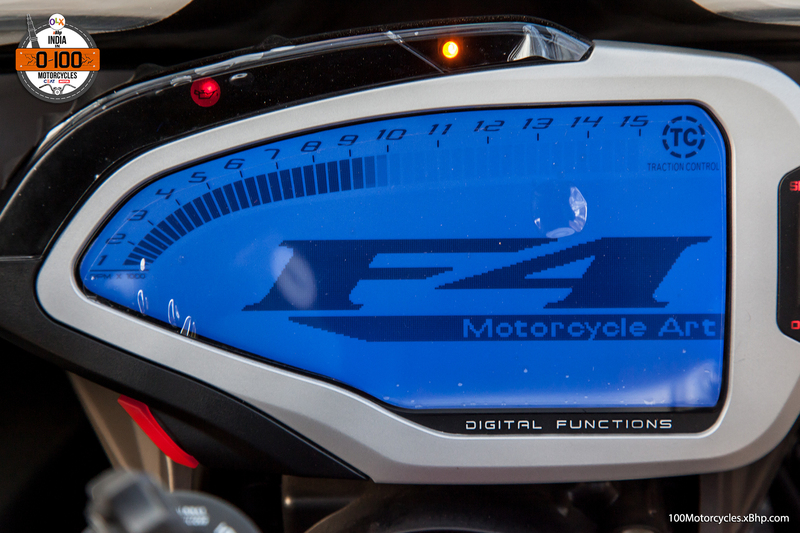 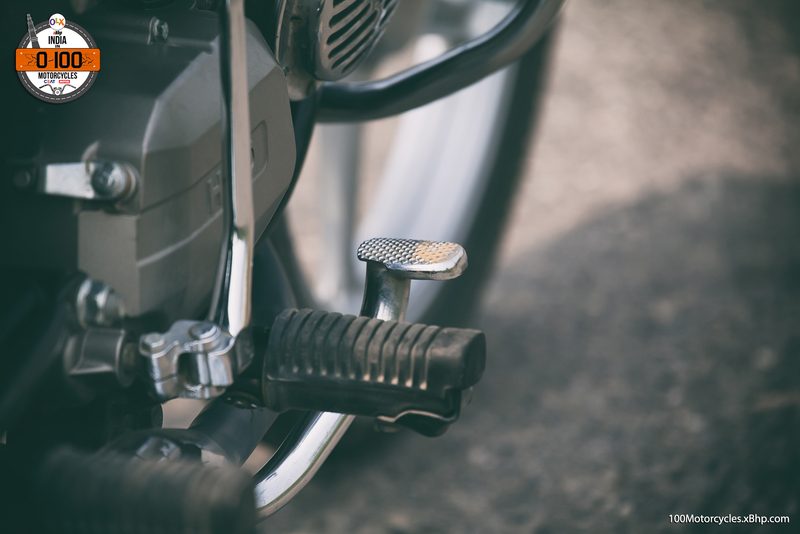 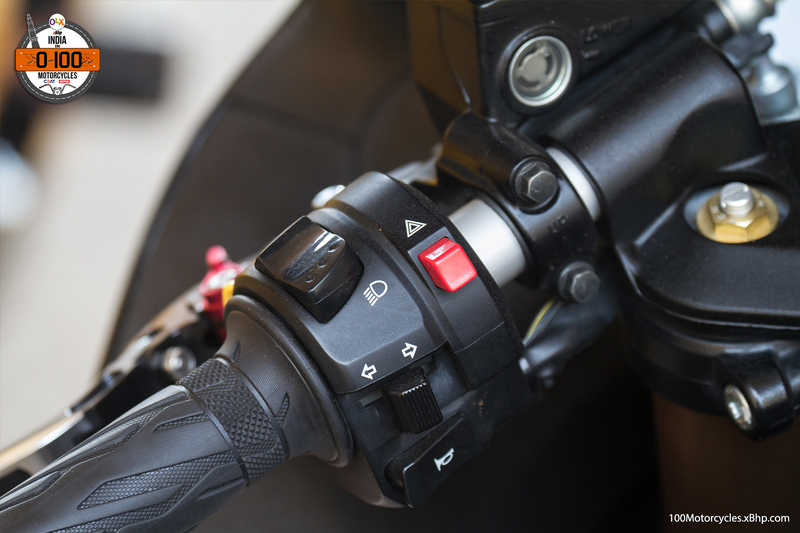 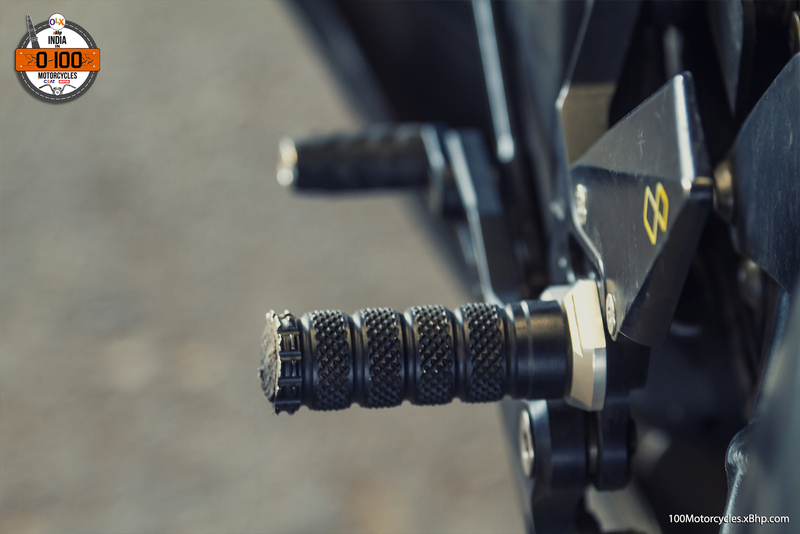 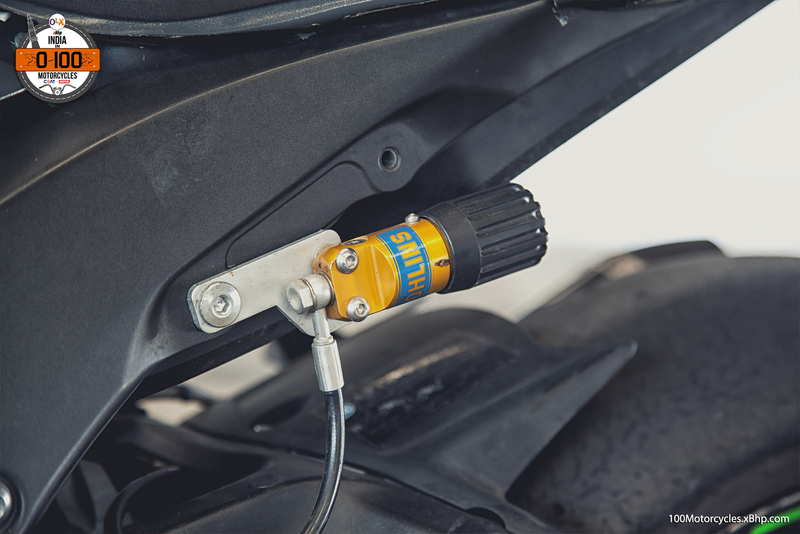 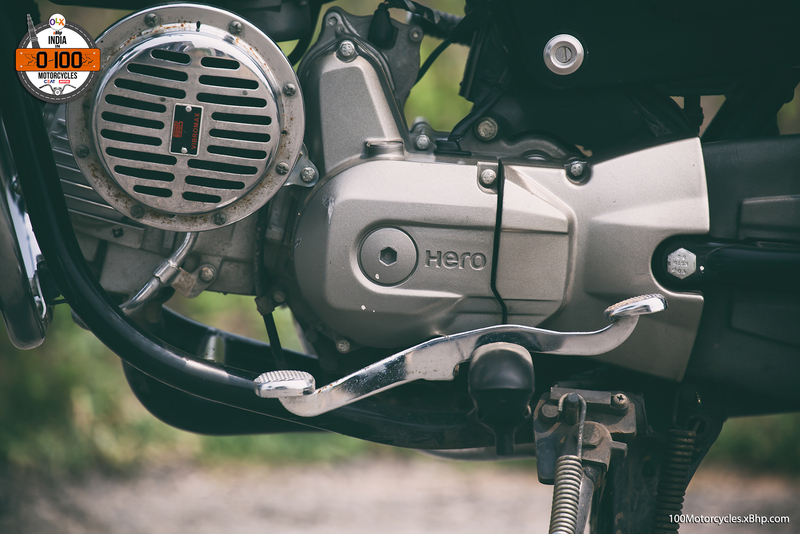 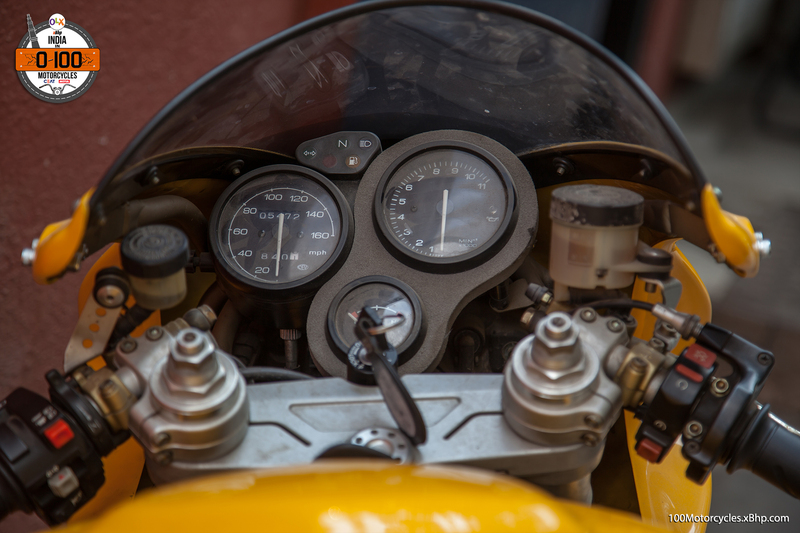 The system sports a fob that eliminates the need to use a key to fire up the bike. 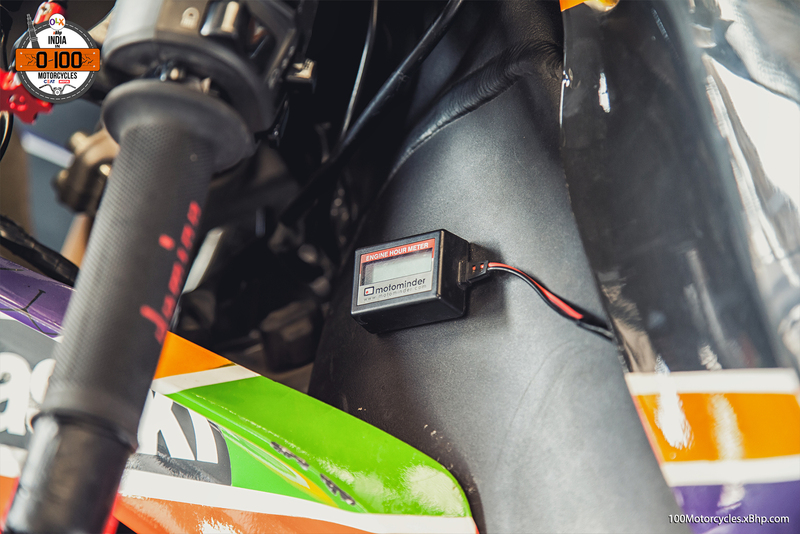 It just needs to be in your pocket when you are on the bike. 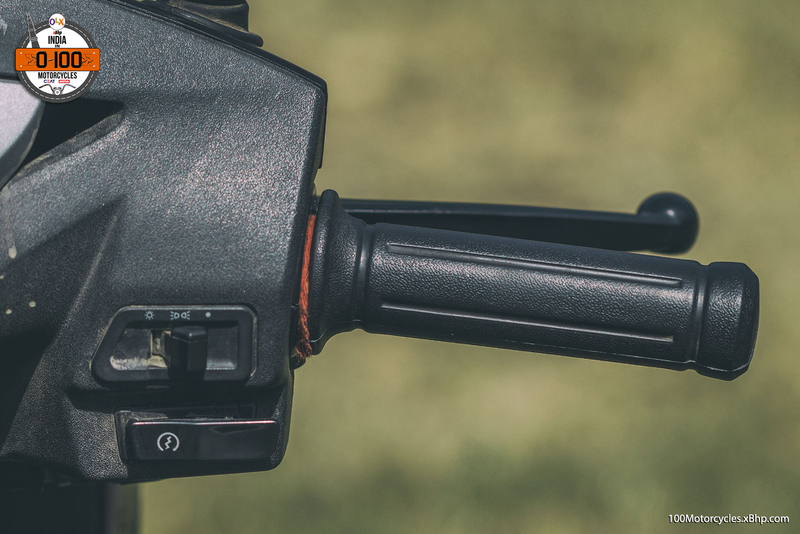 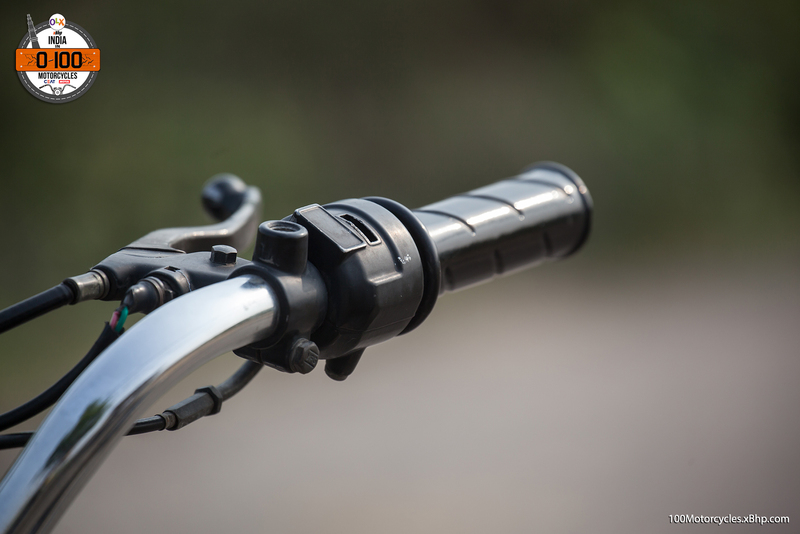 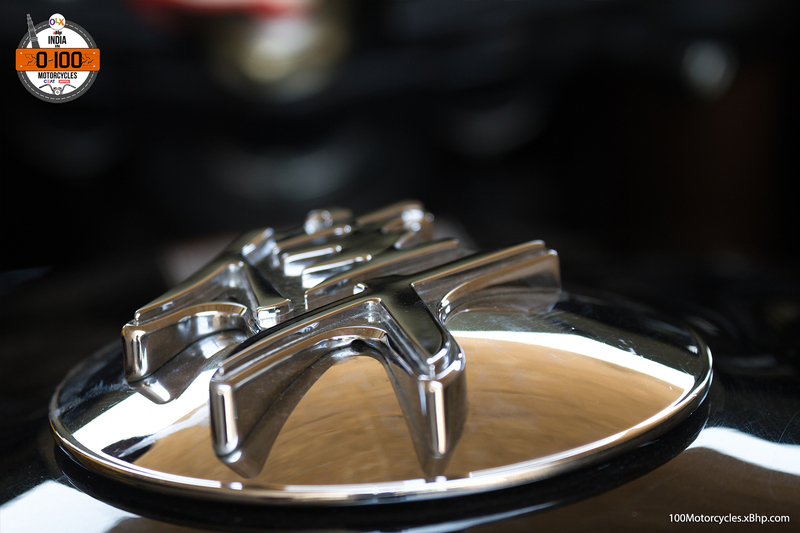 However, you still need an actual key-in-and-twist action to lock the handlebars. 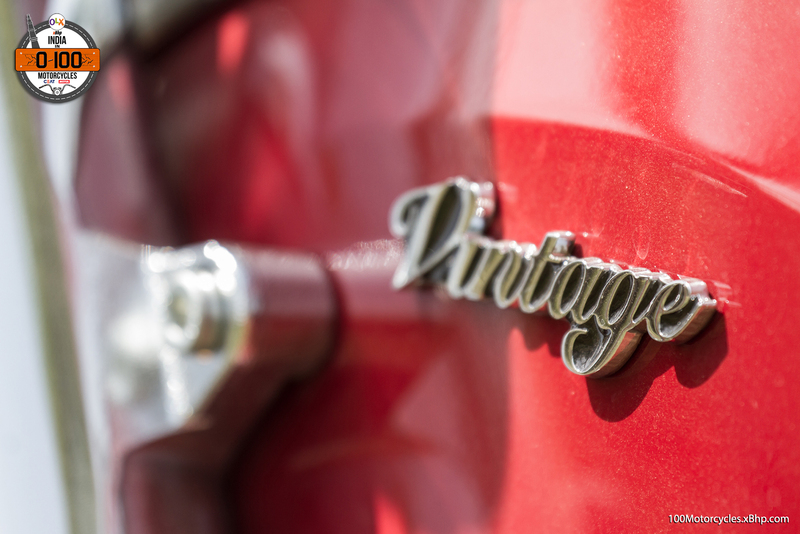 This paradox of old styling with high tech gadgetry doesn’t stop there. 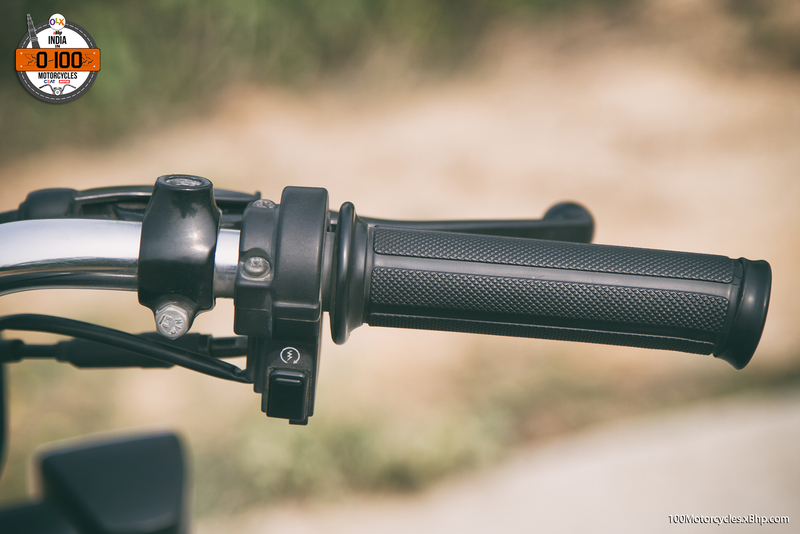 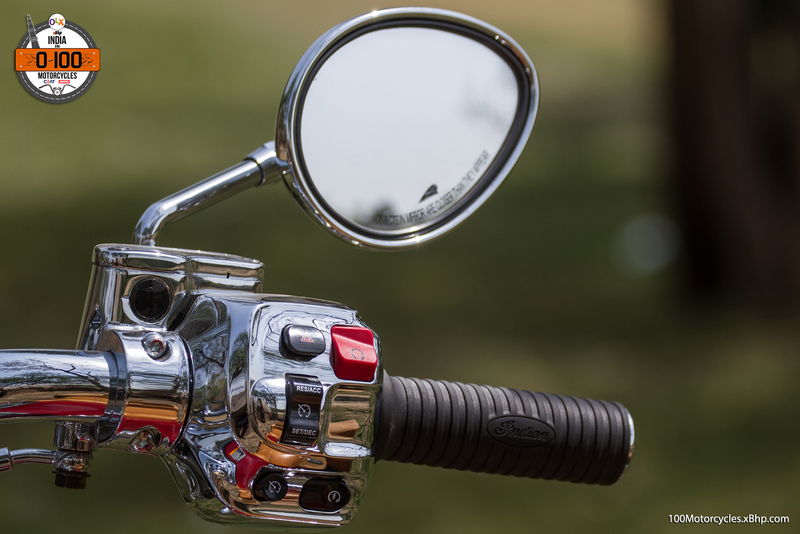 You have RbW (Ride by Wire) throttle, an option of chrome plated Bluetooth speakers (!) 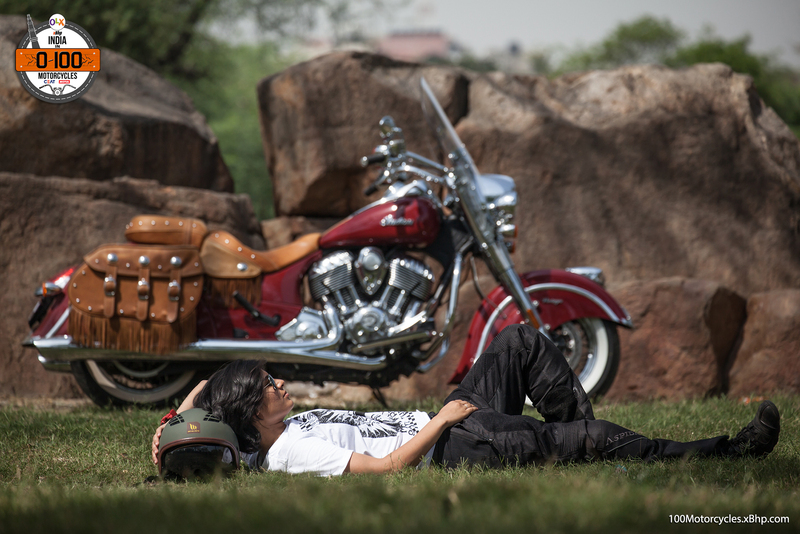 and ABS thrown in. 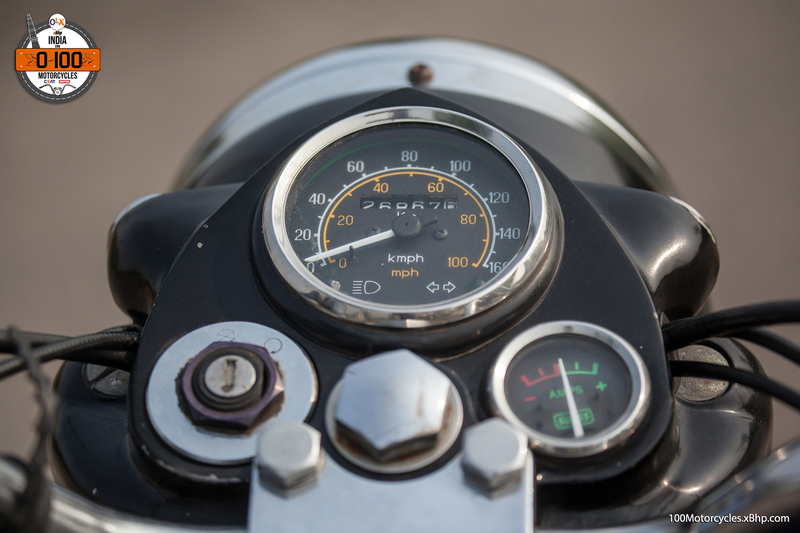 You also have cruise control. 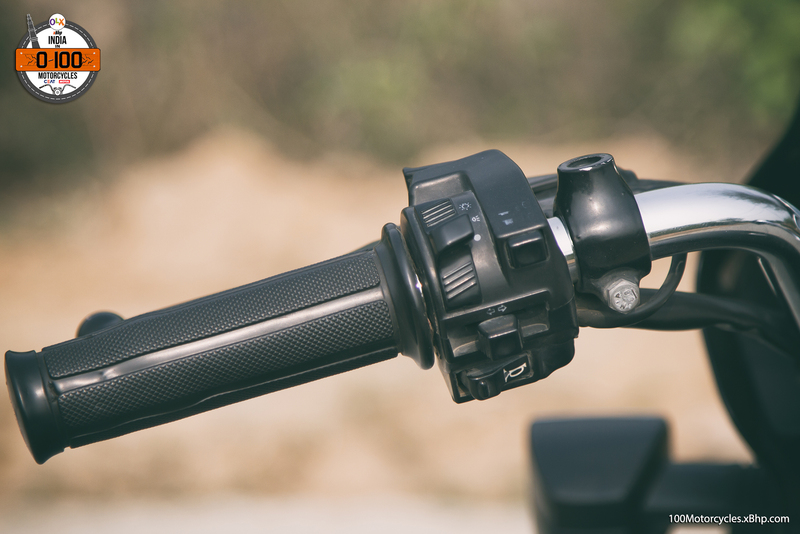 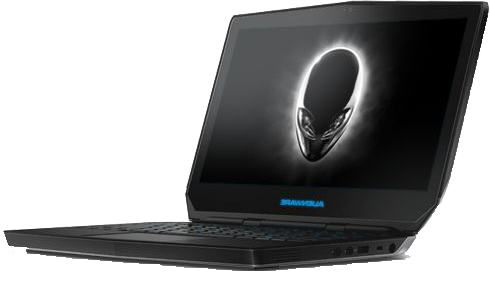 All this combined with simple and no-frill things like click-lock windscreen that is easily detachable. 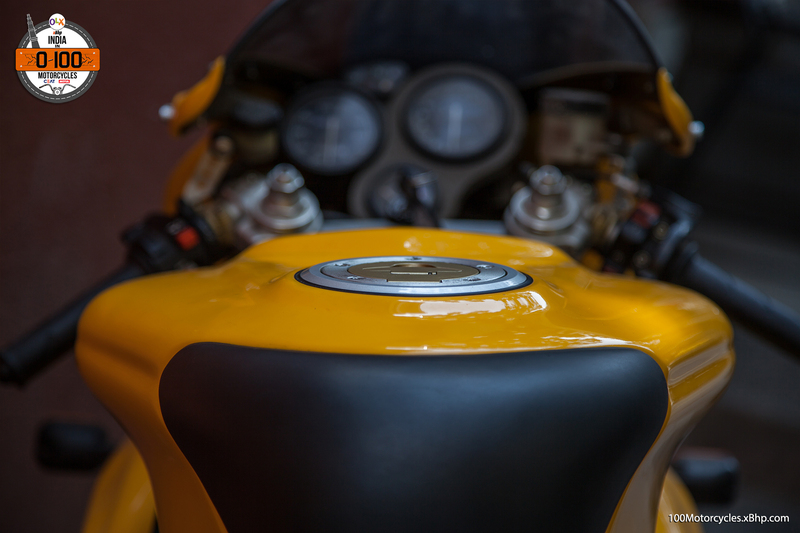 And that is the moment you take a couple of steps back and have a look at the bike again in its entirety. 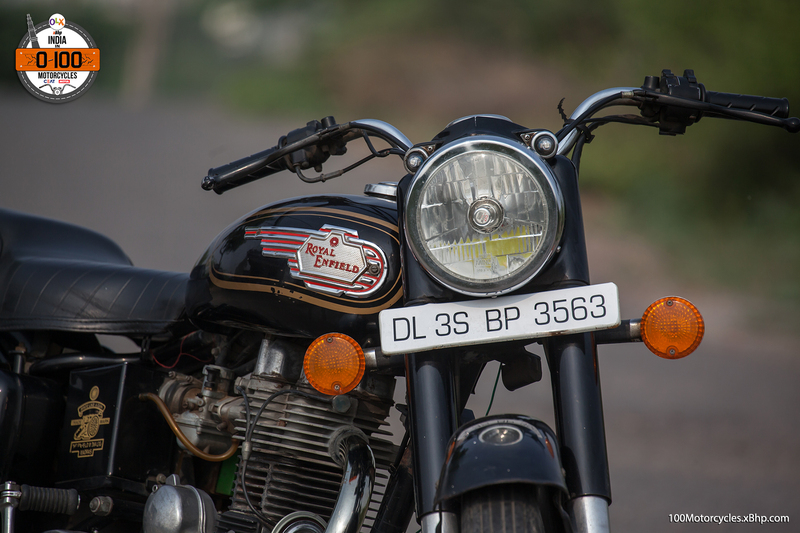 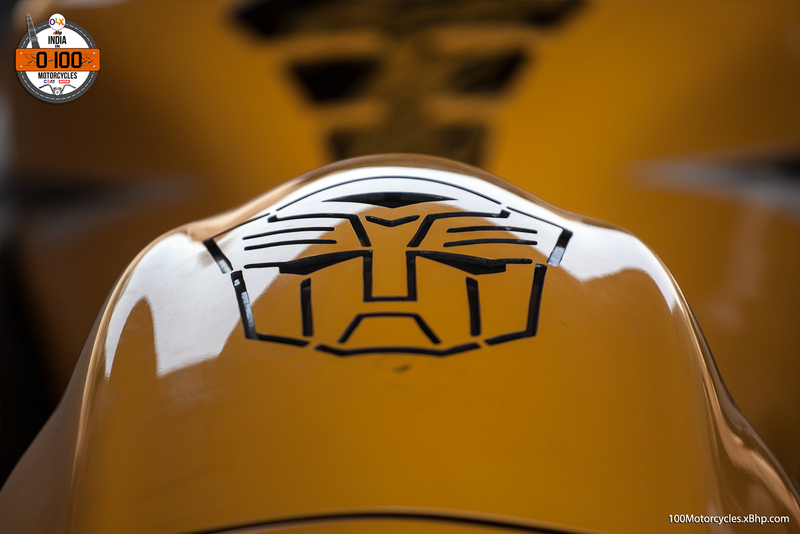 Then you realize that there is a lot more to the bike than just an attempt to revive a great brand. 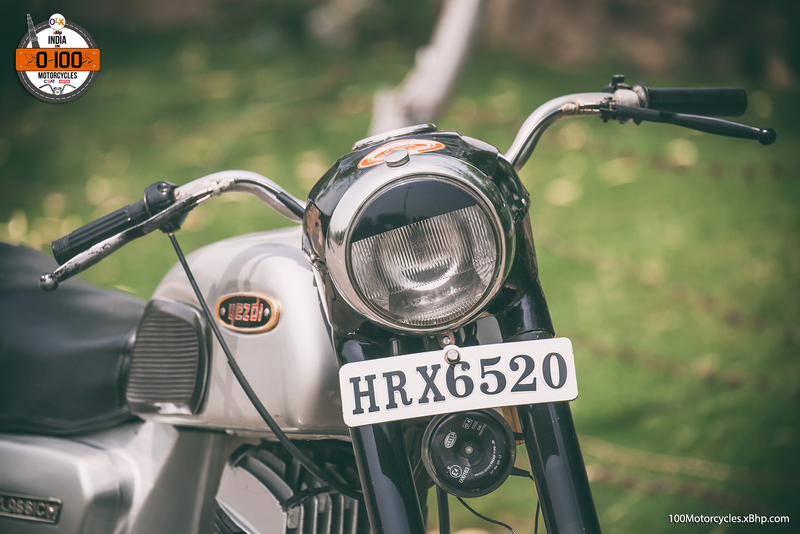 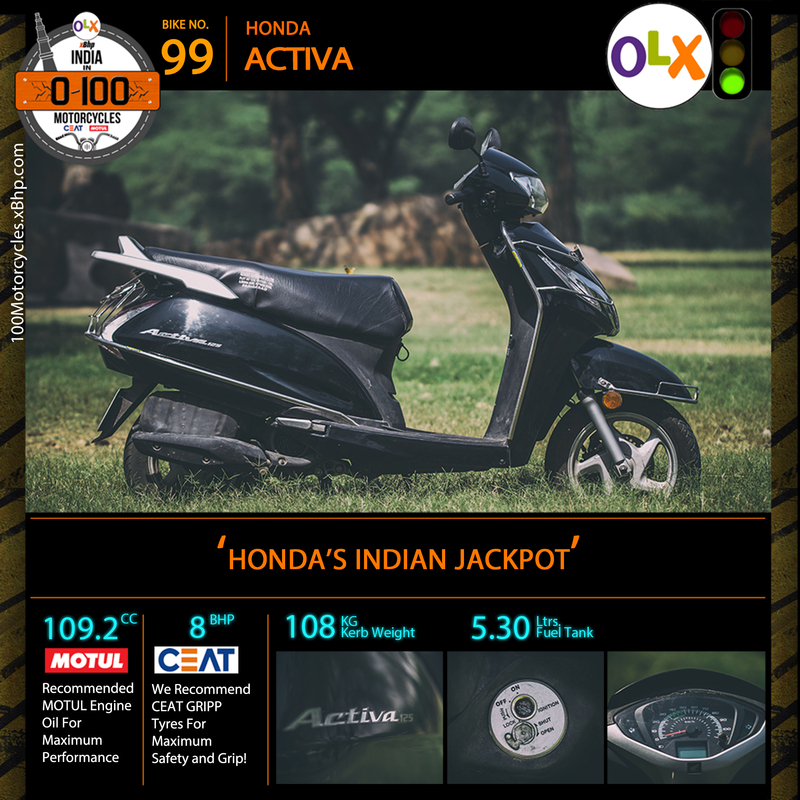 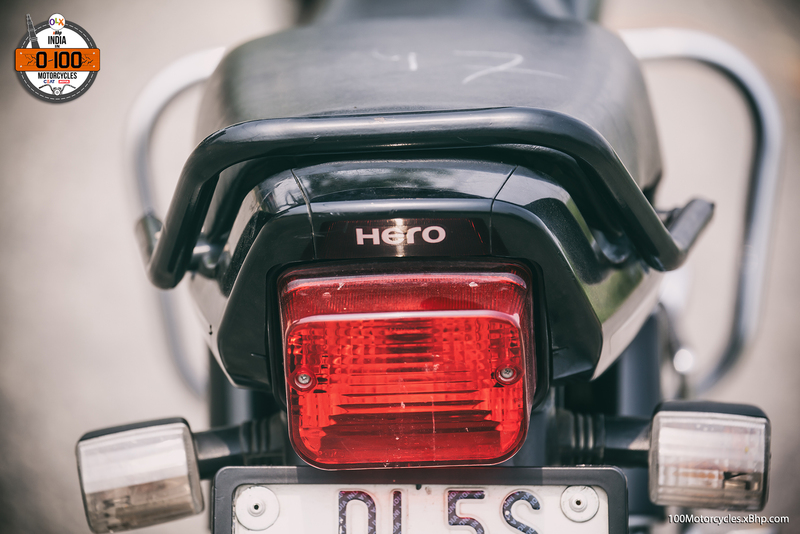 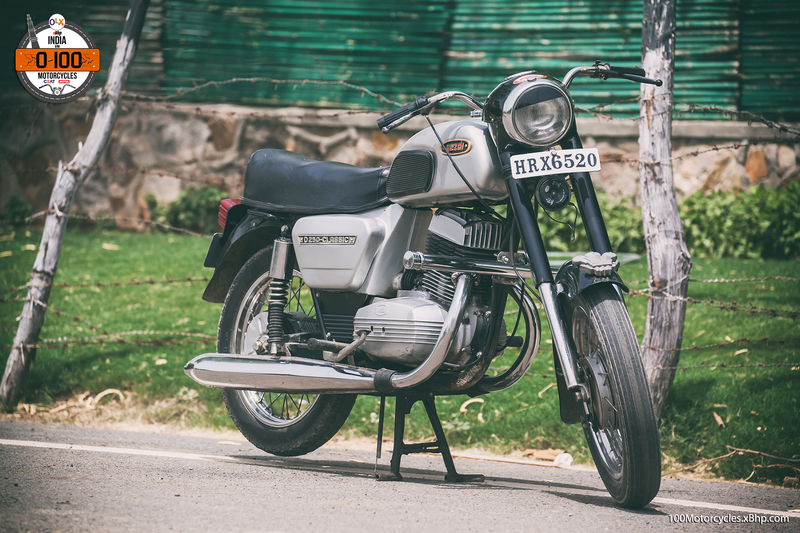 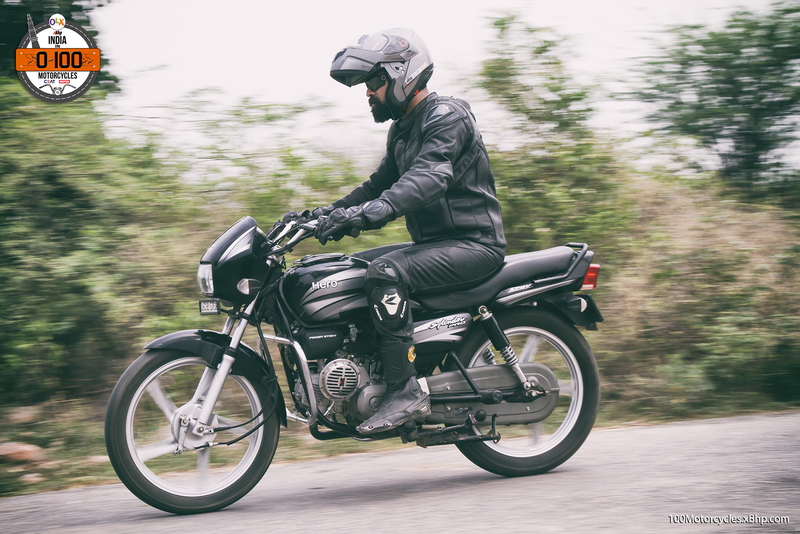 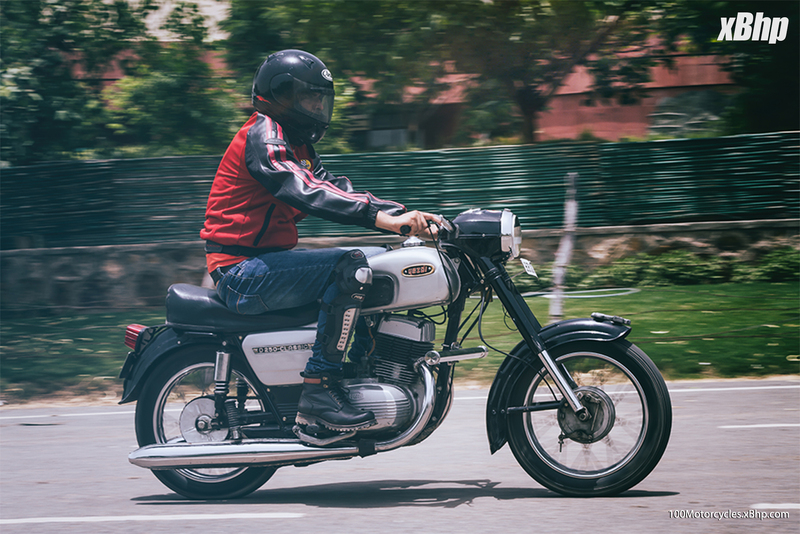 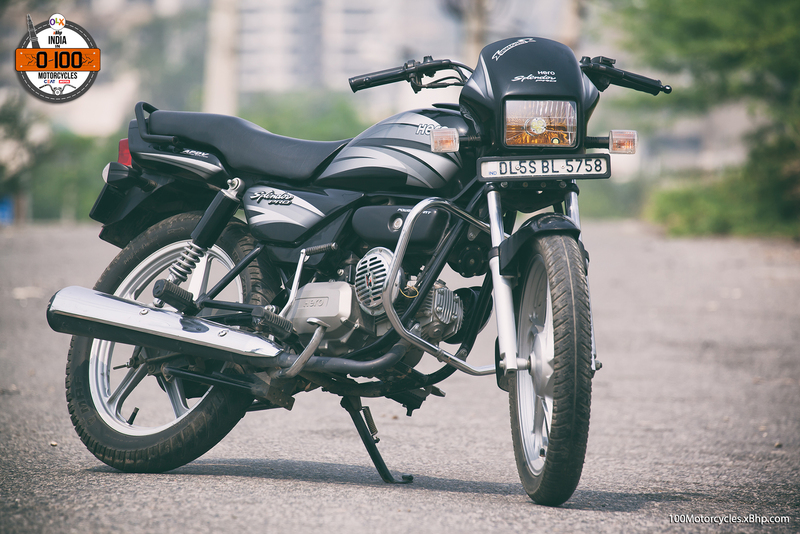 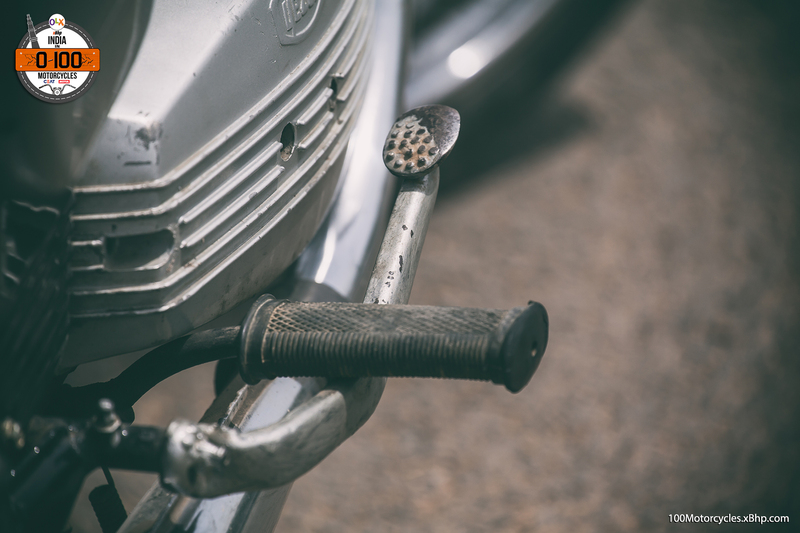 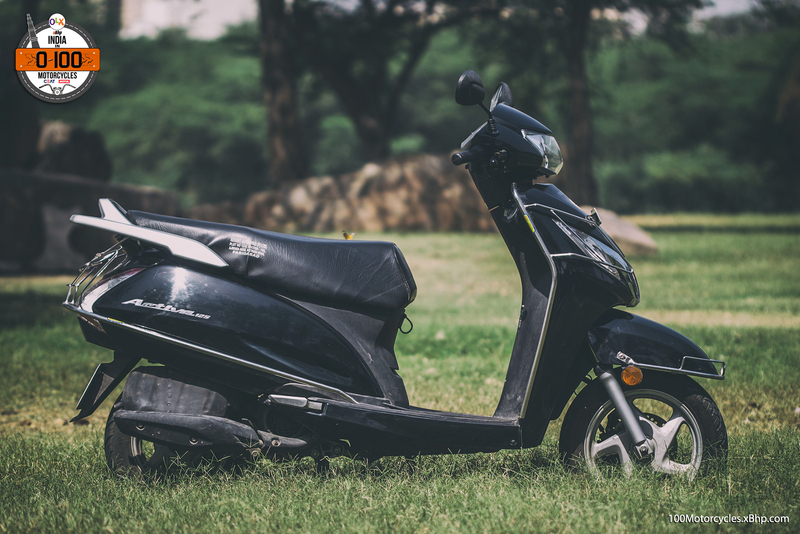 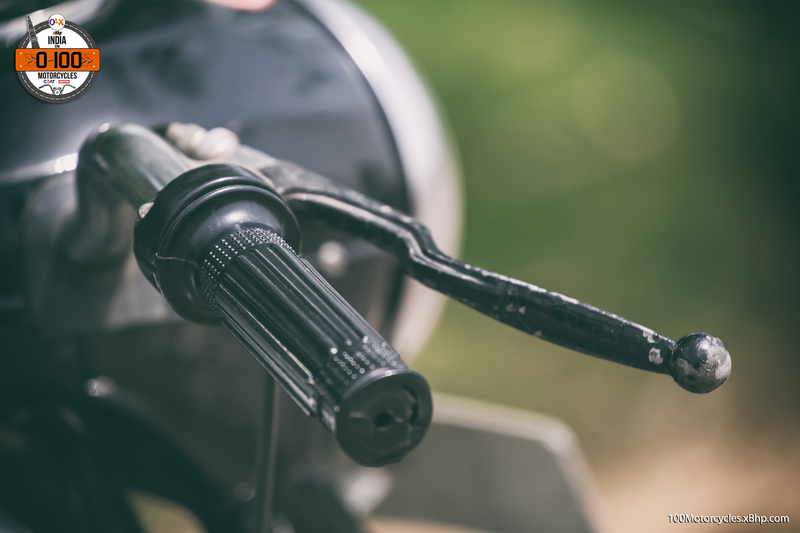 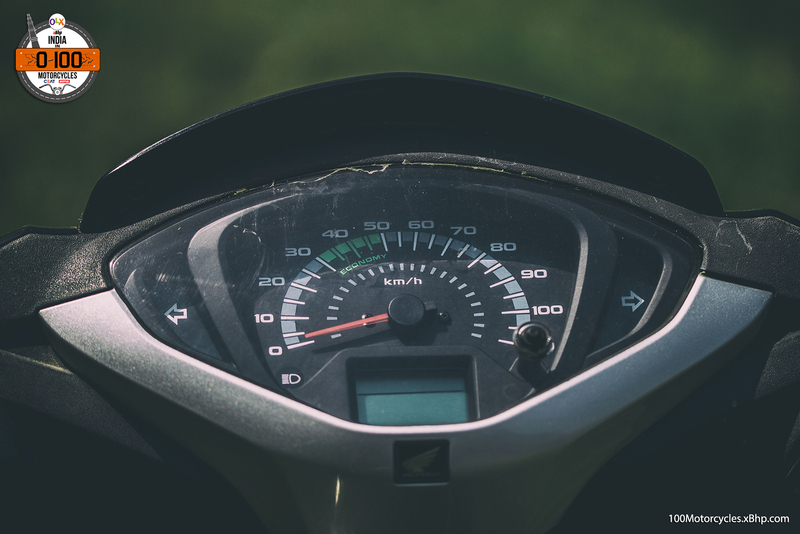 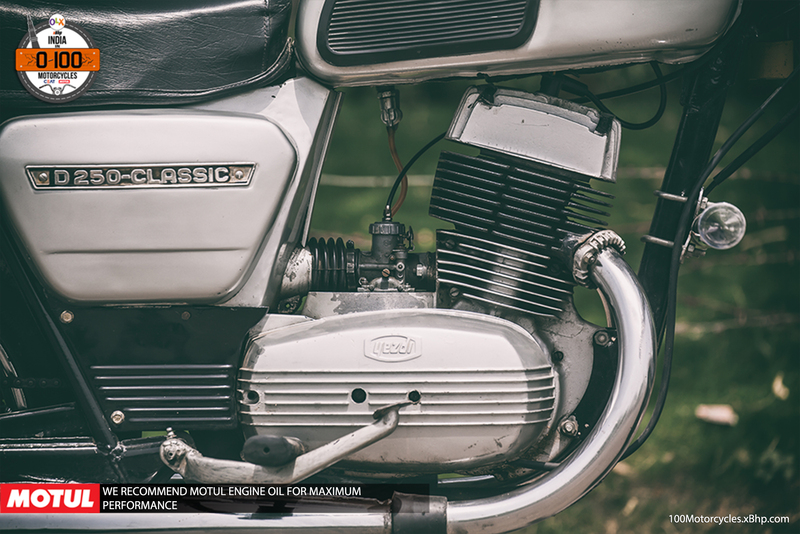 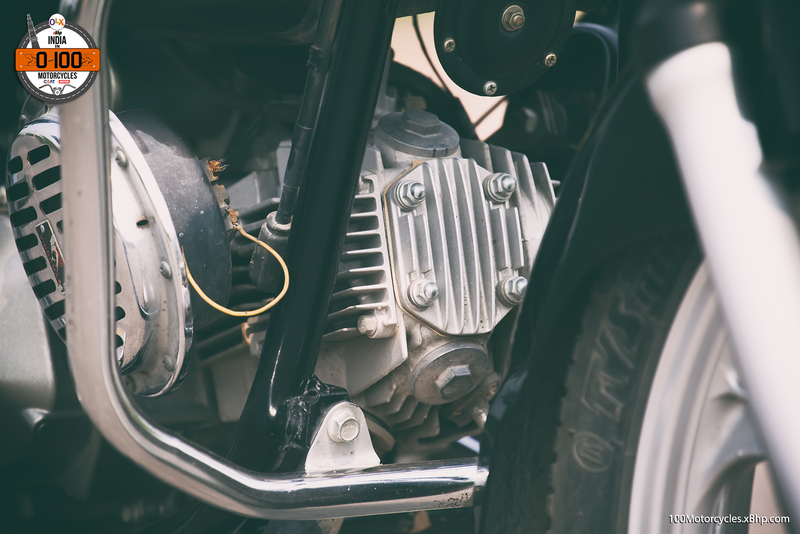 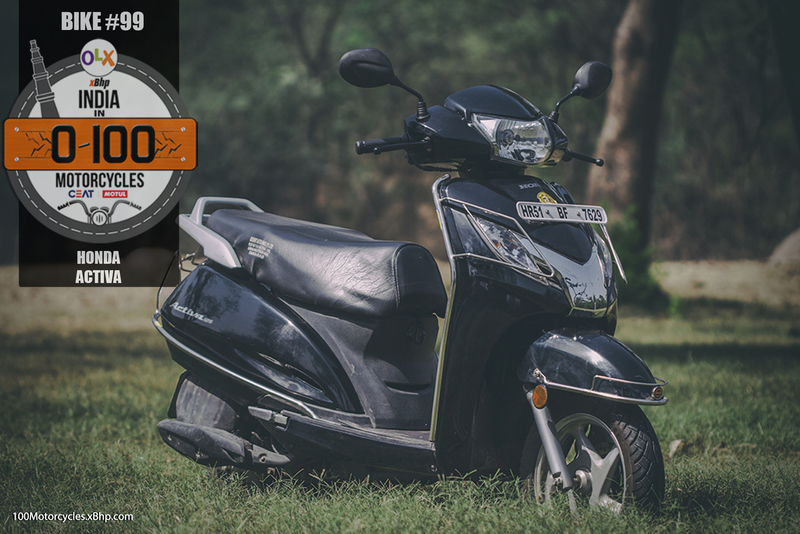 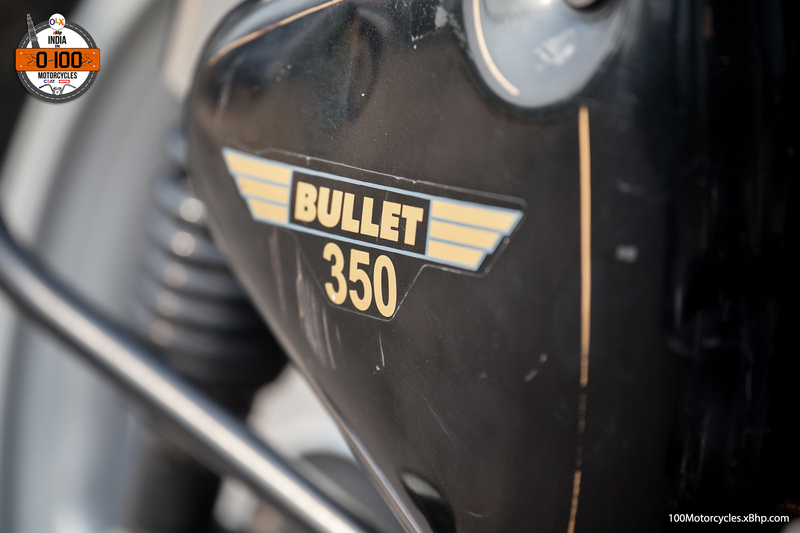 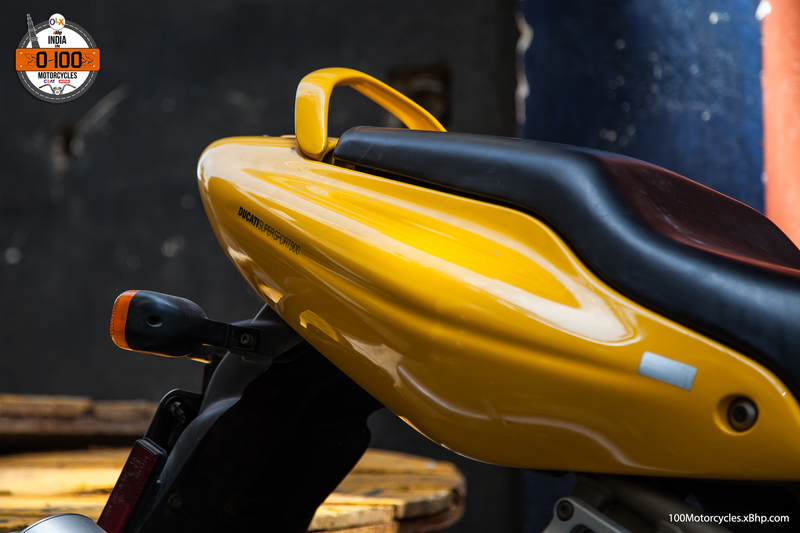 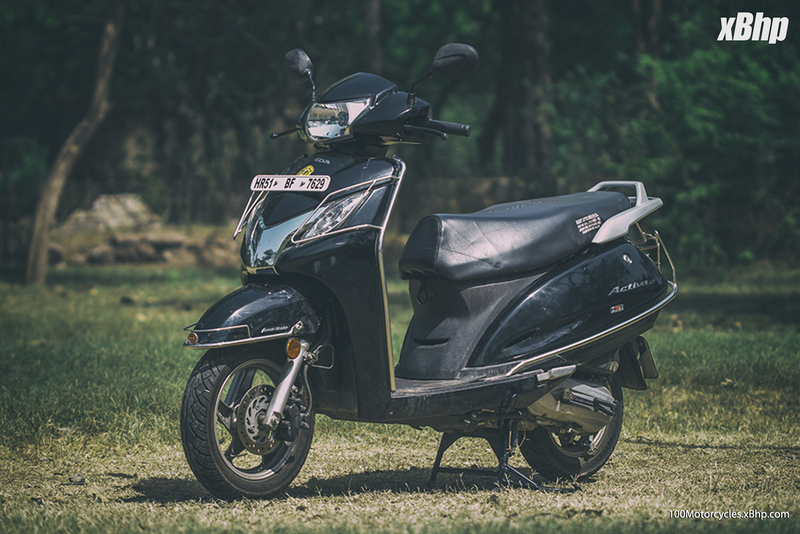 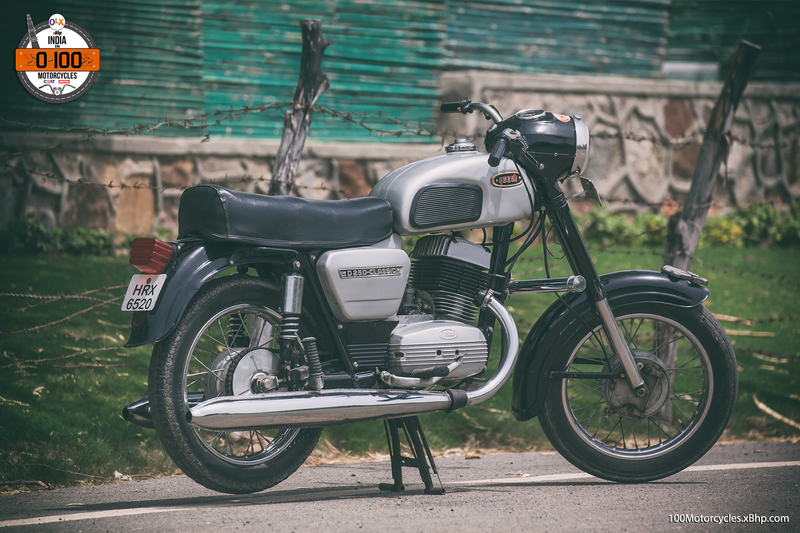 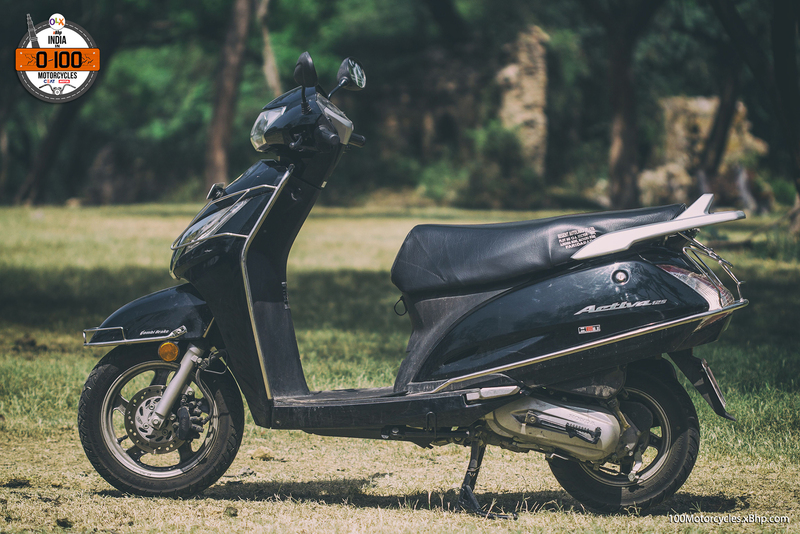 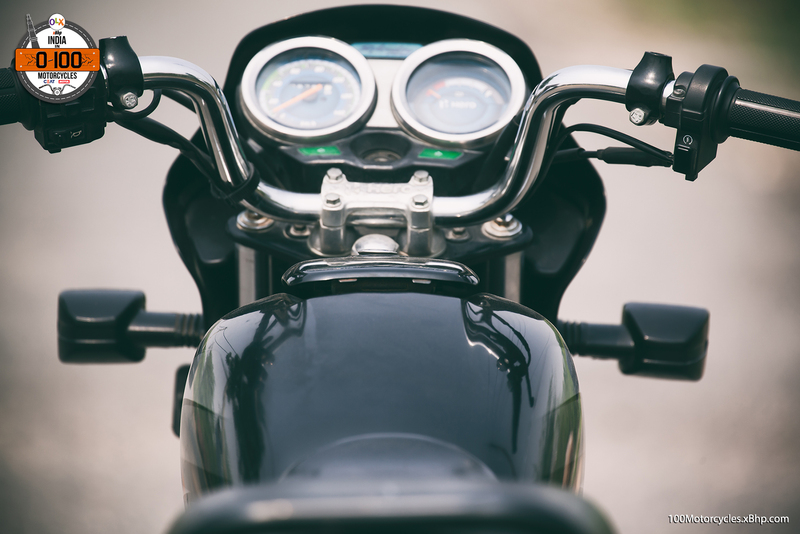 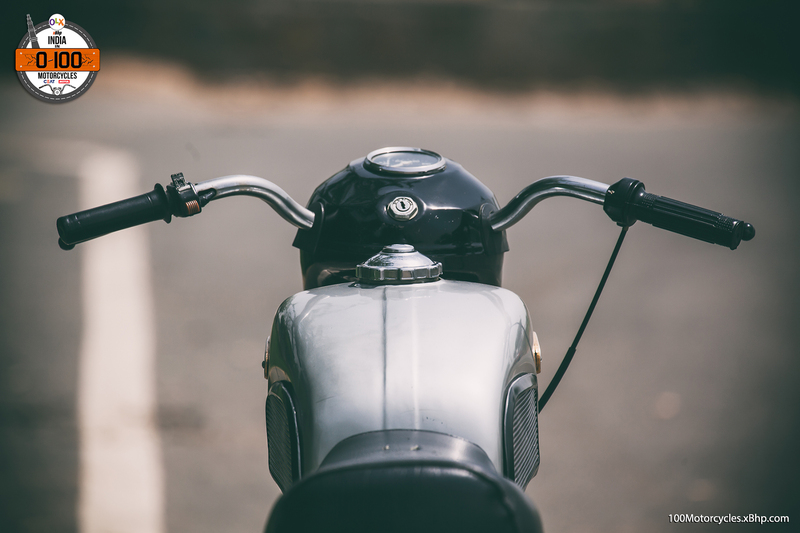 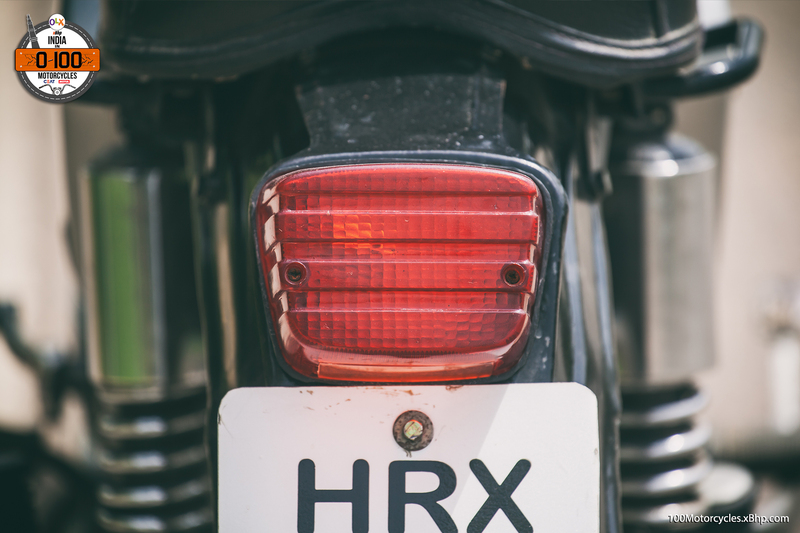 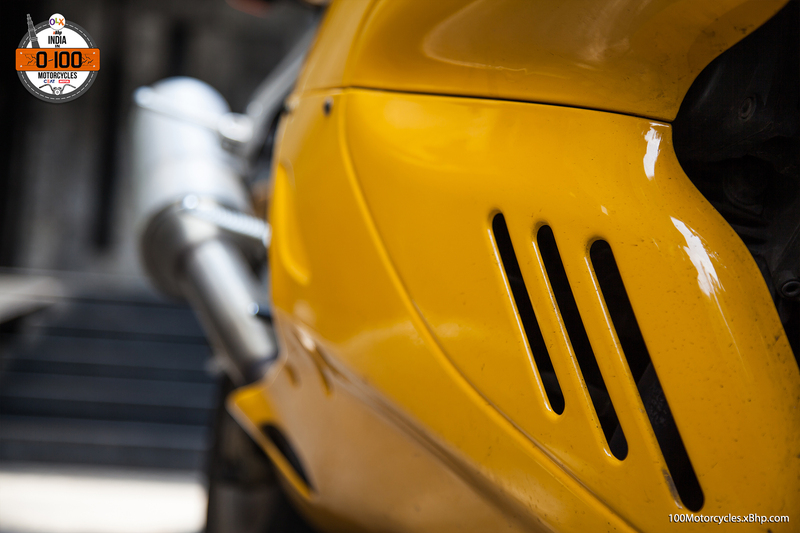 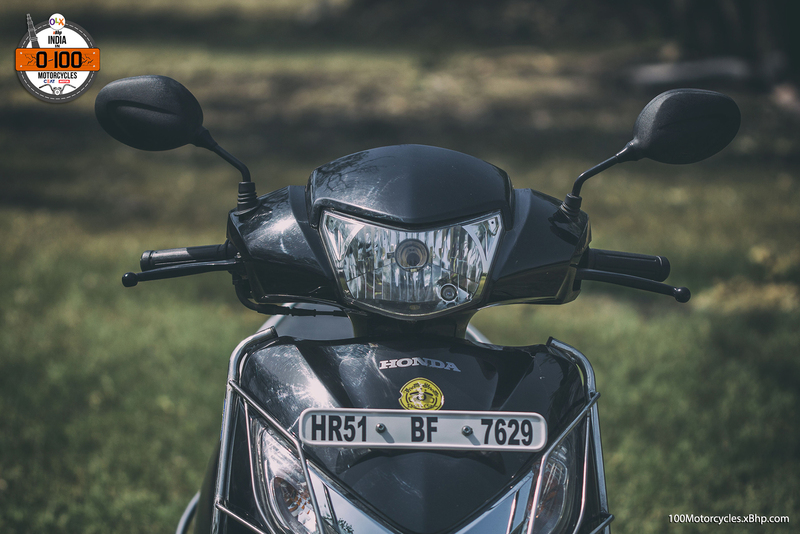 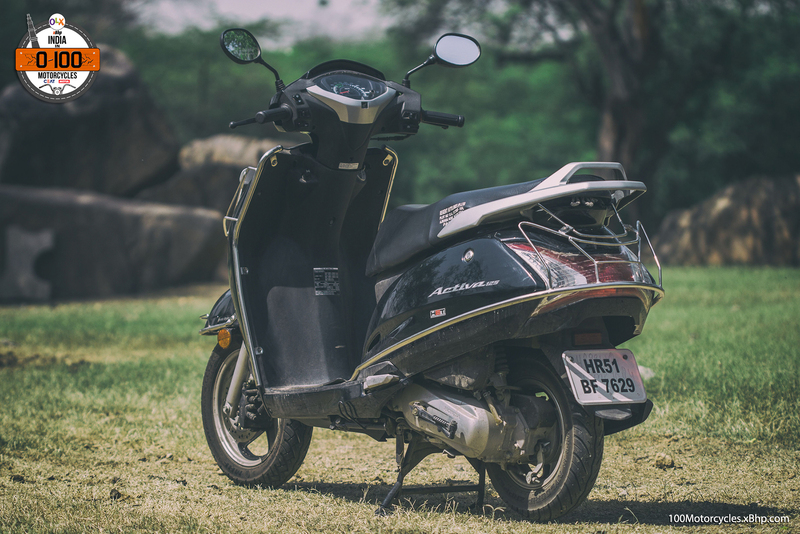 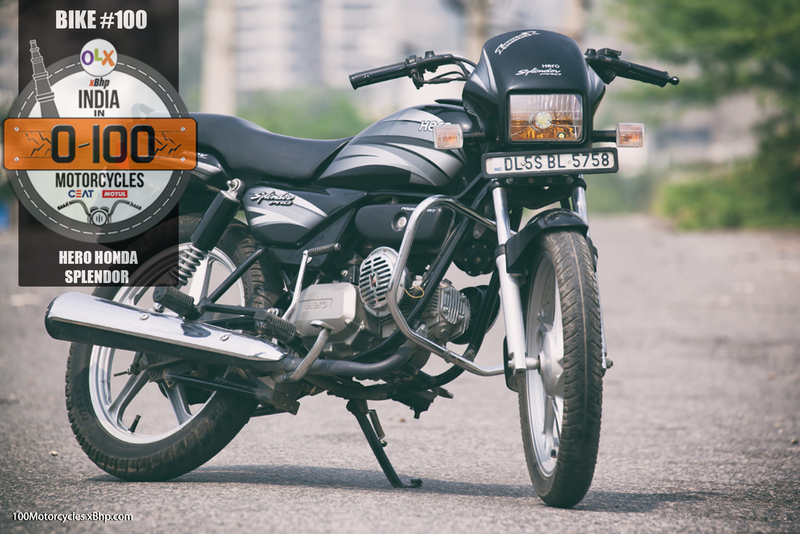 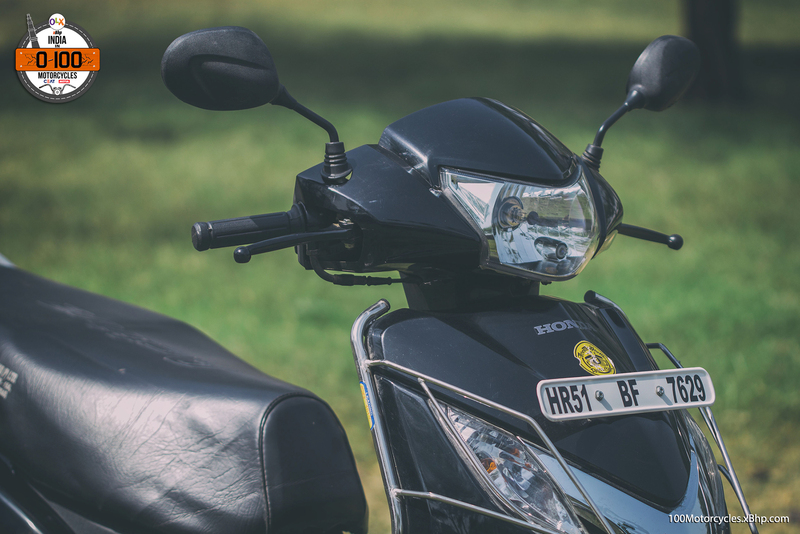 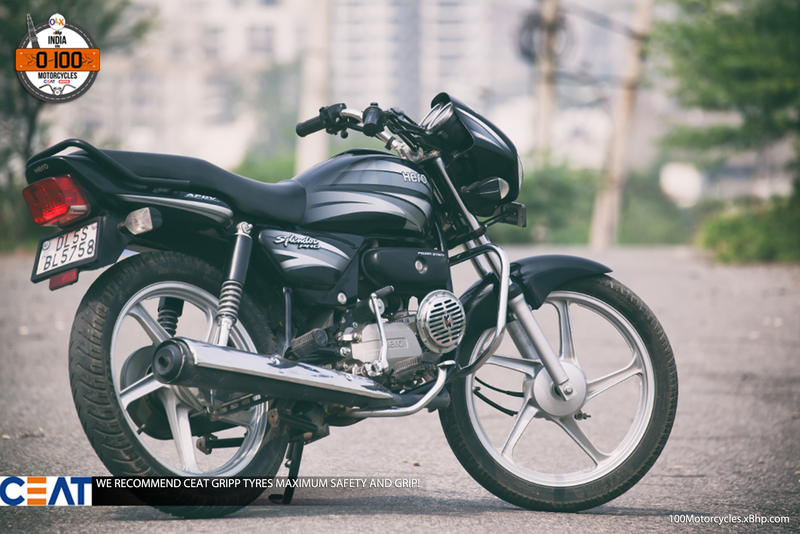 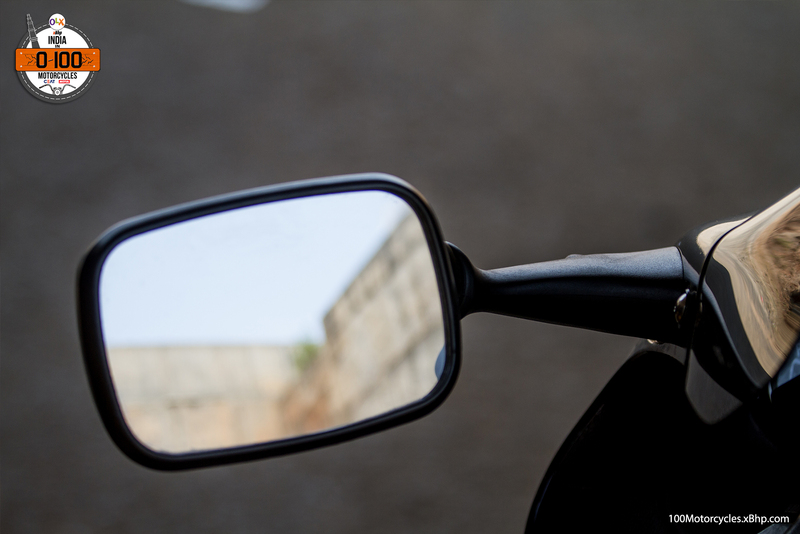 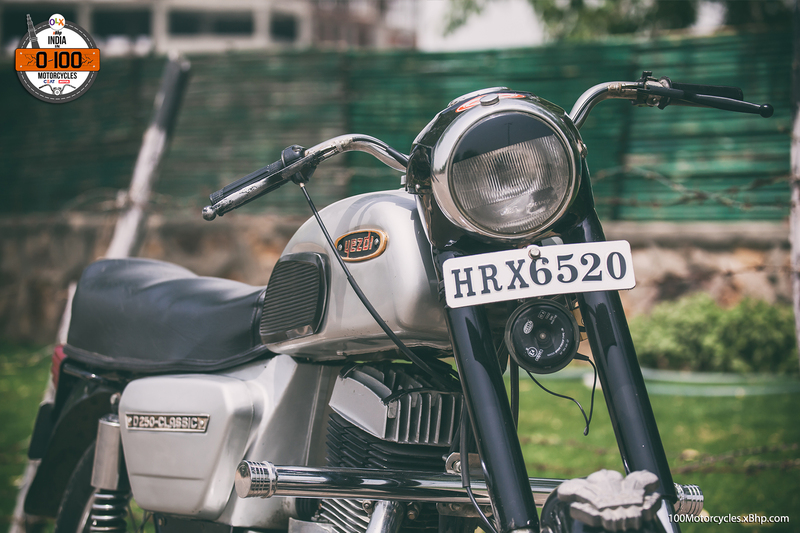 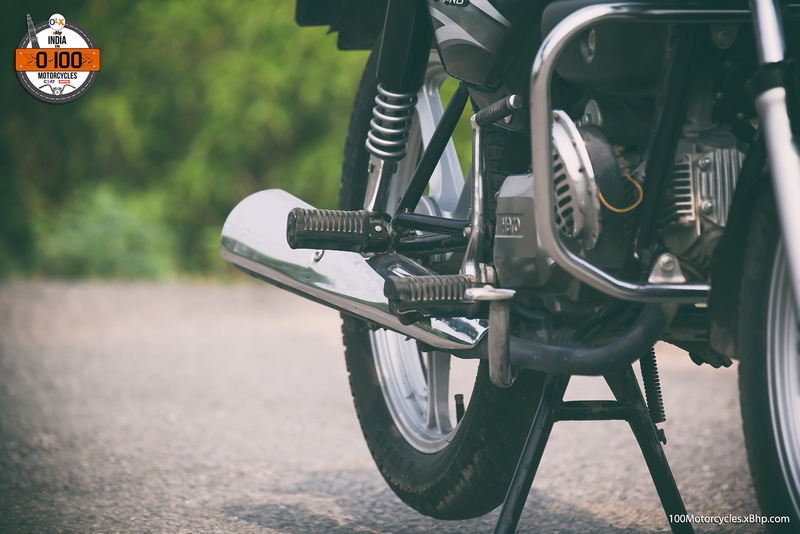 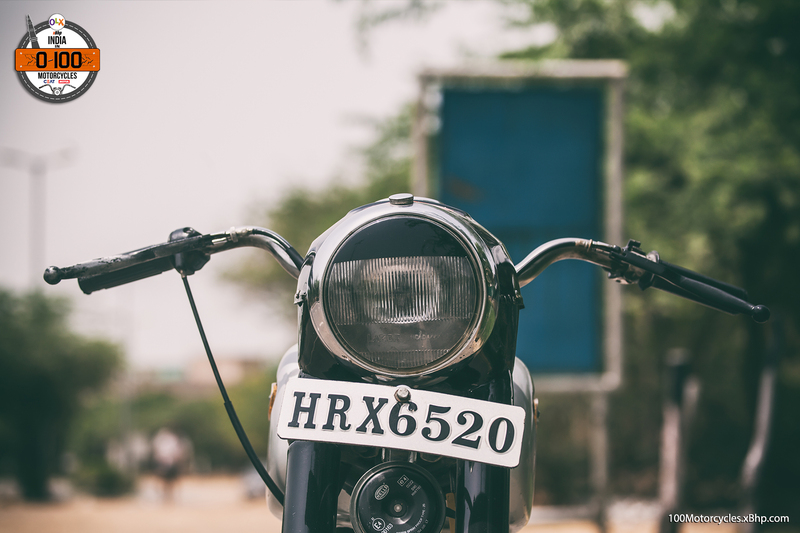 It is actually a motorcycle that you would love to have in your garage and take it out on special occasions, or maybe even daily once you get addicted to the turning heads and the curious questions on red lights and cafes. 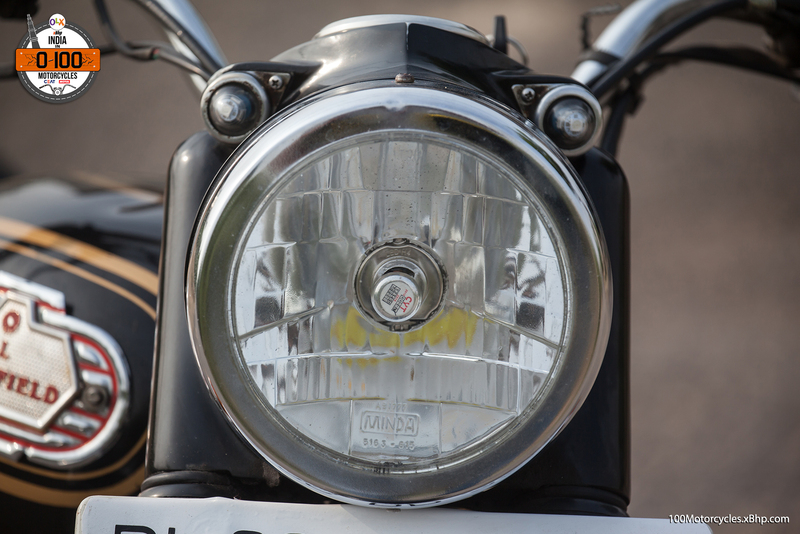 “Is it a production motorcycle?”, “That looks beautiful, is it available for sale in showrooms?” et al. 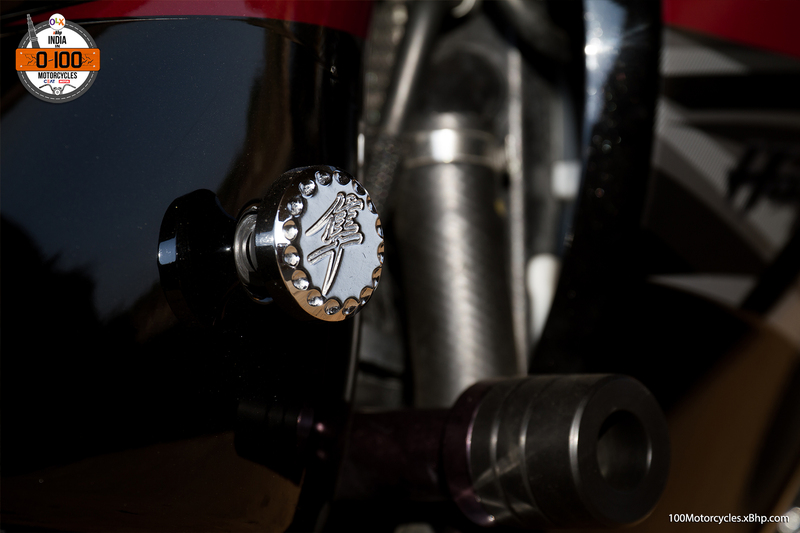 The heart of this piece of art is the 1811cc ‘Thunderstroke’ engine pumping out 139 Nm of torque to push the 388 kg chrome on its way. 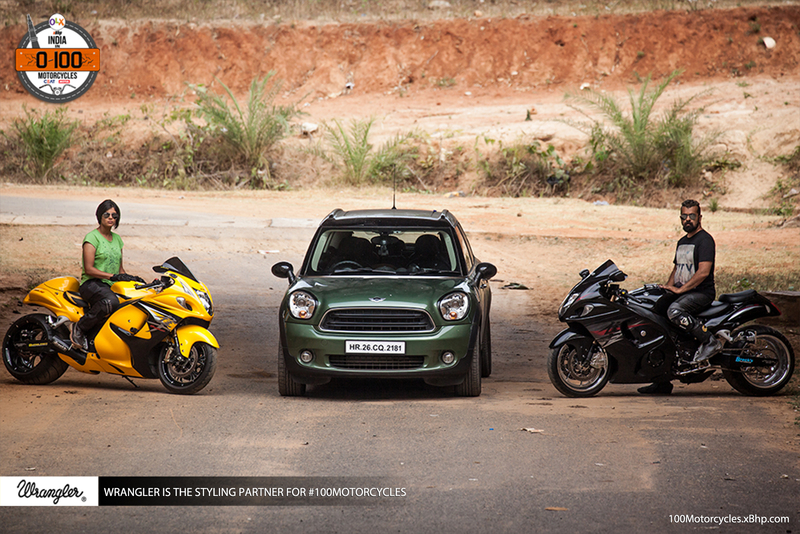 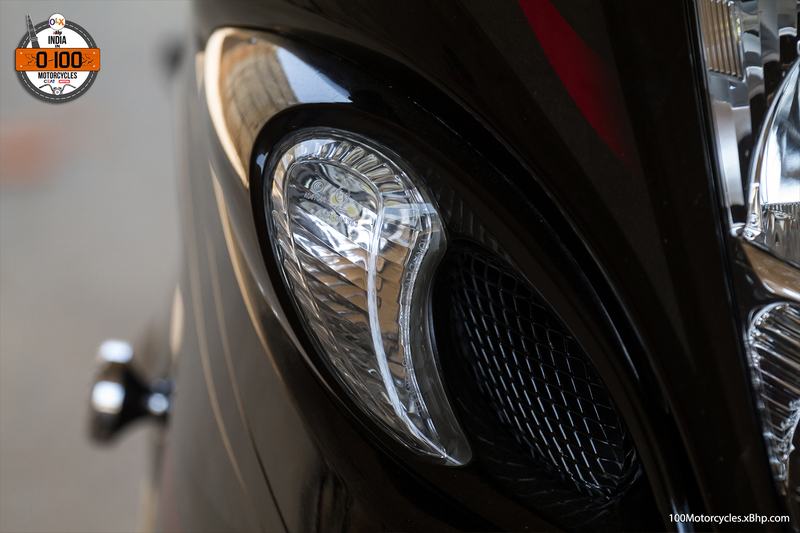 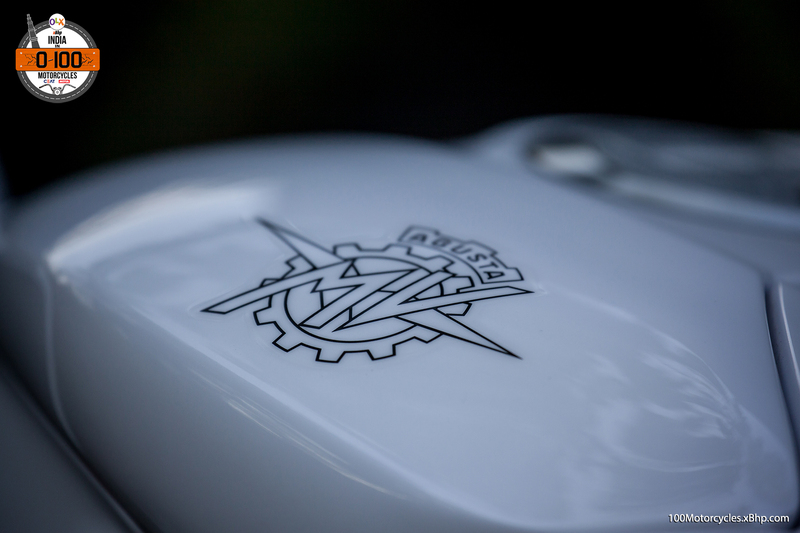 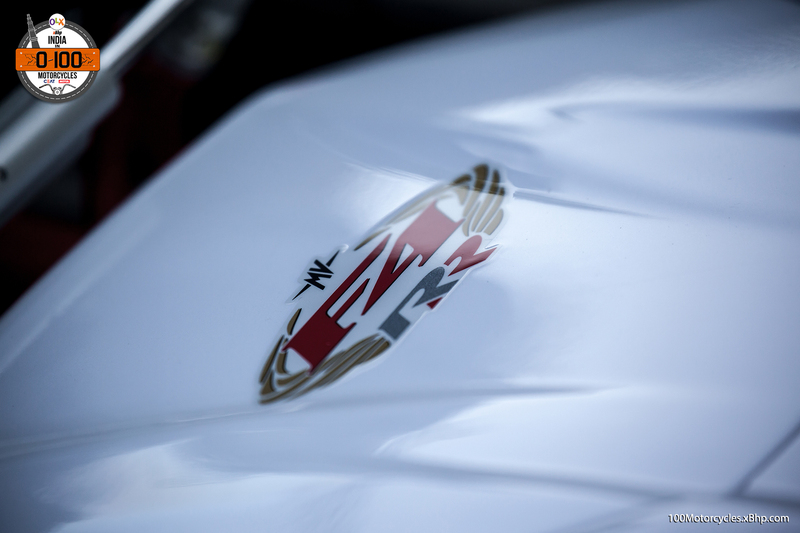 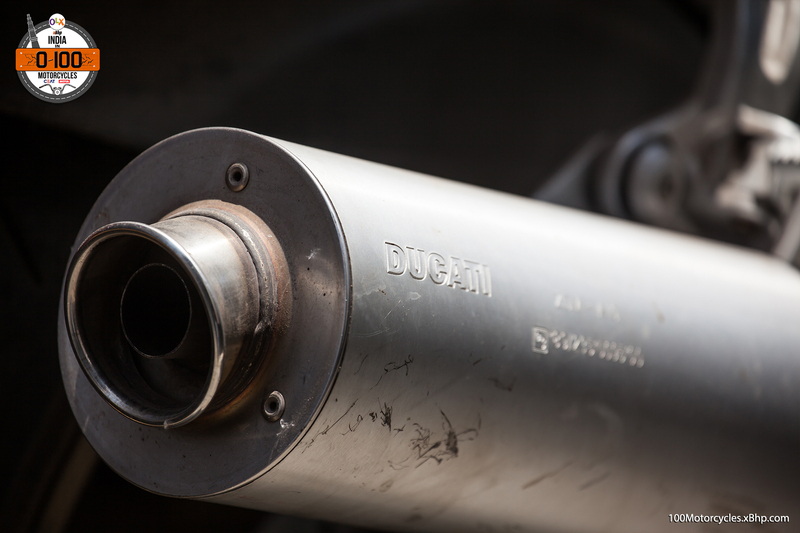 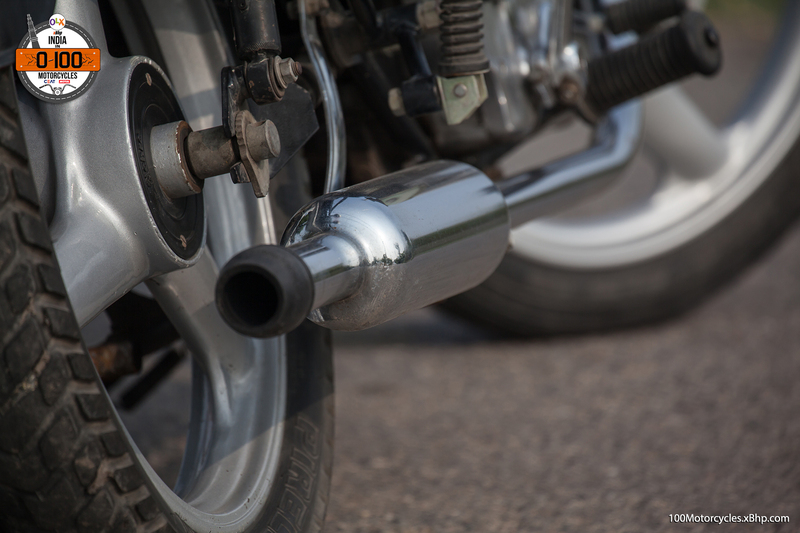 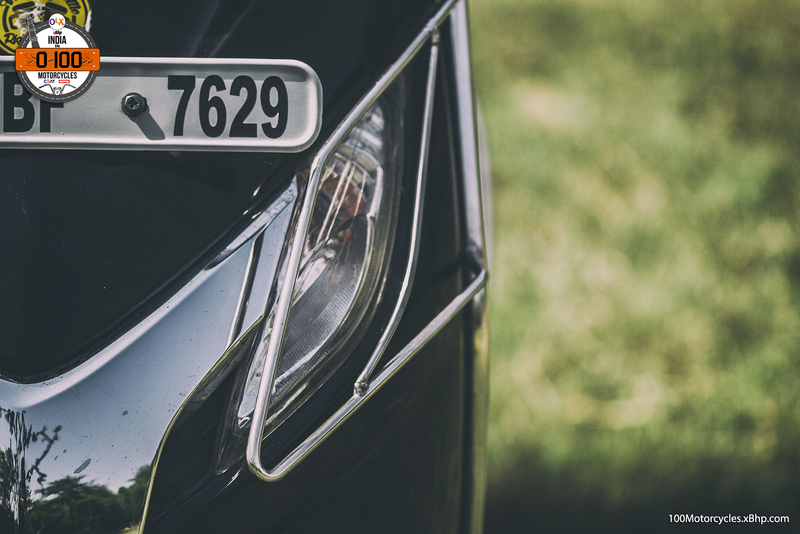 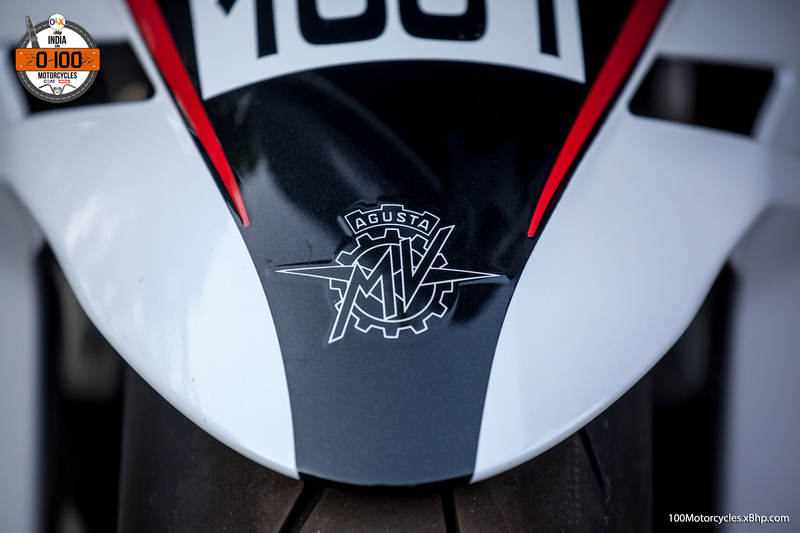 Talking of thunder, the pull or the exhaust note will not blow you away. 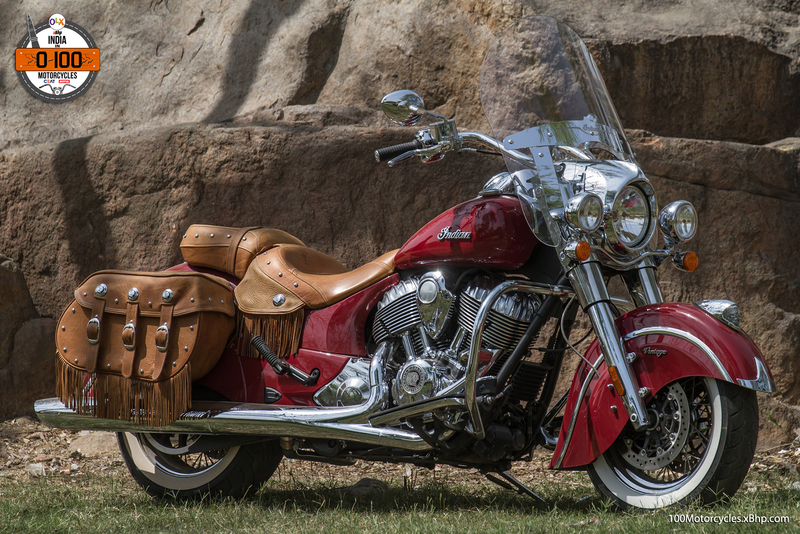 The pull is there, but it is flat throughout, unlike the Harleys that give you that initial elbows-out-of-your-socket pull. 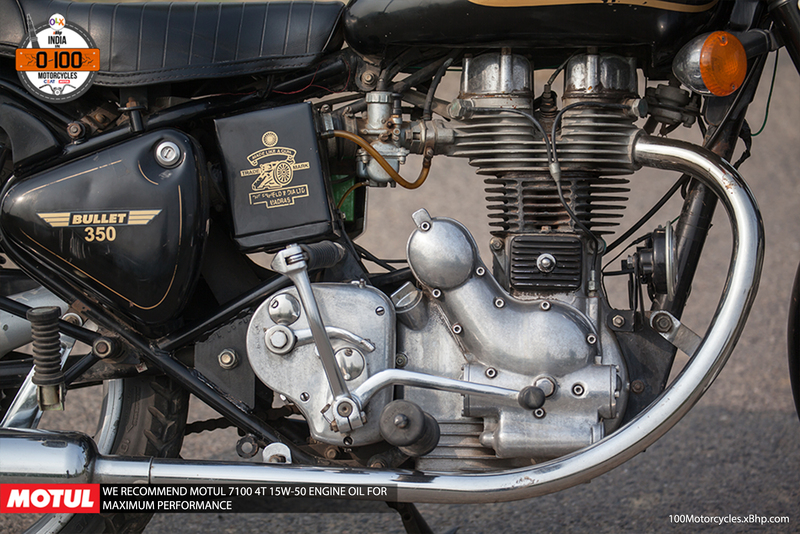 The overall package comes across as quite gentlemanly. 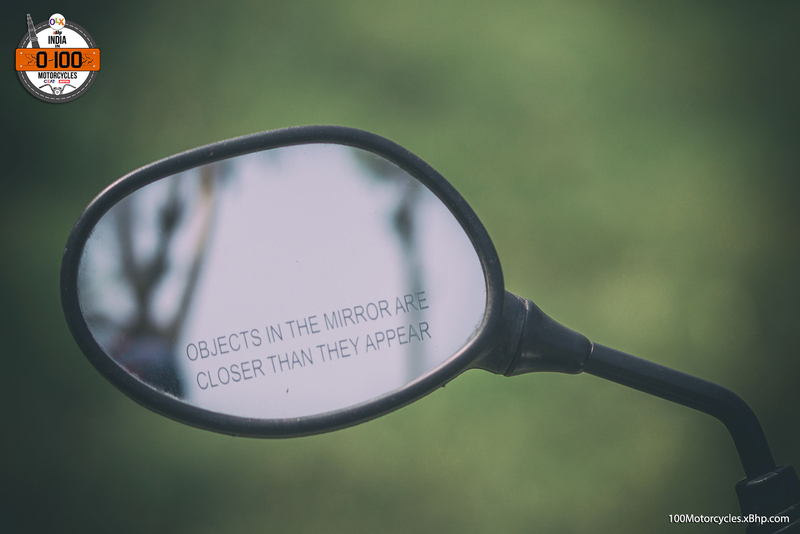 Don’t expect people to notice you making an entry until they see you, that is. 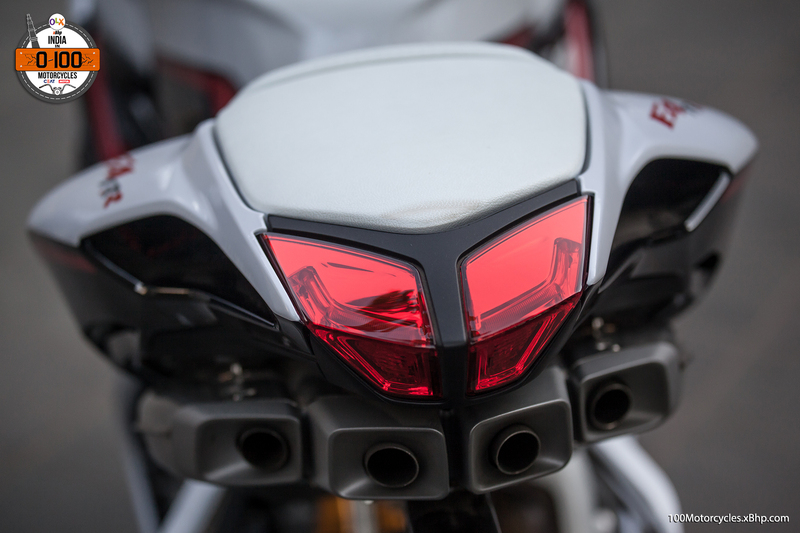 The bike is a visual delight but would have had a lot more character if it would have had that bleeding thump. 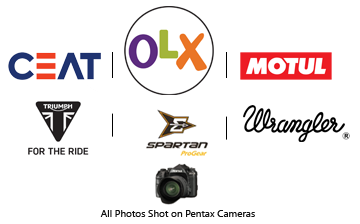 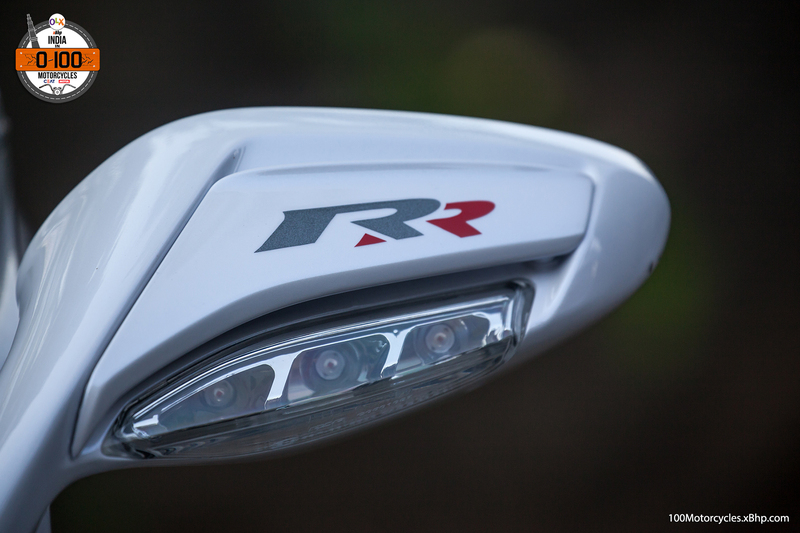 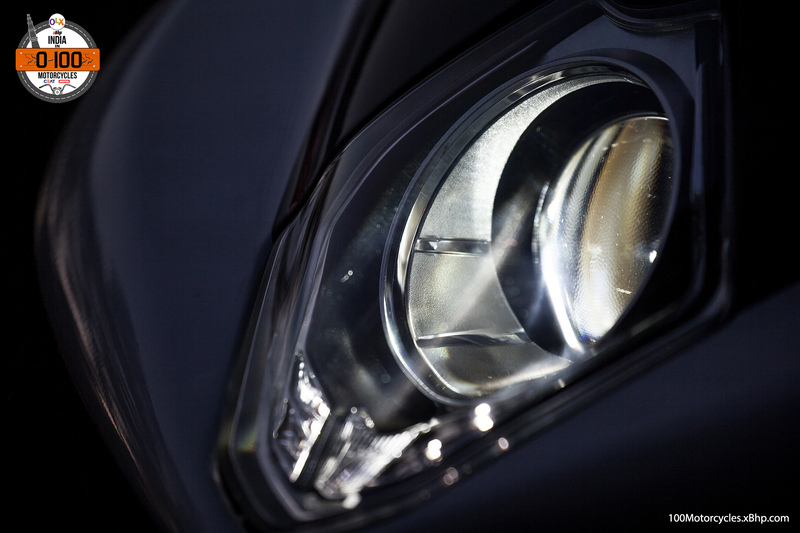 But as a package, this finds many takers, and you always have aftermarket add-ons for the flashes and the noise. 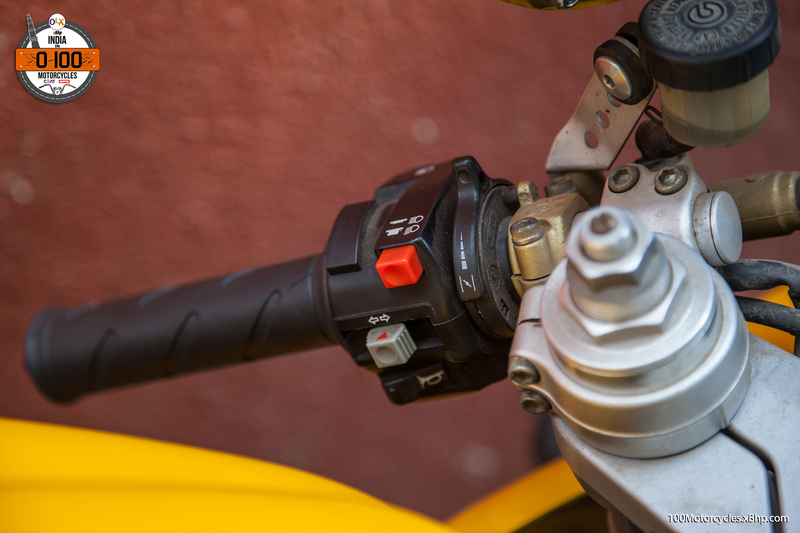 Push the swanky starter button and the bike rumbles to life. 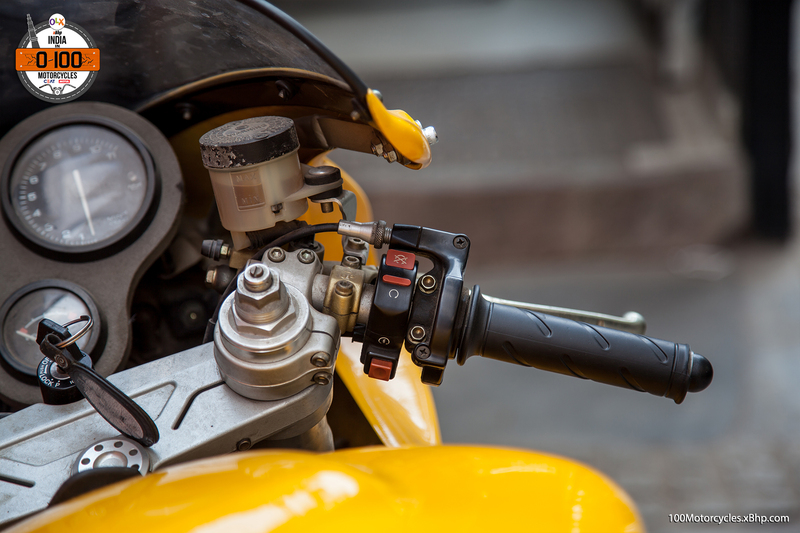 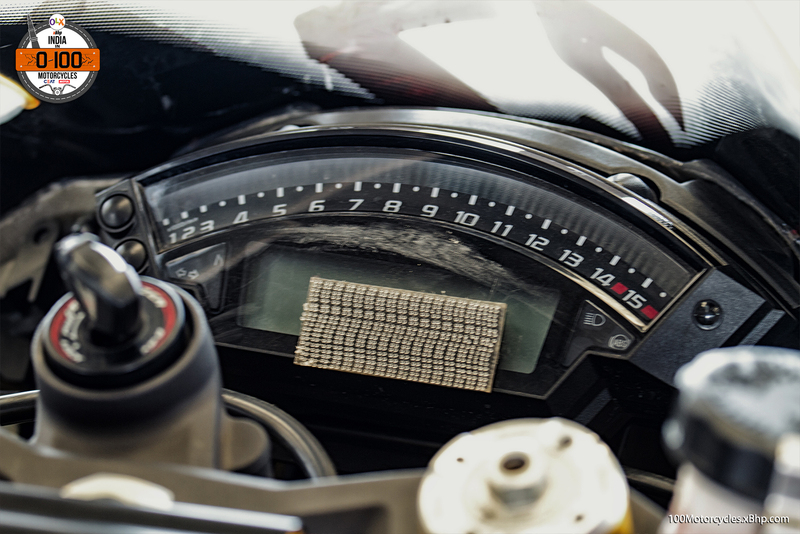 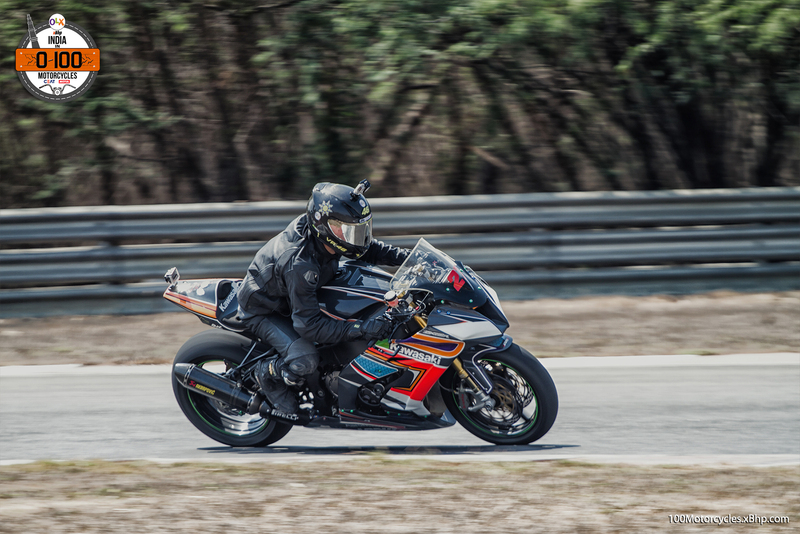 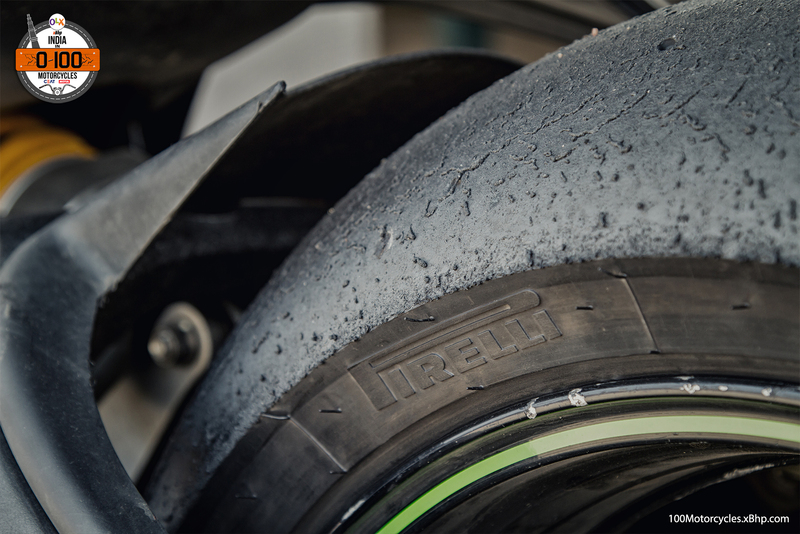 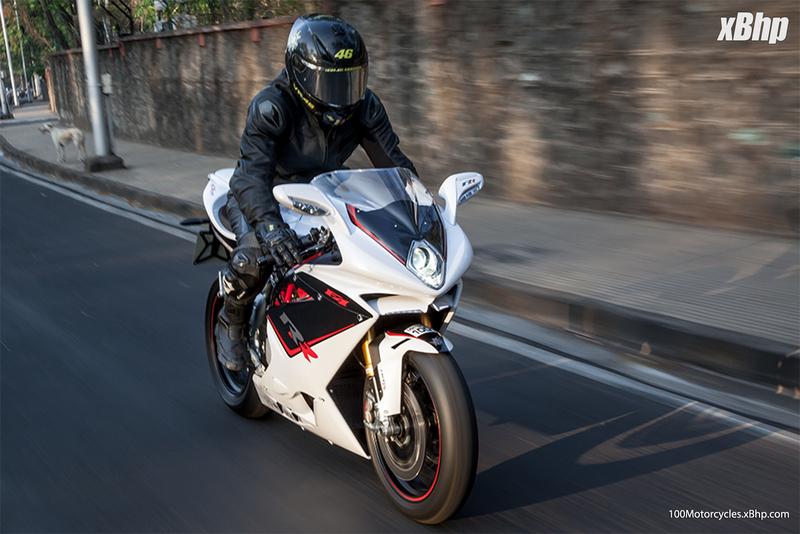 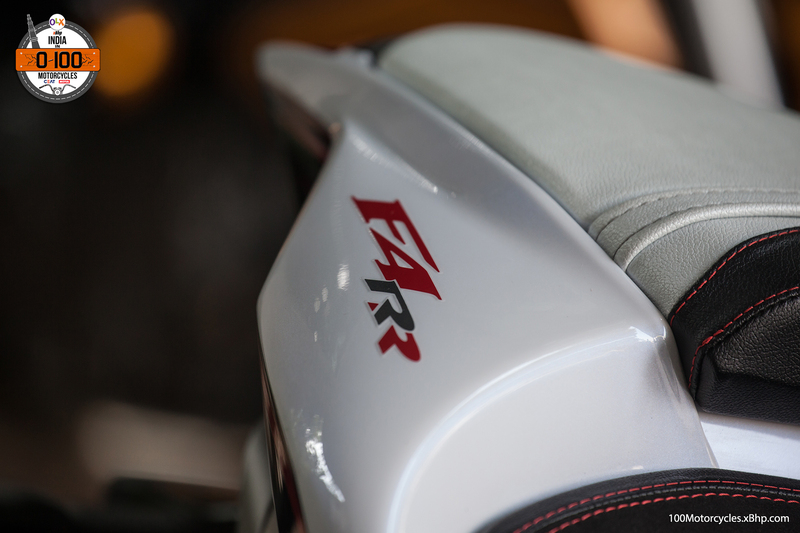 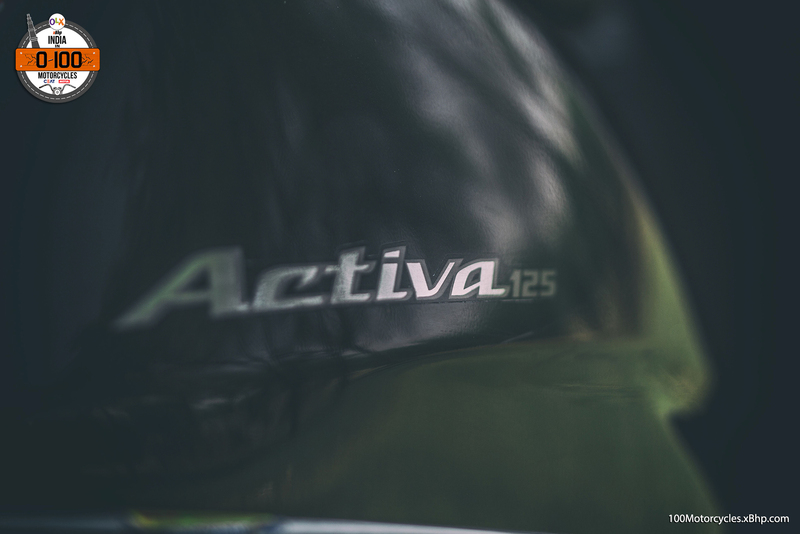 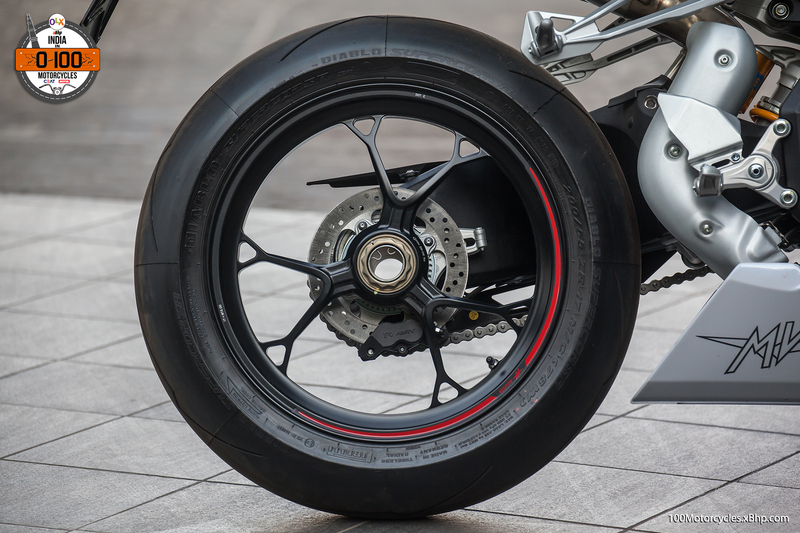 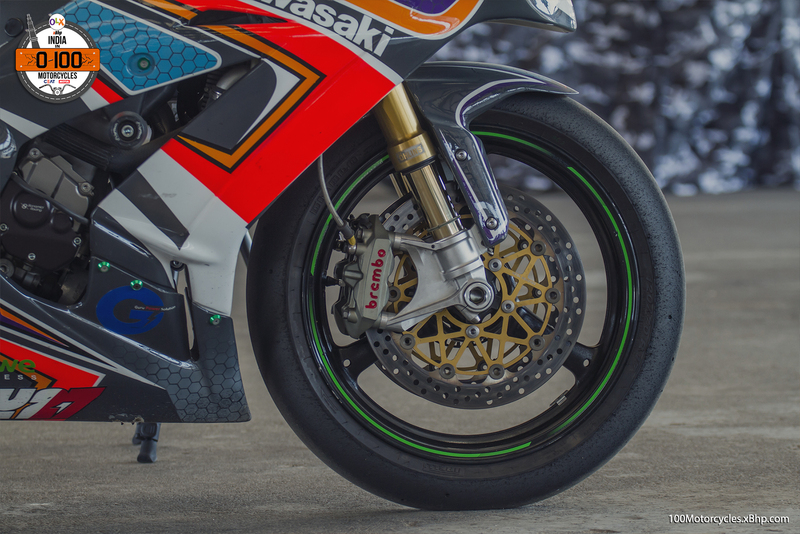 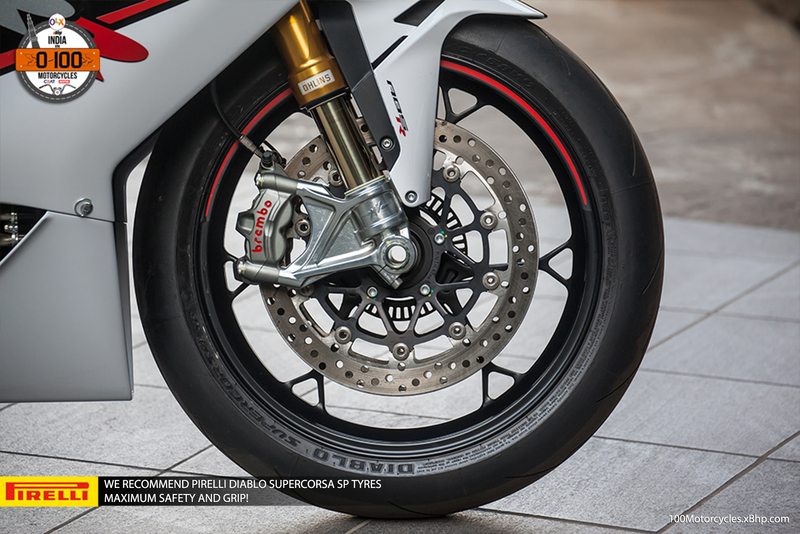 The gear shifts have a reassuring thud to them, leave the clutch and the full 450-kilo bike (with the rider weight) propels forward, but again not with the suddenness that you might like, due to the rather flat torque delivery curve. 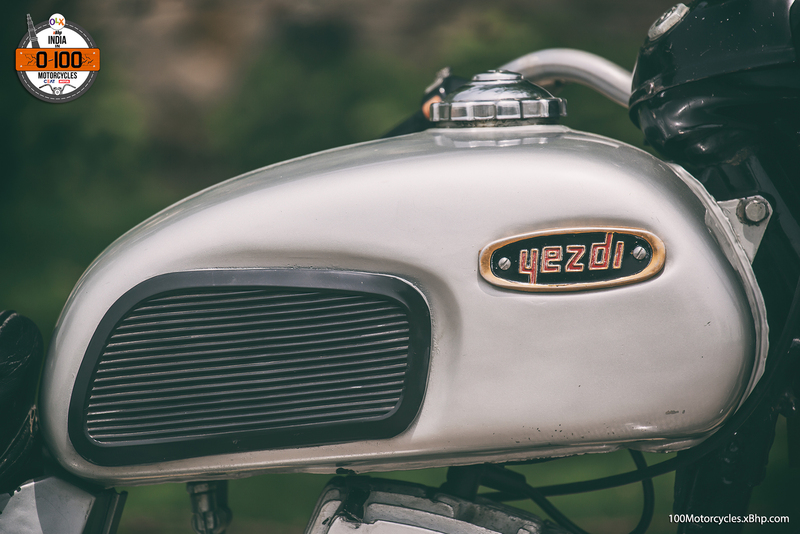 The Vintage rode very well in heavy traffic as well as on the curves, thanks to a more generous lean angle than many bigger Harleys. 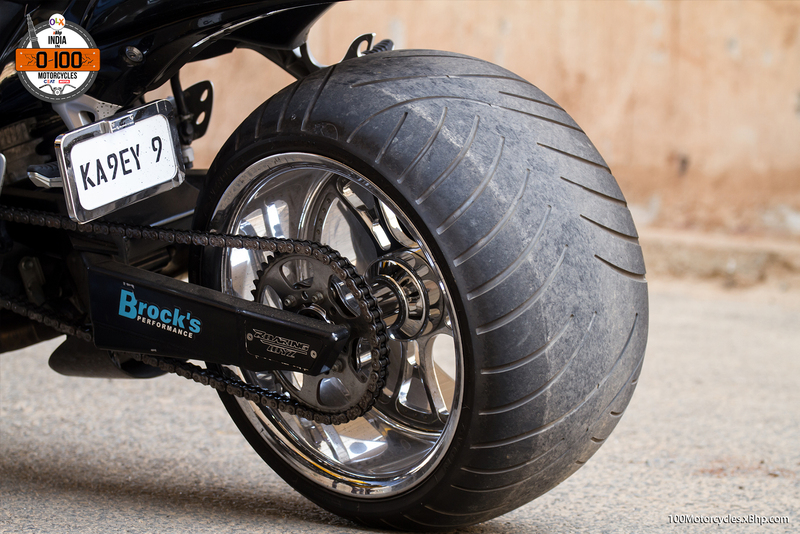 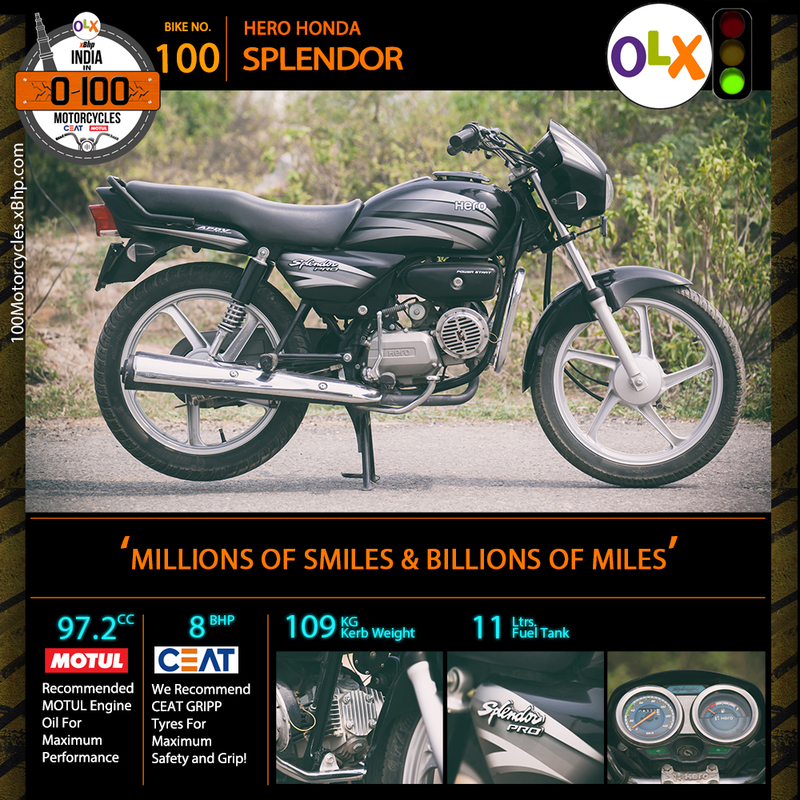 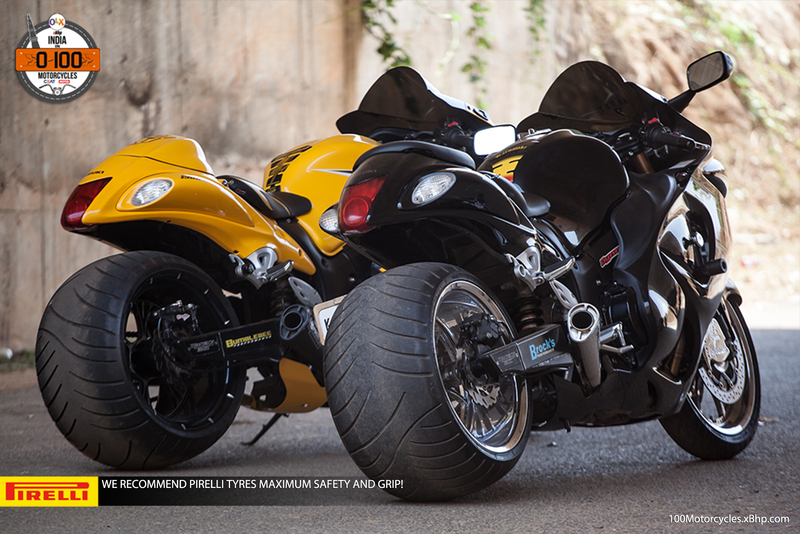 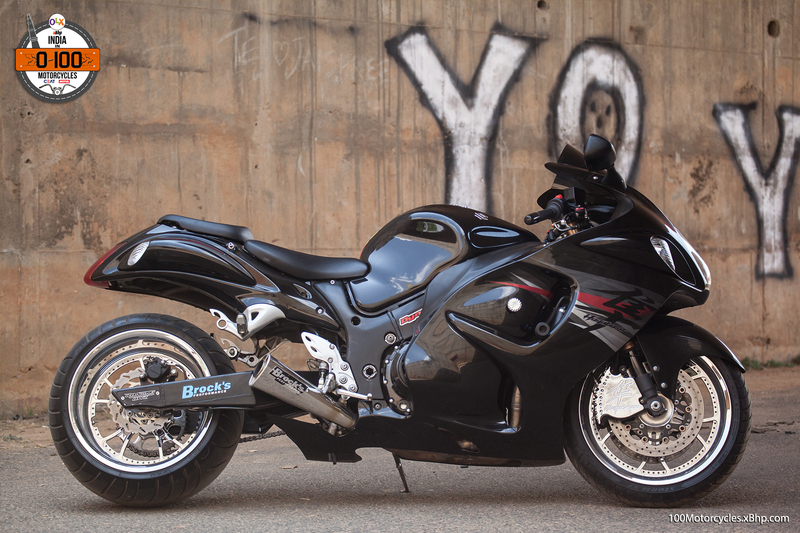 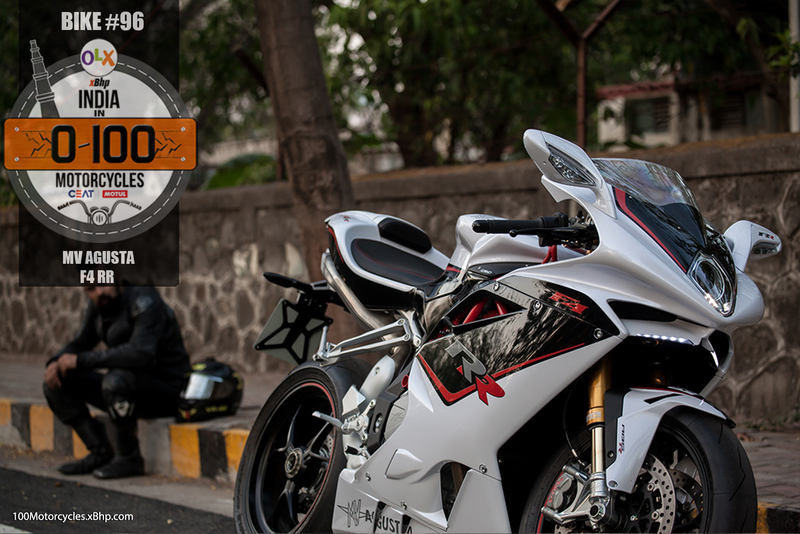 This bike will make a statement at a biker’s meet or a high profile party or just being totally different on the road. 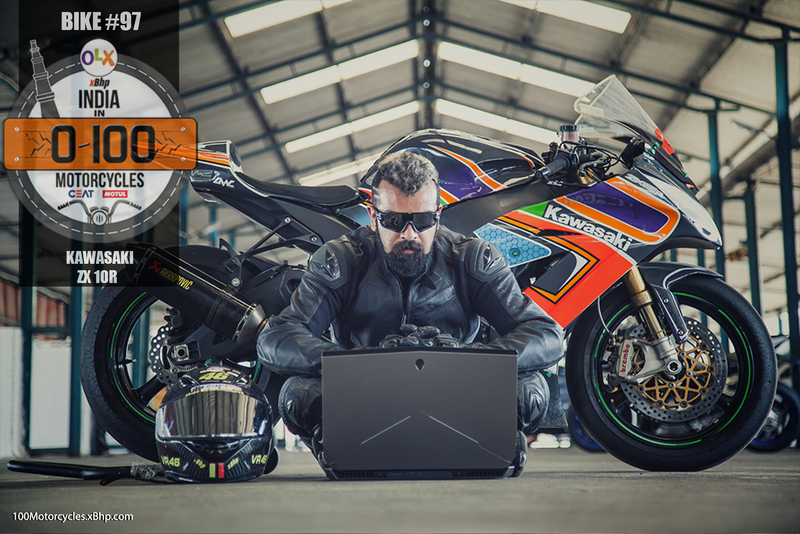 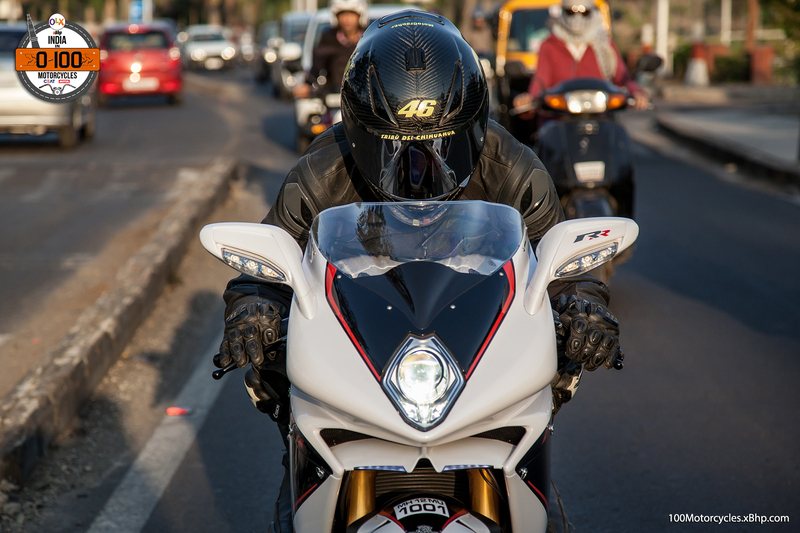 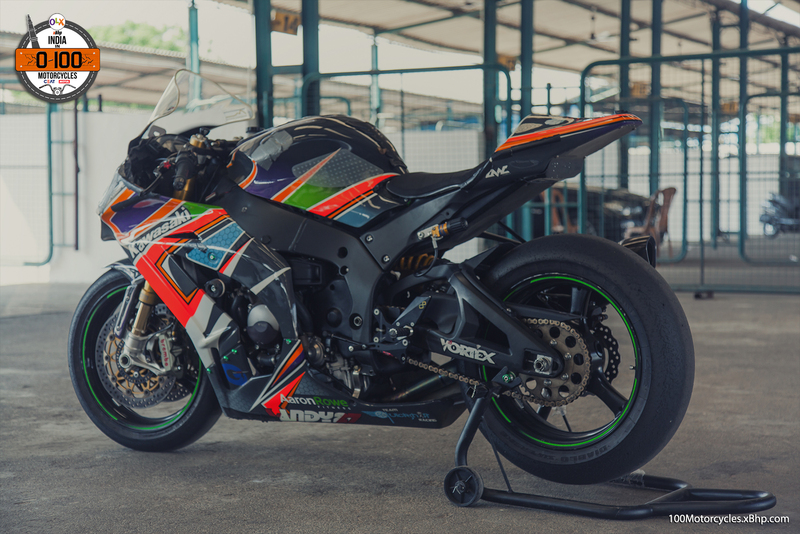 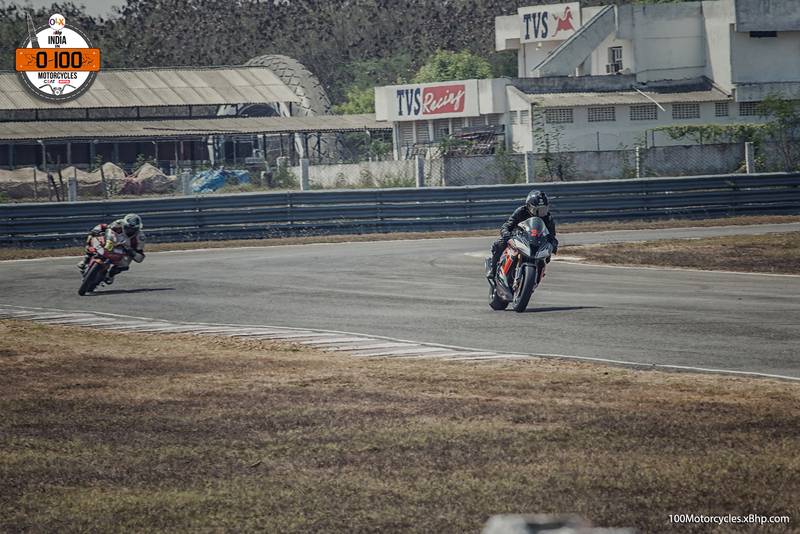 In our journey to find #100Motorcycles in India, we stopped over at the TVS plant, where we were lucky to experience 3 of their racing bikes. 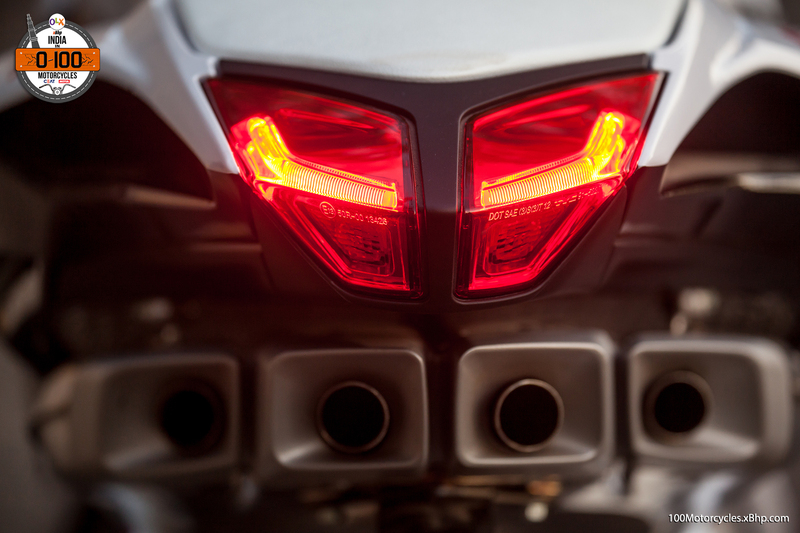 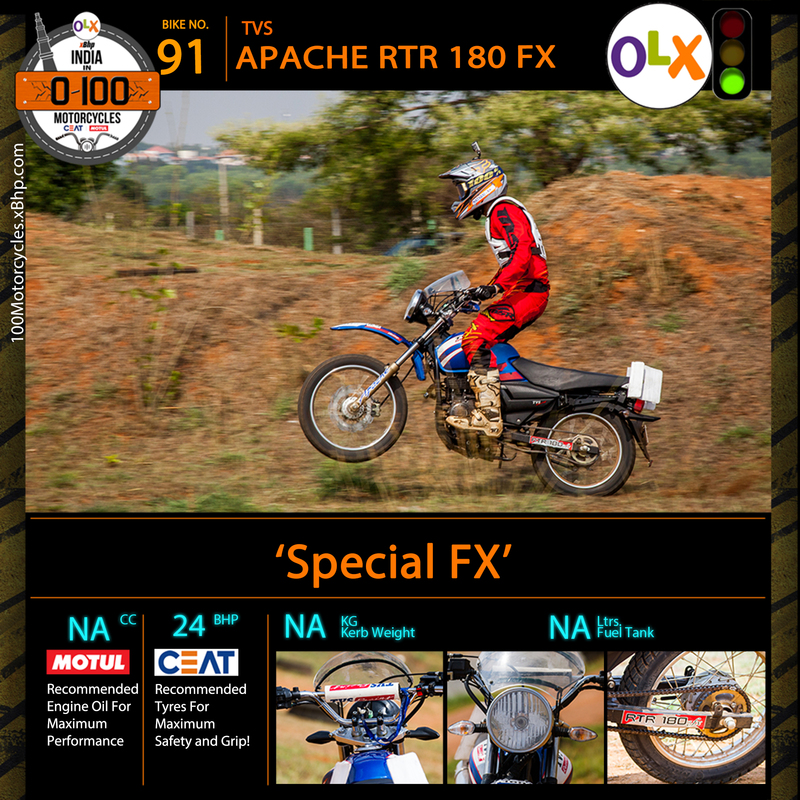 The street racing, supercross with Aravind KP and now the third, the TVS Apache RTR 180 FX Rally bike! 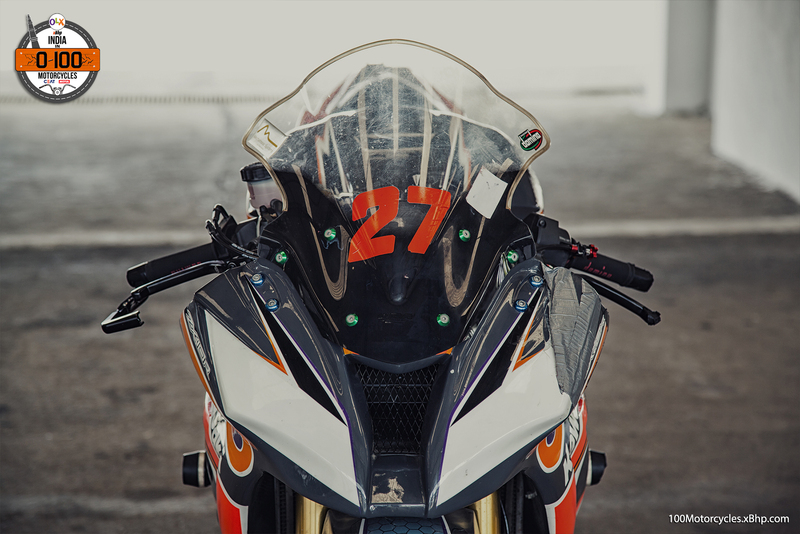 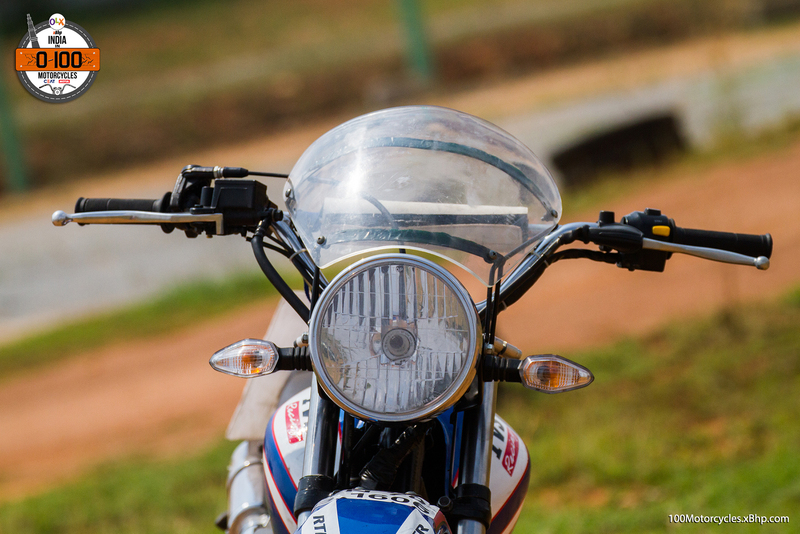 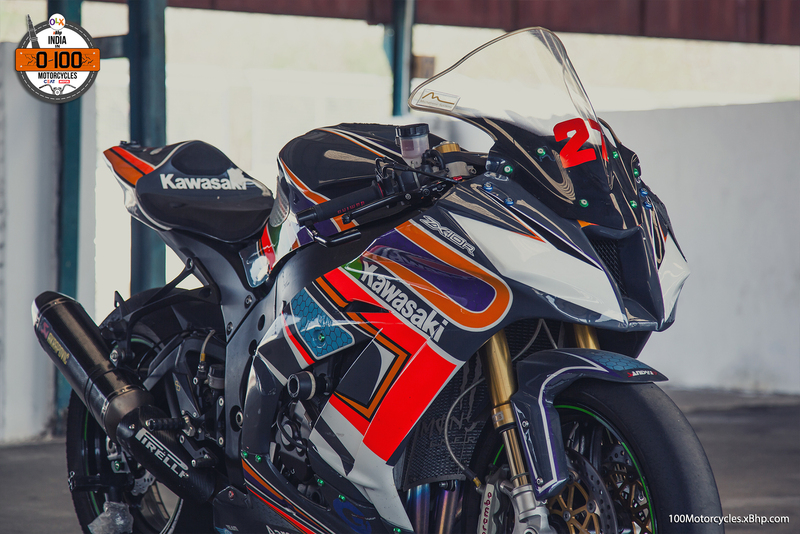 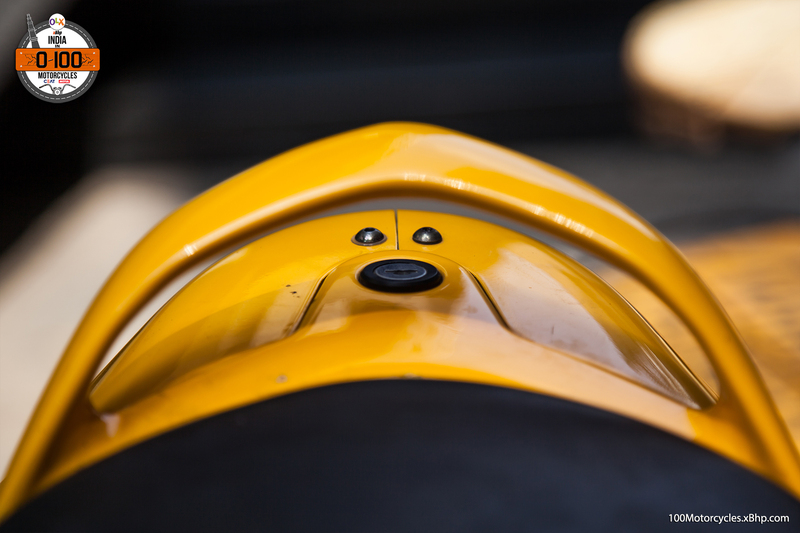 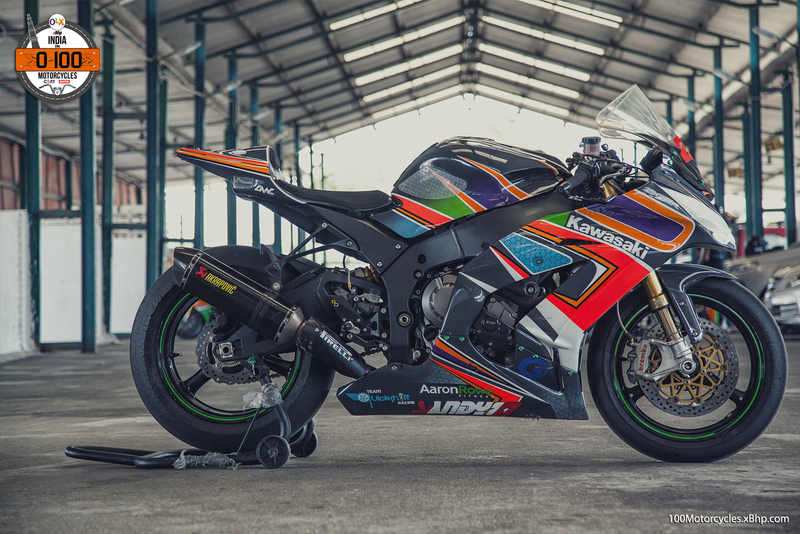 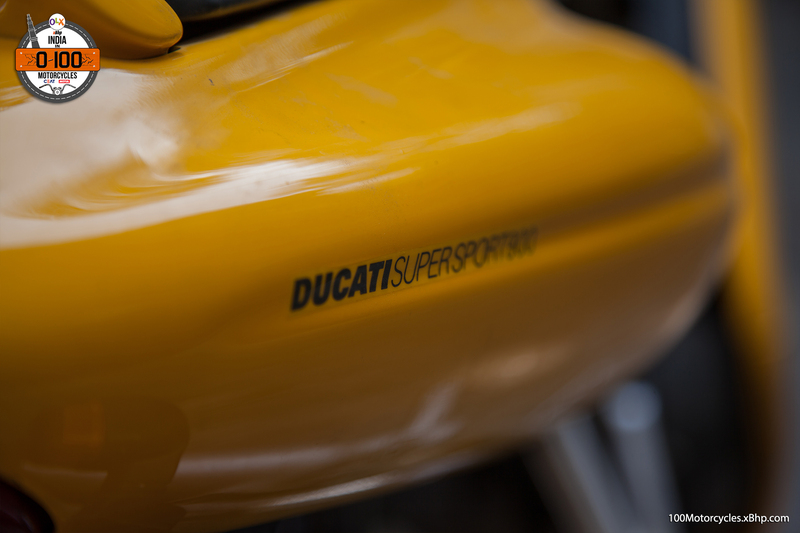 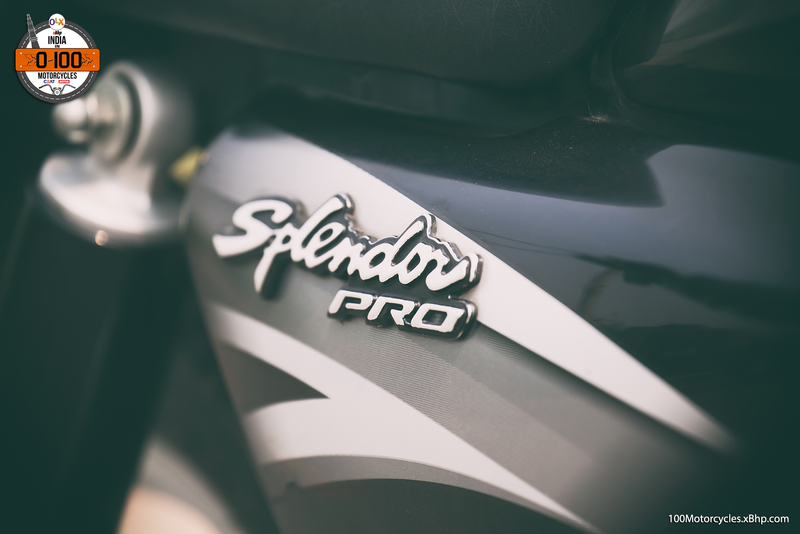 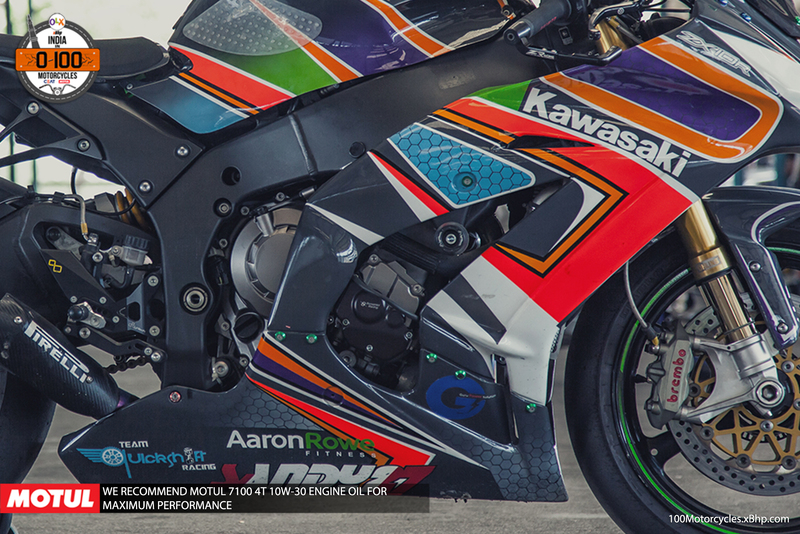 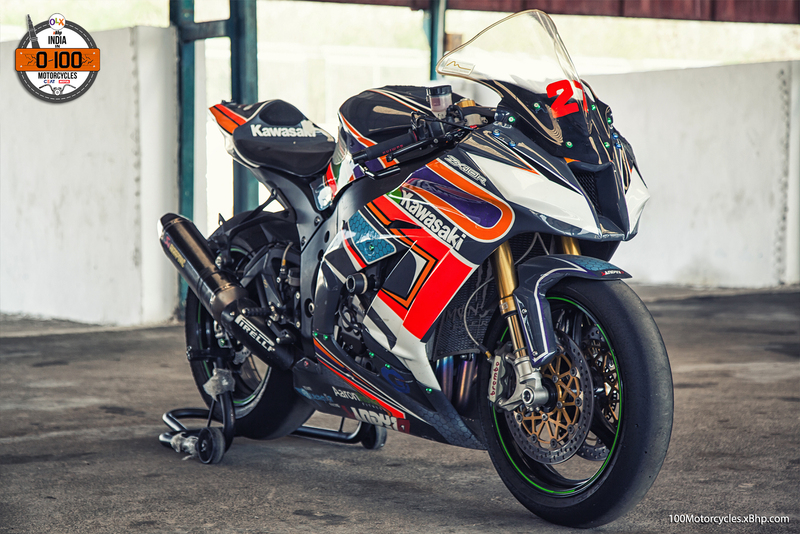 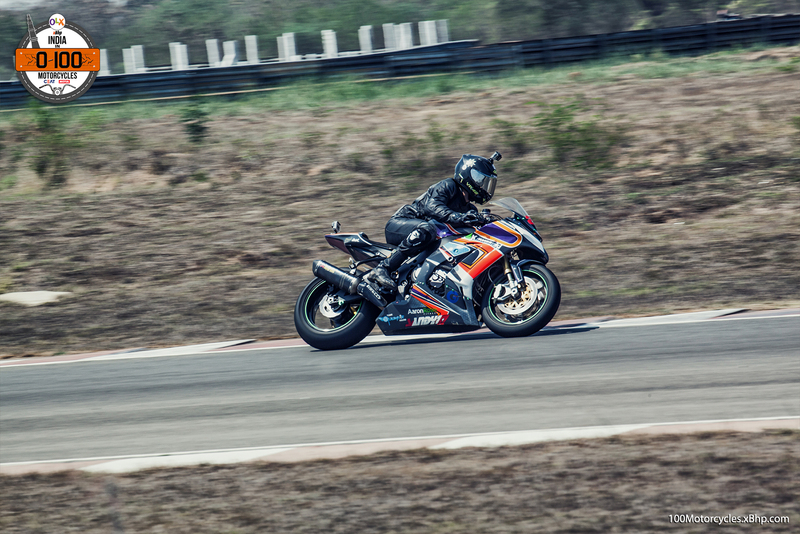 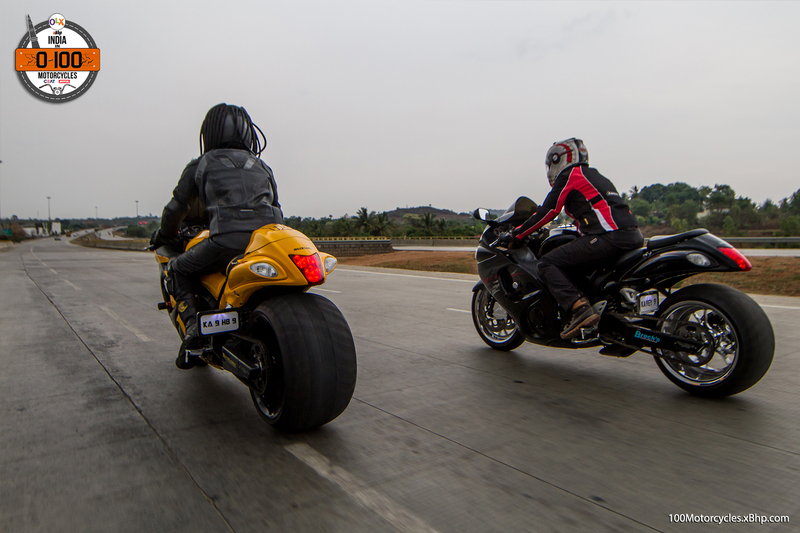 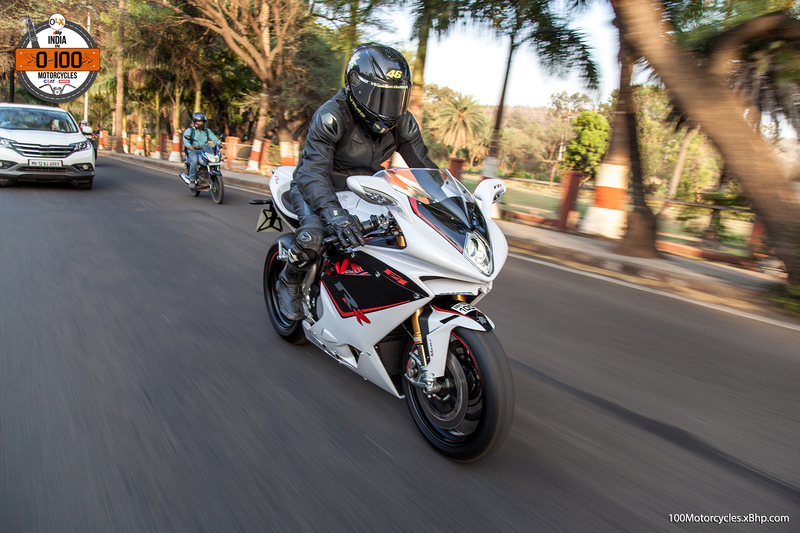 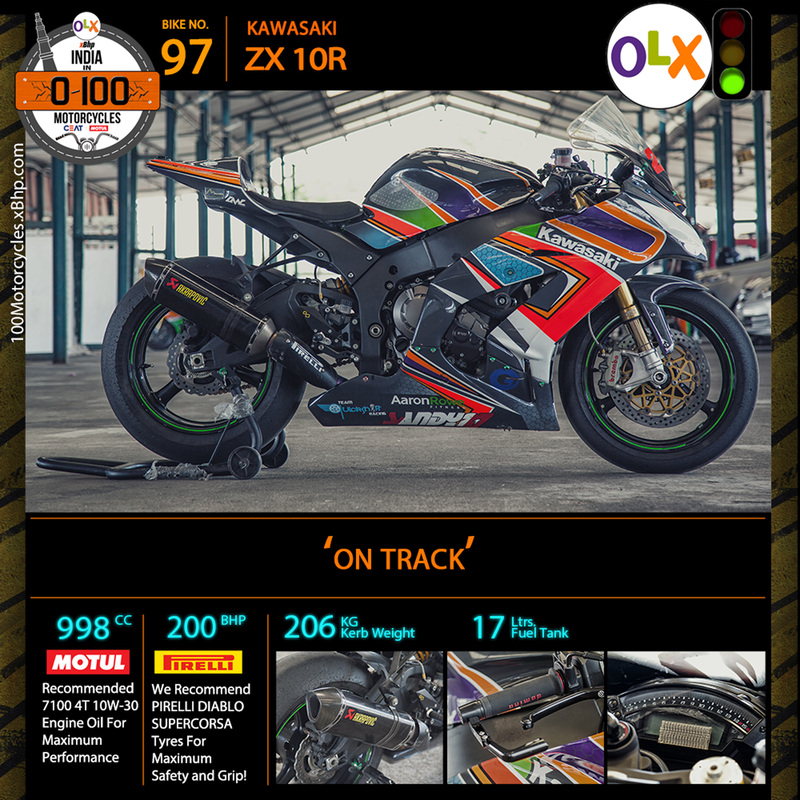 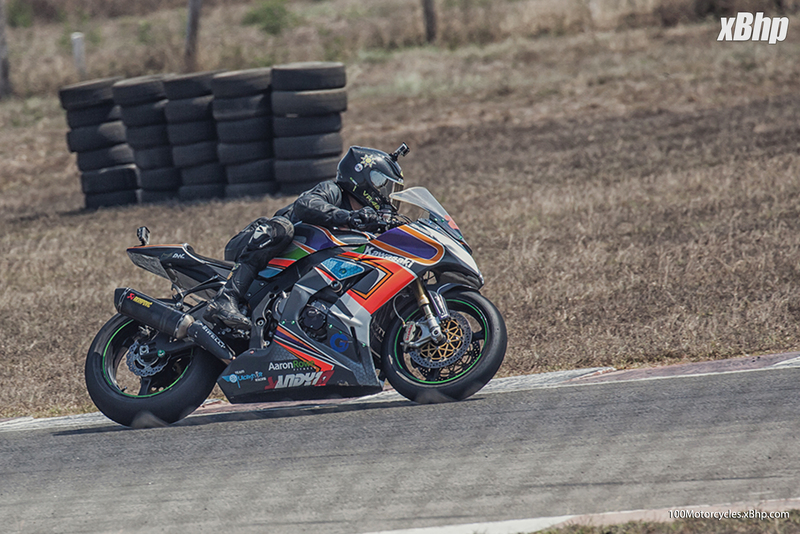 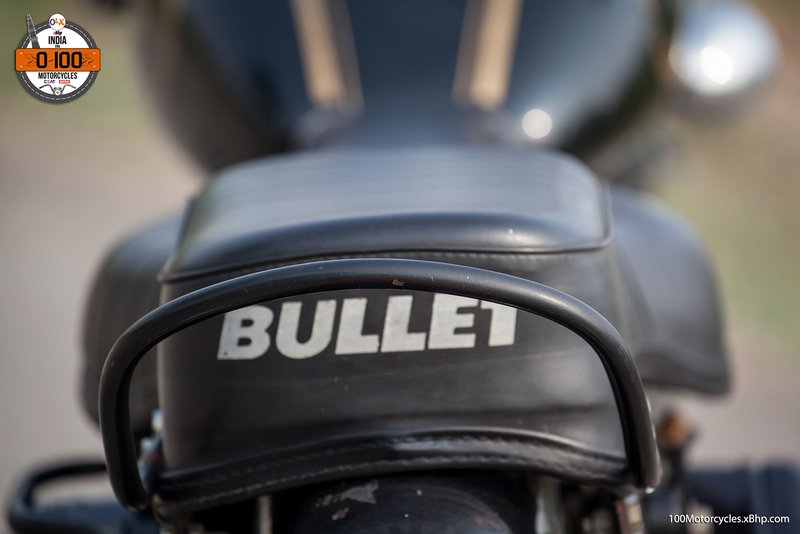 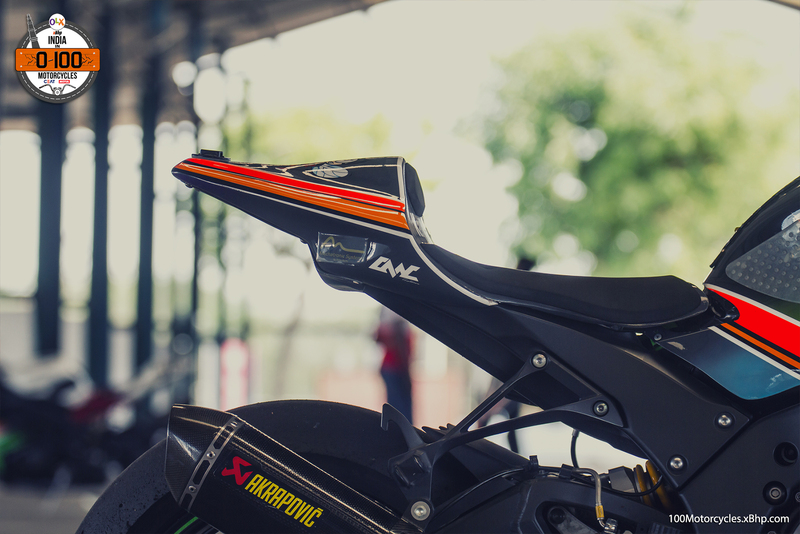 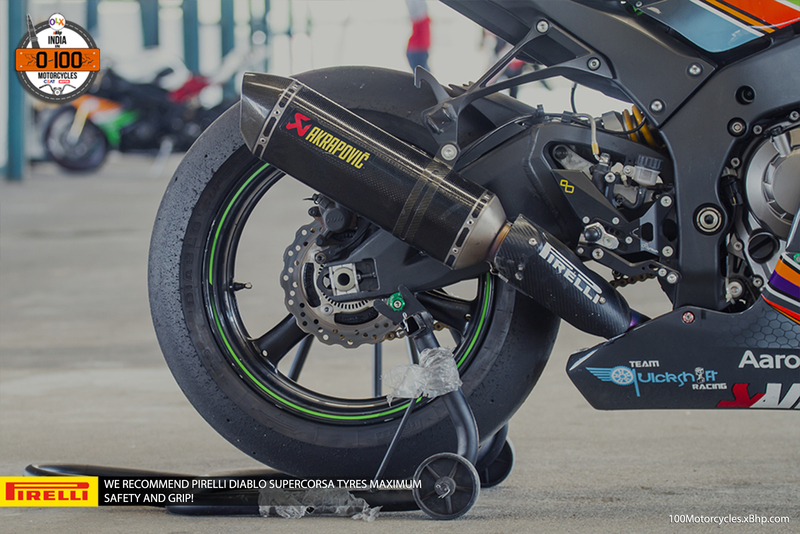 This bike was ridden by ace rider Nataraj for us to capture him on camera as he flew around the course. 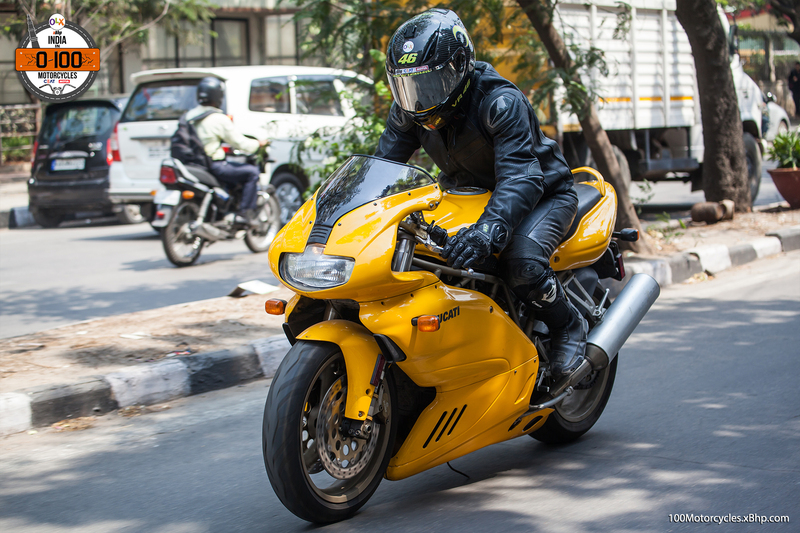 Just watching him ride would give you Goosebumps and we can only imagine what it must be like to ride at his level. 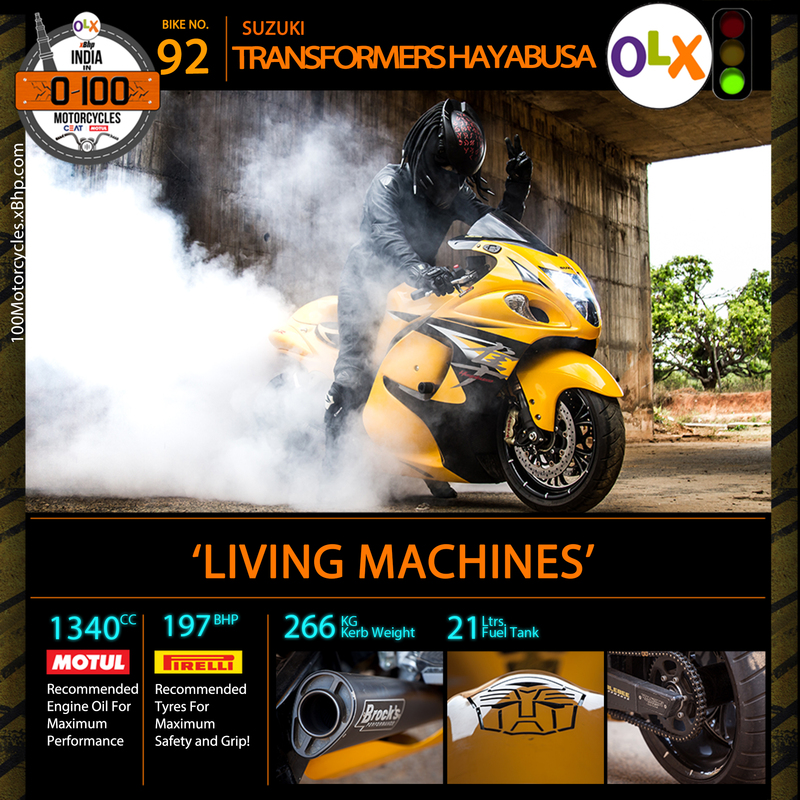 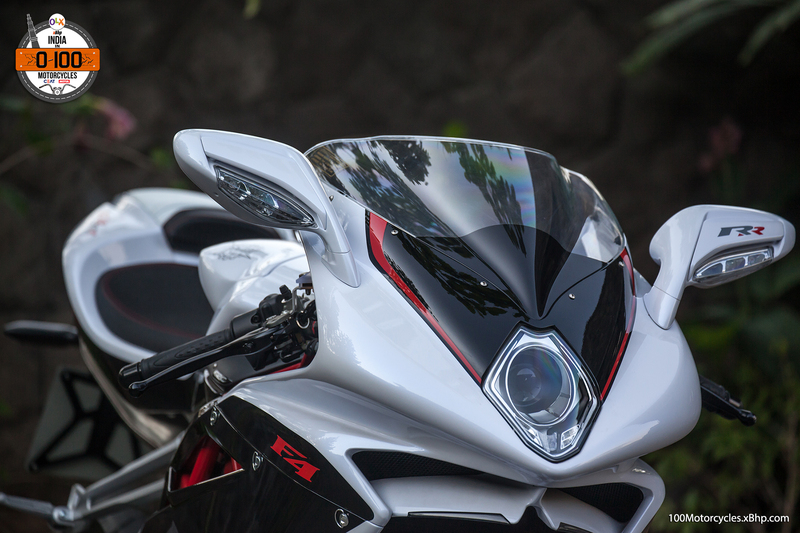 Anand from the TVS R&D gave us the lowdown and some interesting insights about the machine. 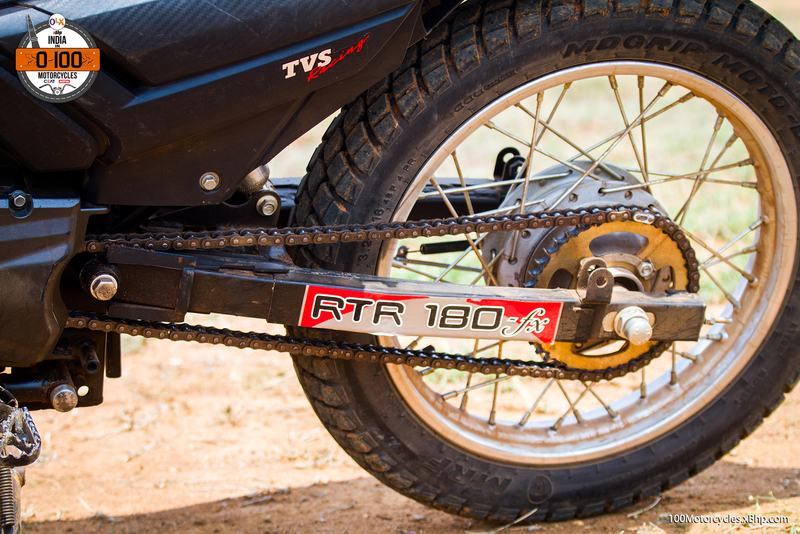 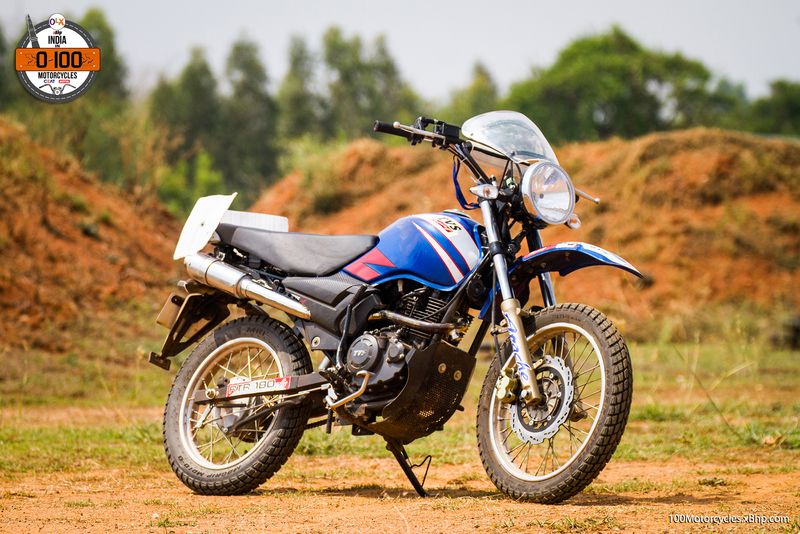 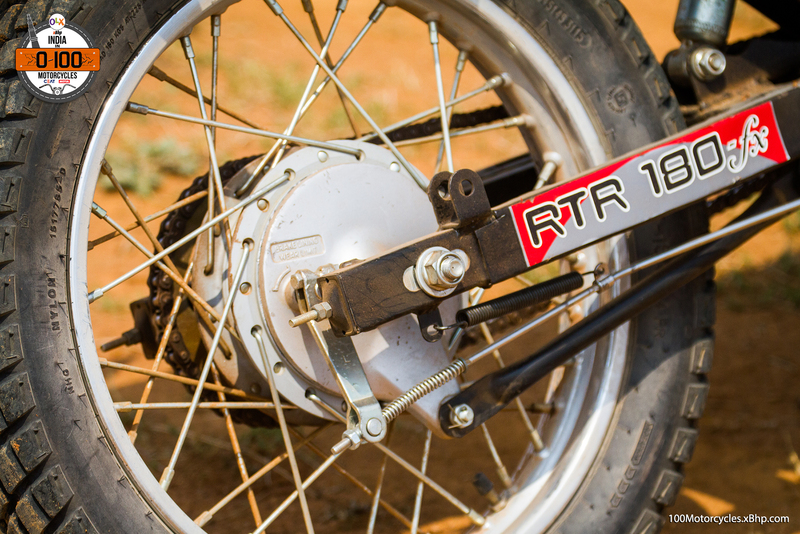 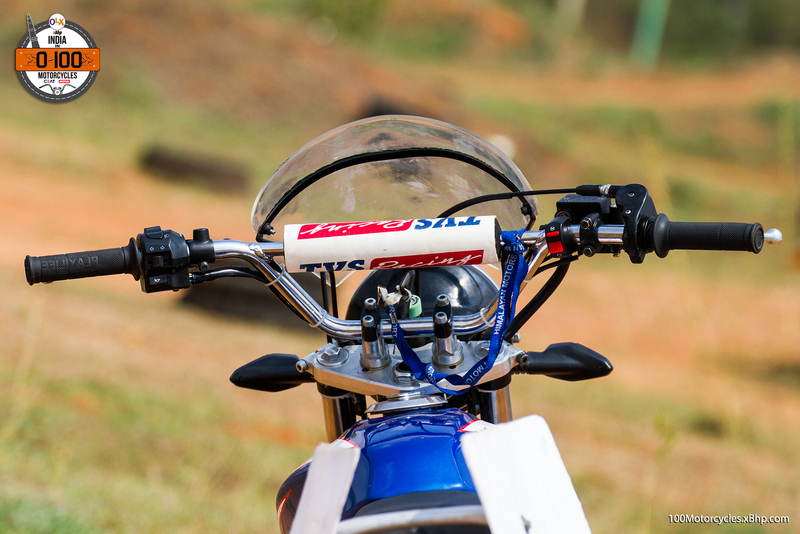 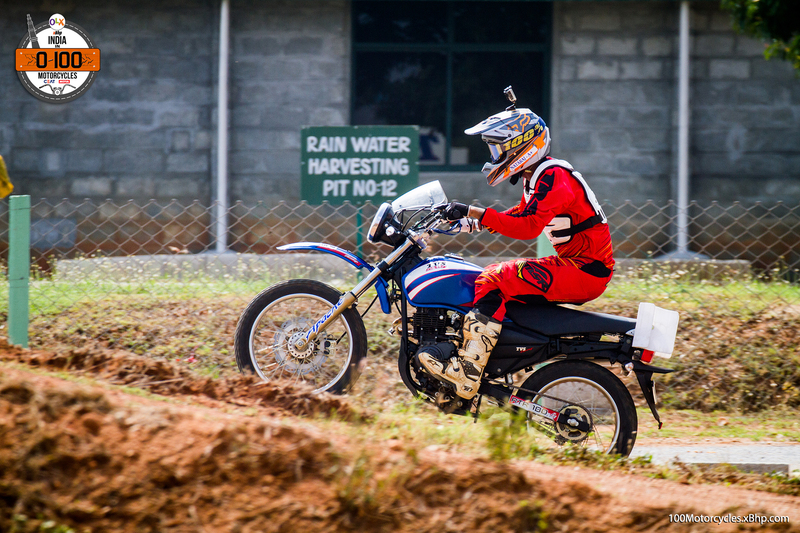 The TVS RTR 180 FX Rally Bike is used to participate in the Group B Rallies. 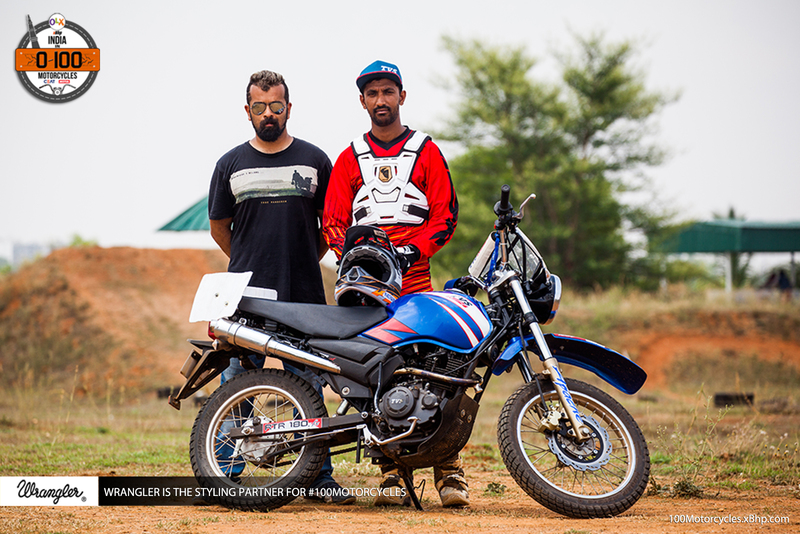 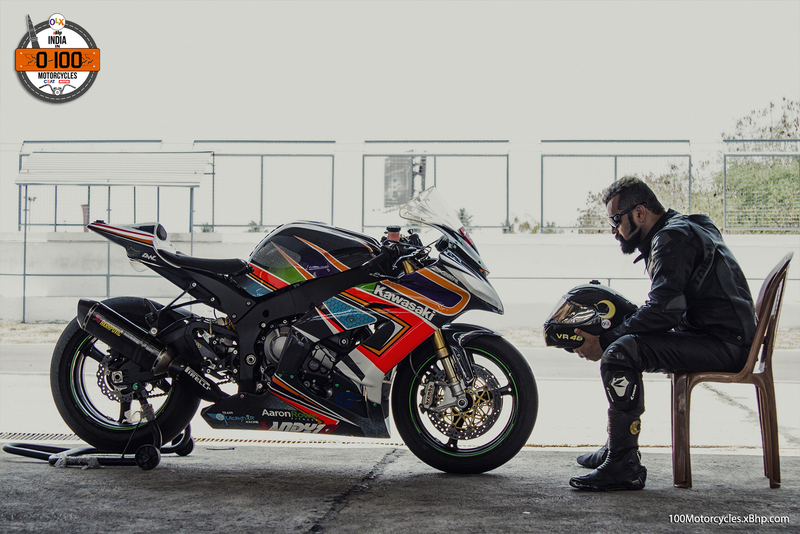 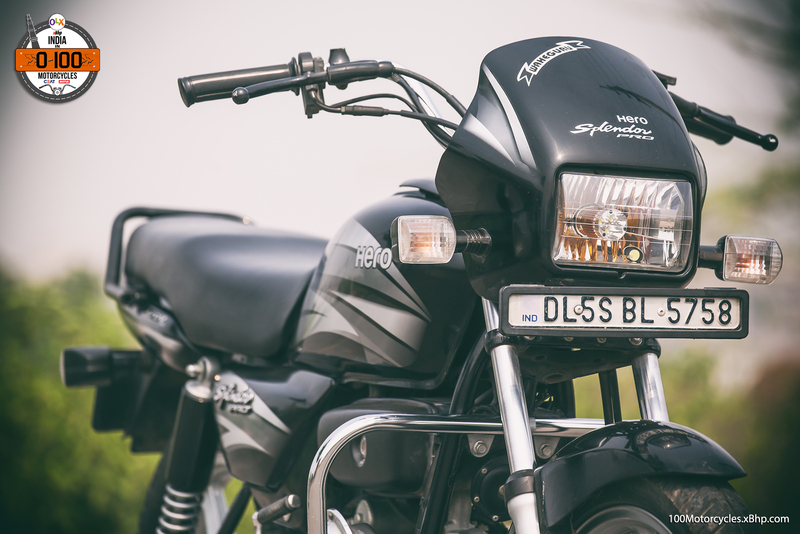 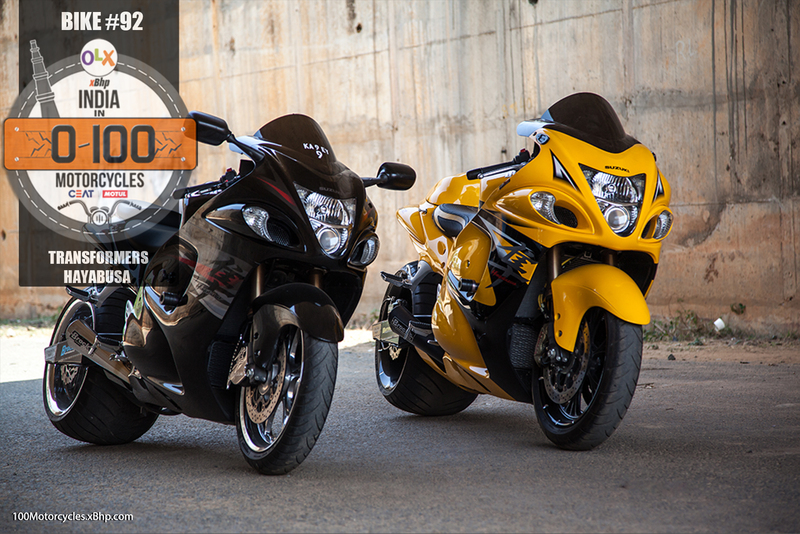 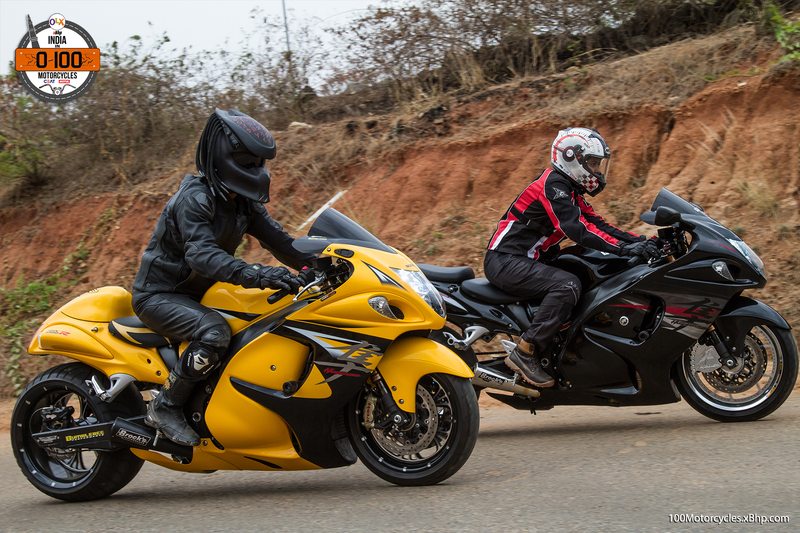 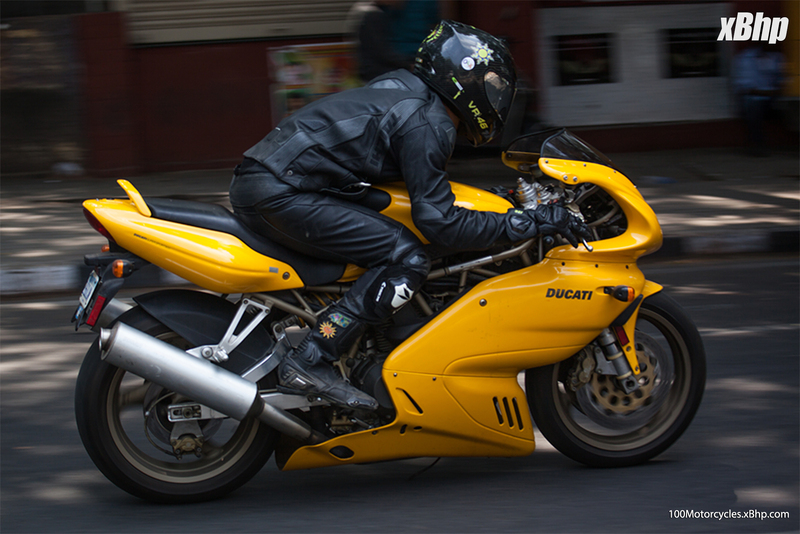 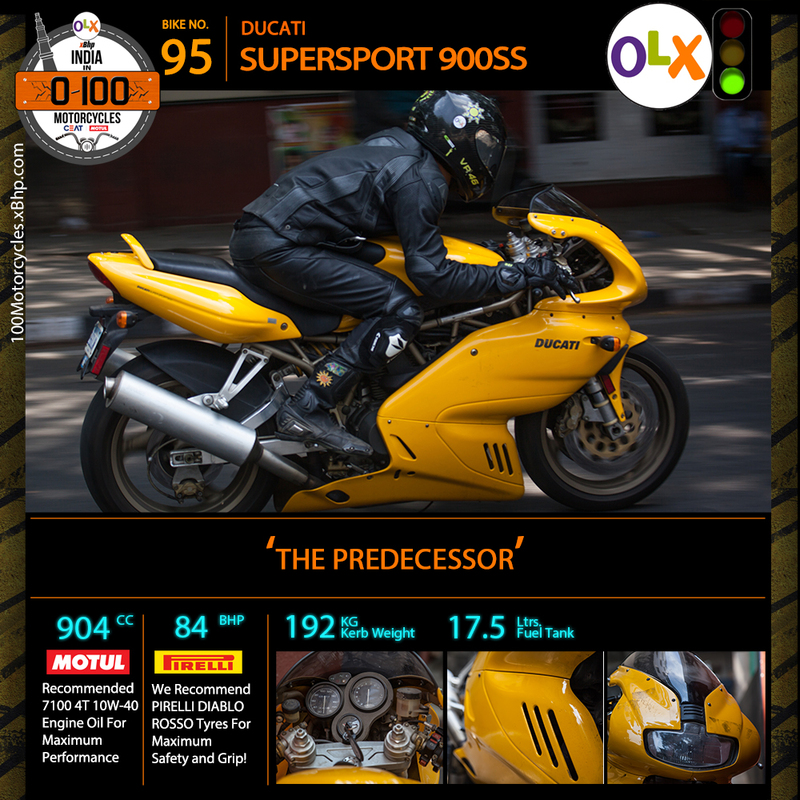 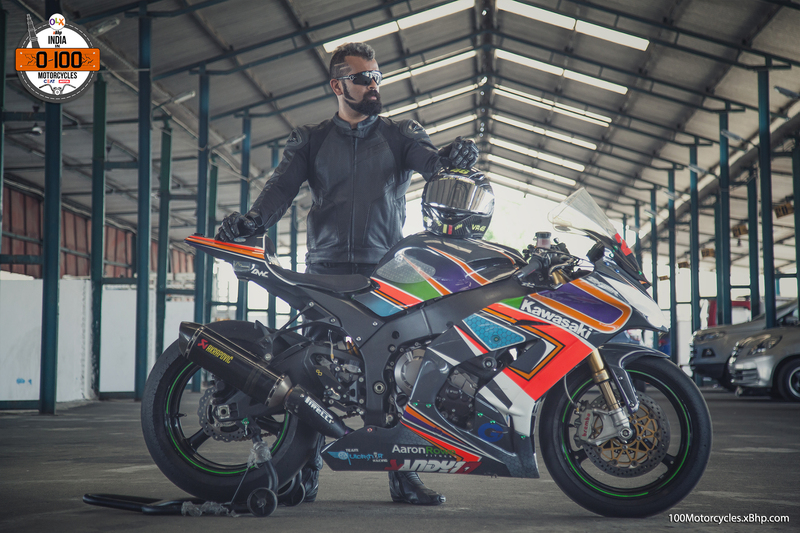 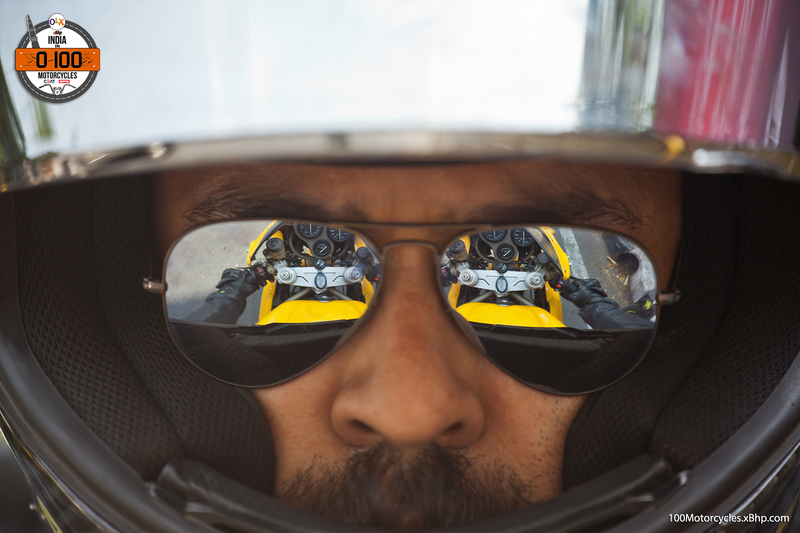 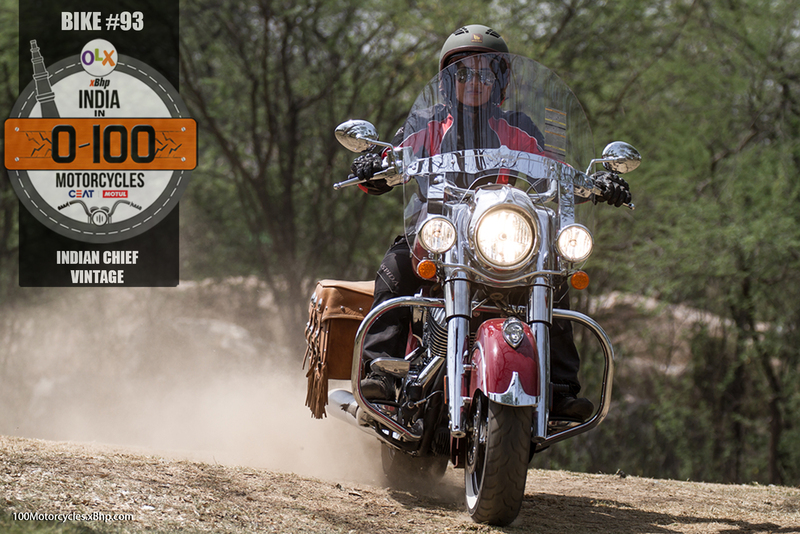 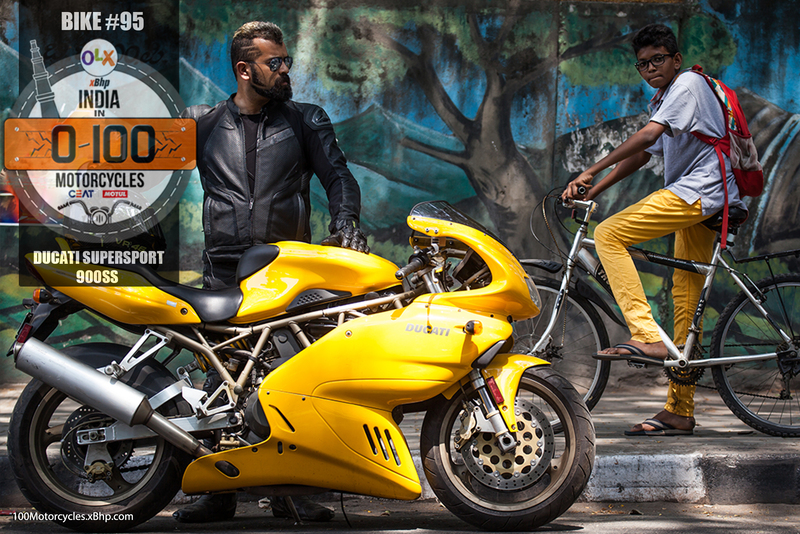 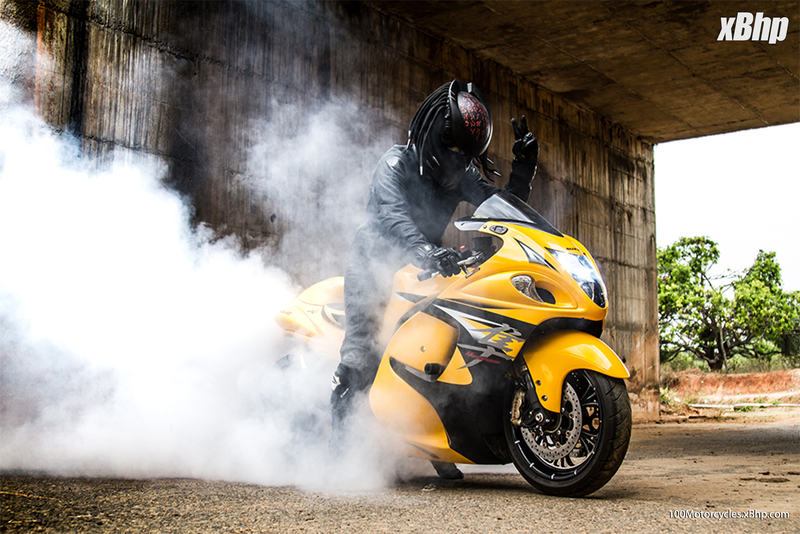 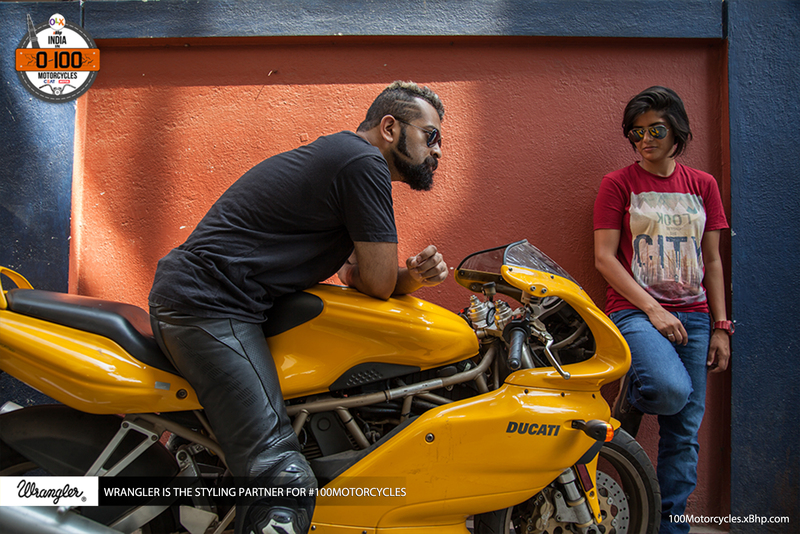 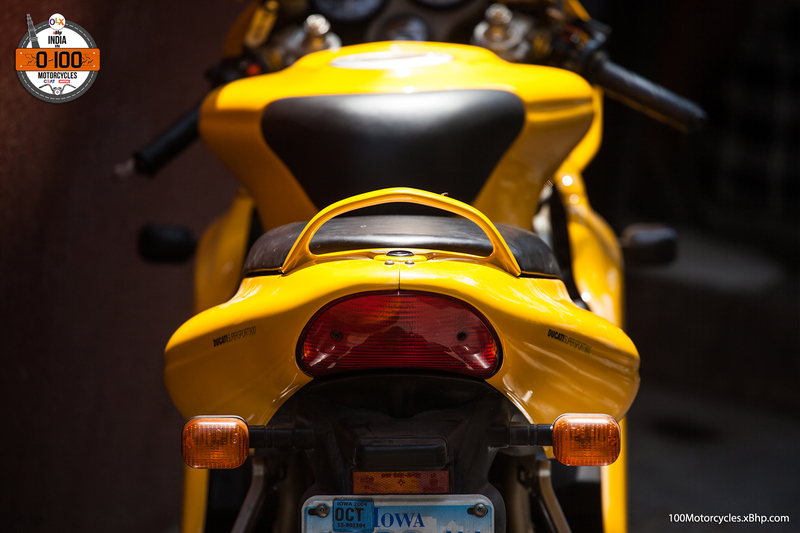 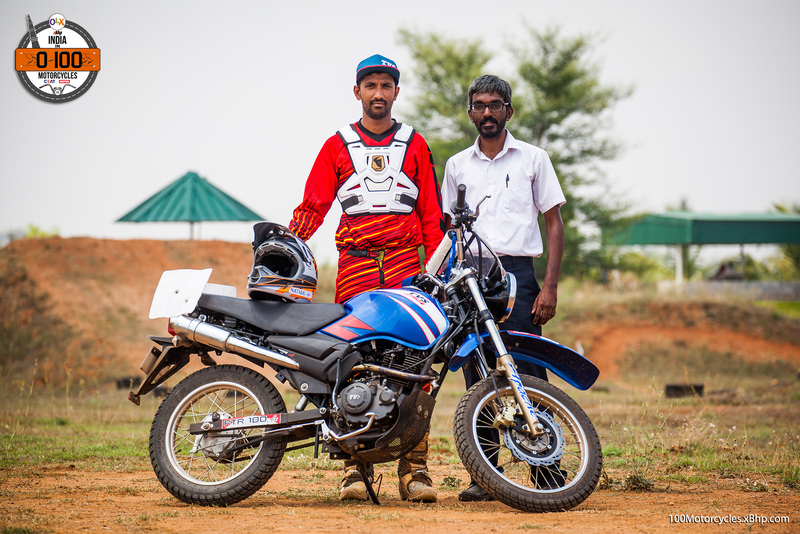 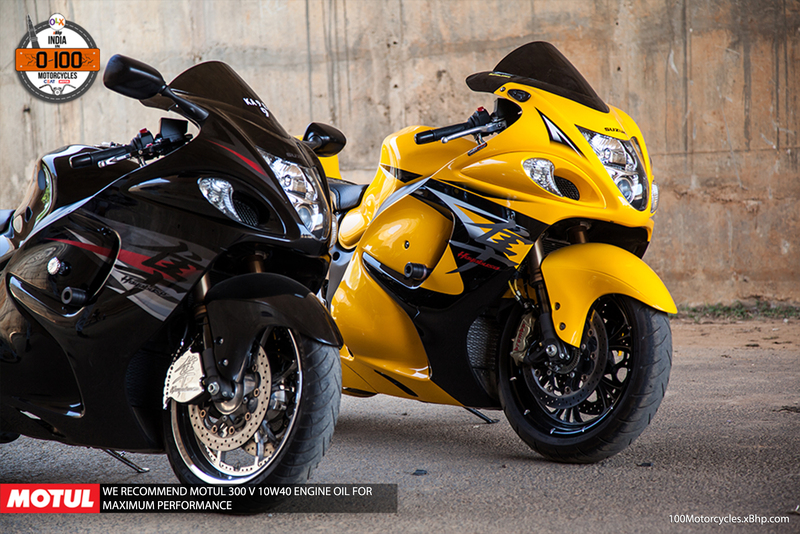 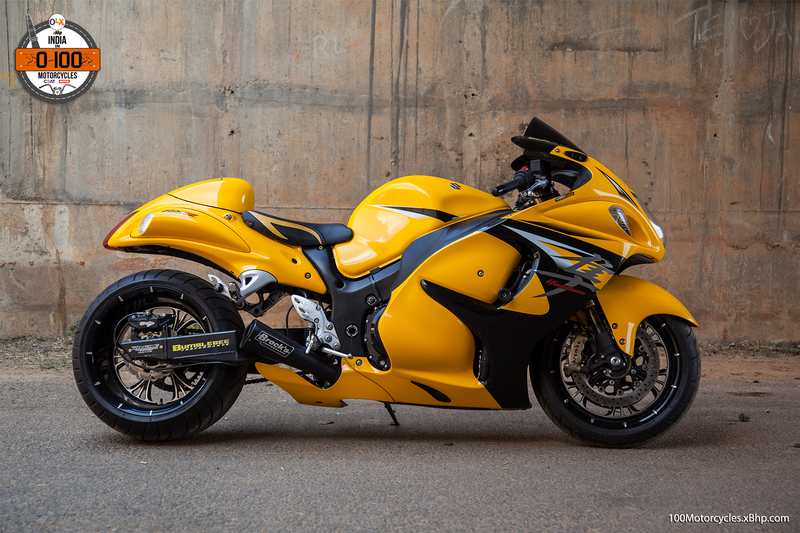 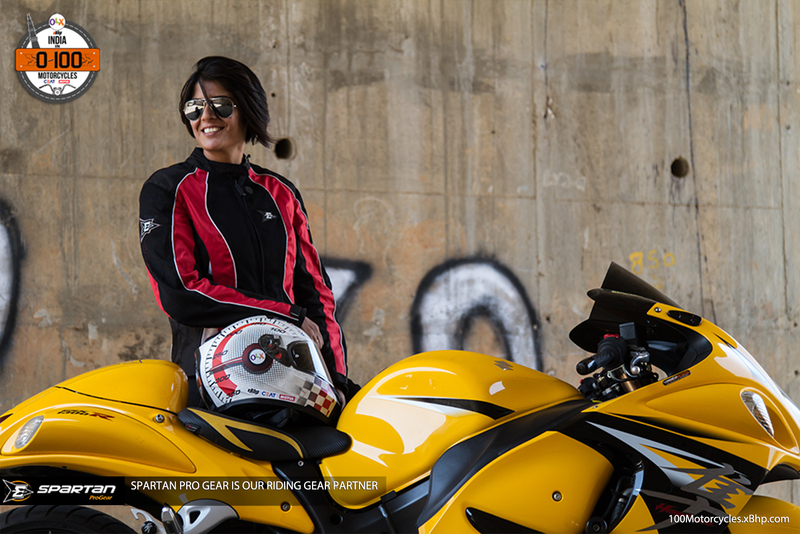 Nataraj has won 2010, 2011 and 2012 Desert Storm on this bike before he moved on to higher capacity motorcycles. 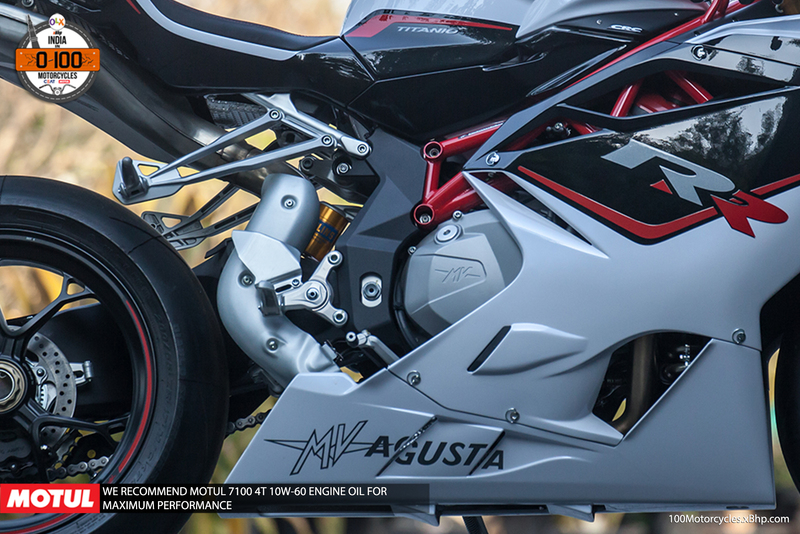 Nothing on this bike that you see will remind you of the street going RTR. 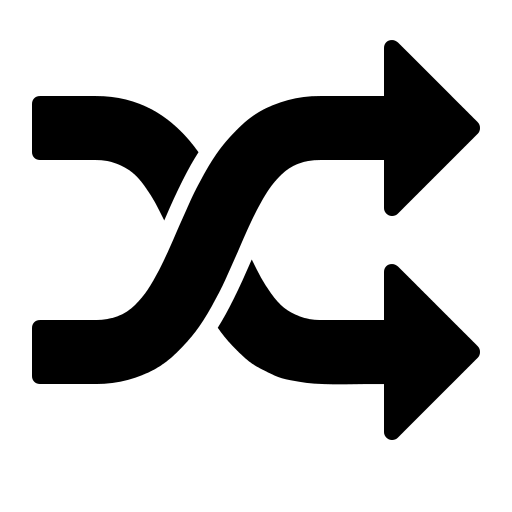 It is drastically different, with only the name being constant! 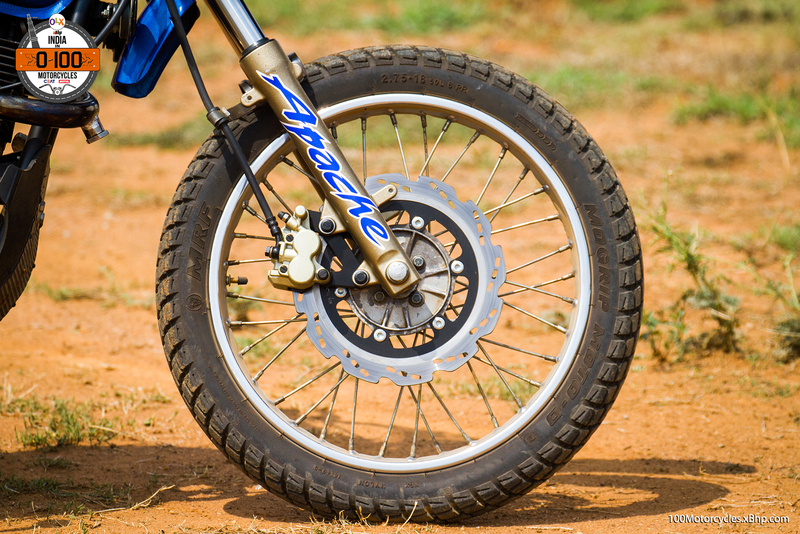 It has the same forks, shock, brakes, as used on the supercross bike, though in a different state of tune. 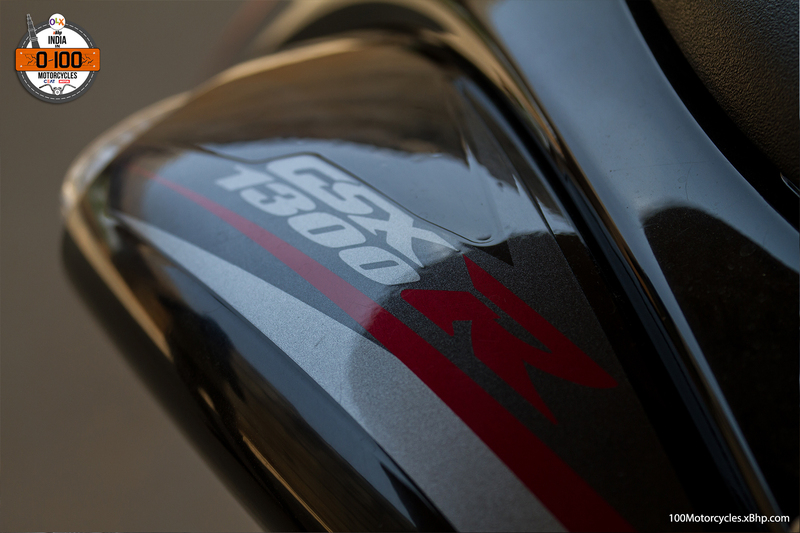 The differences between the supercross and rally bikes are down to the details. 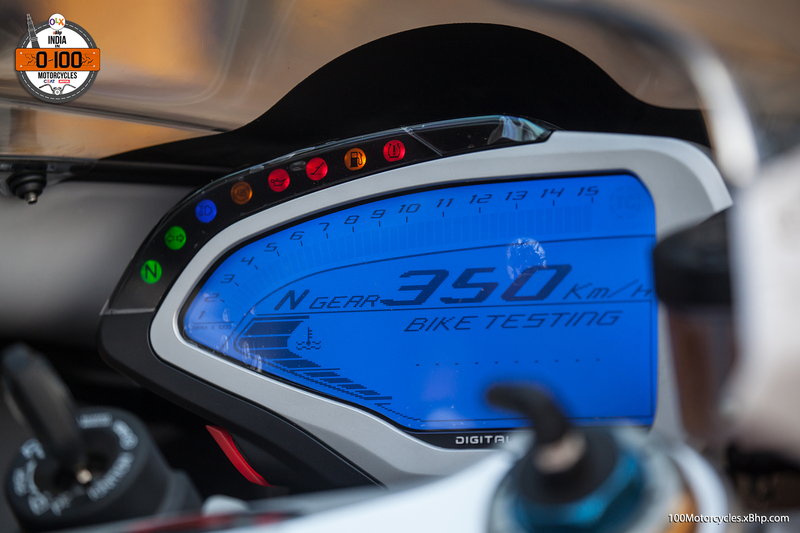 A lot of testing goes on inside the facilities of the TVS R&D centre. 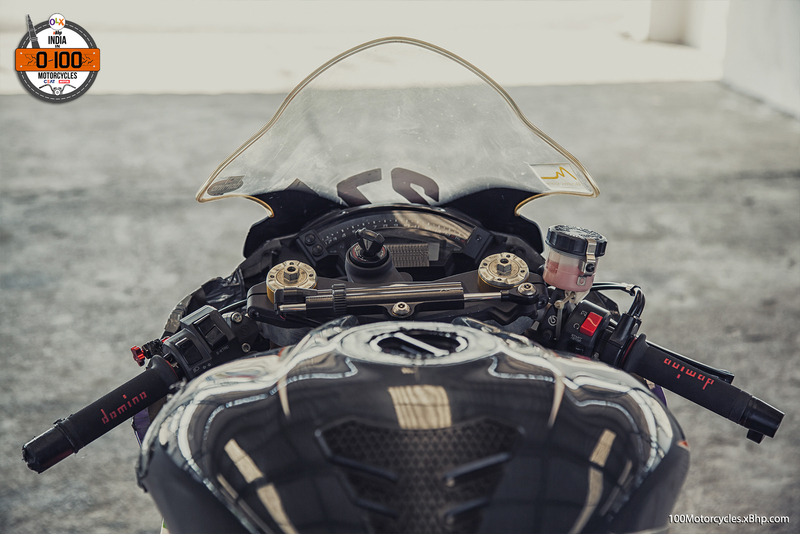 Where a bike is built which the engineers think will be good for the intended usage before it is handed over to the rider where it is fine-tuned. 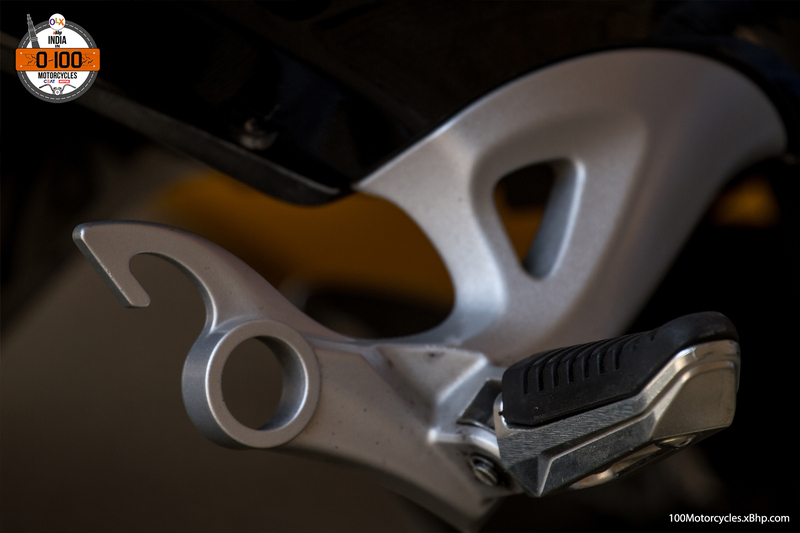 It’s the same forks used in supercross as well but with 136mm travel to handle the terrain. 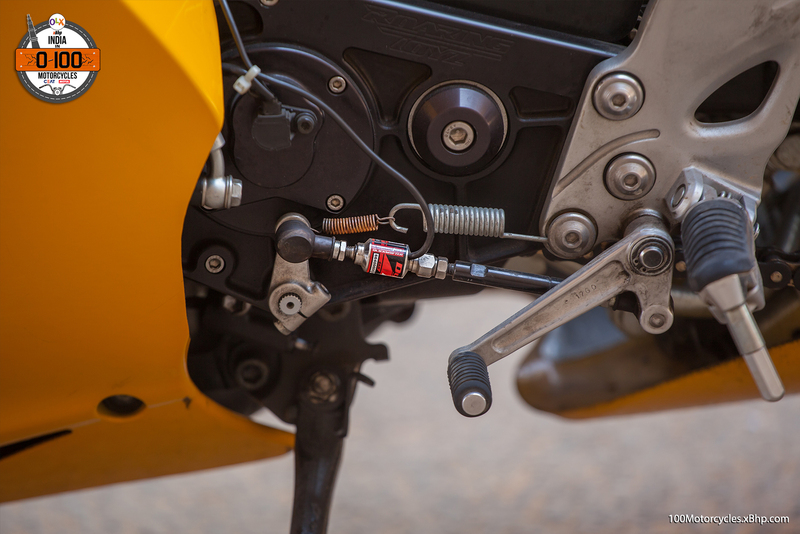 The spring rates are different, though, the damping rates are different as well. 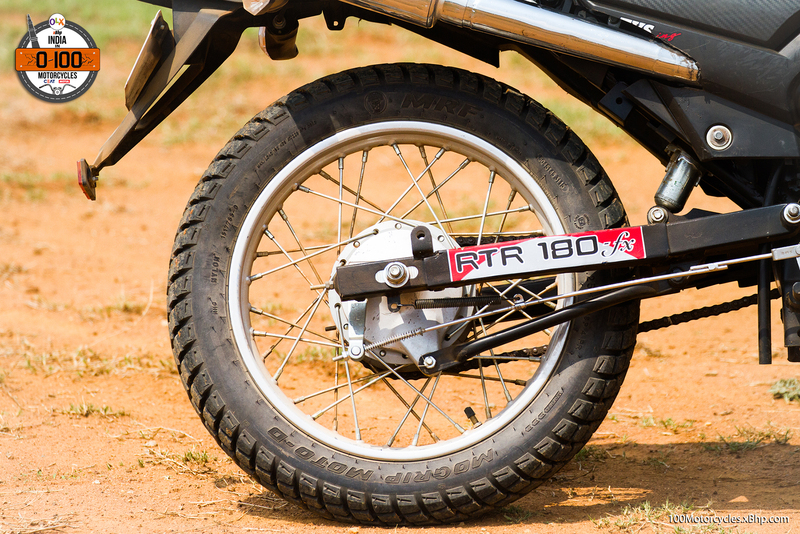 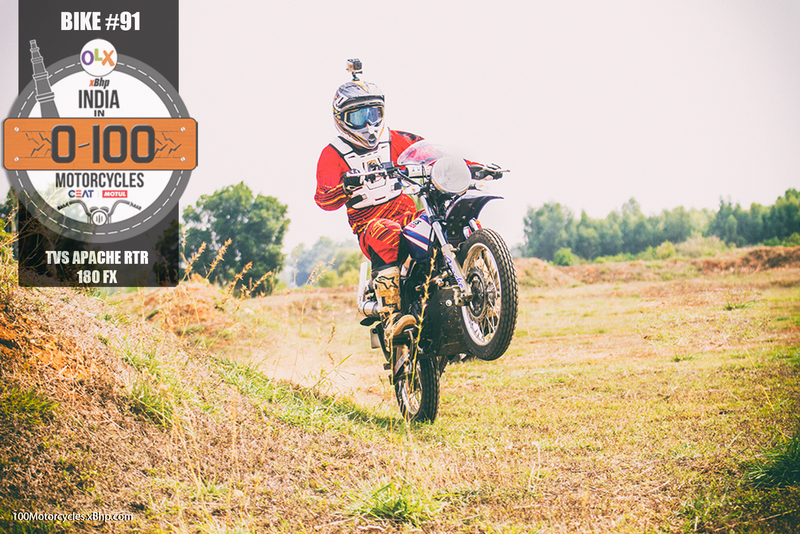 The rally bike has about 20mm more travel than a production Apache 180. 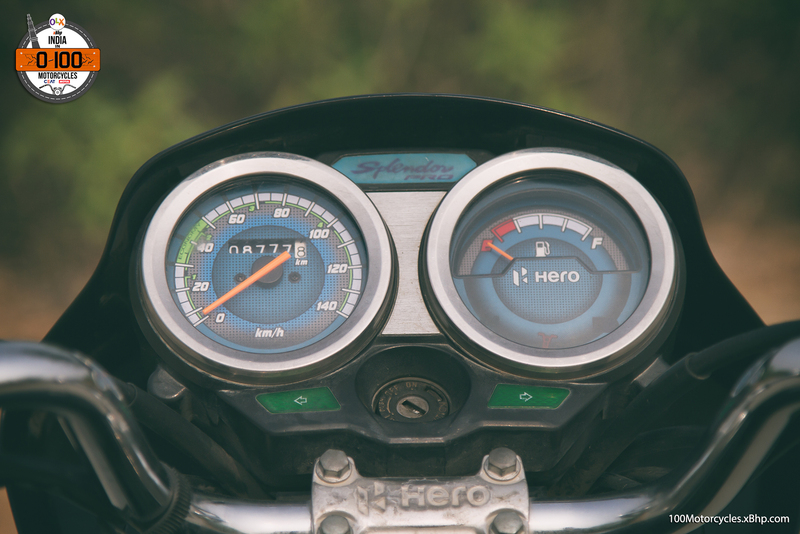 With motorcycles like the Hero Impulse, Kawasaki KLX in the Indian market, why doesn’t TVS bring out something similar as well we asked? 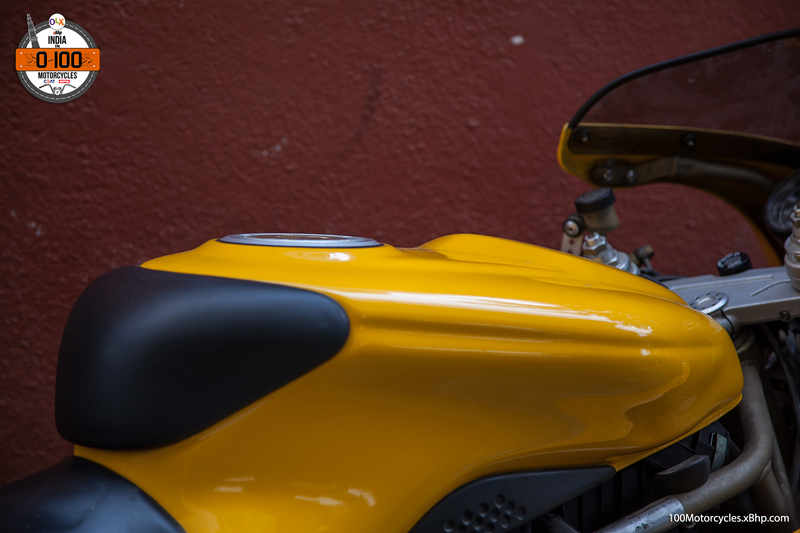 Especially considering that they already have such a motorcycle in their workshop! 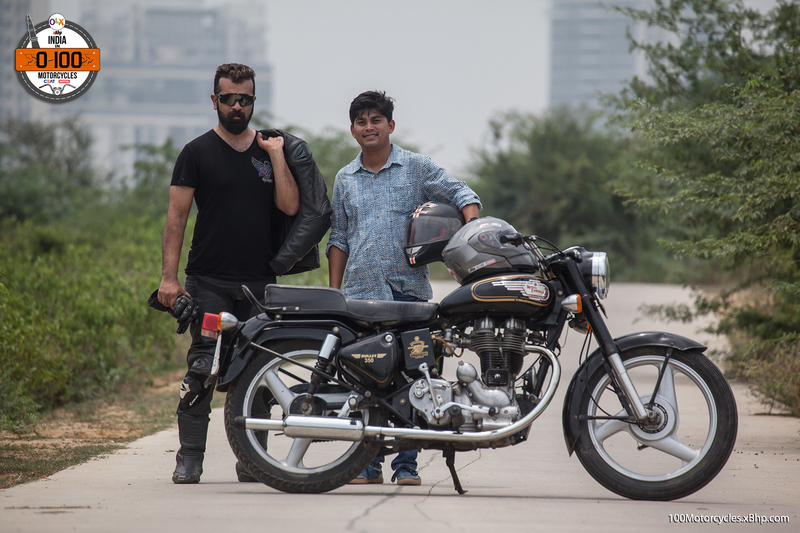 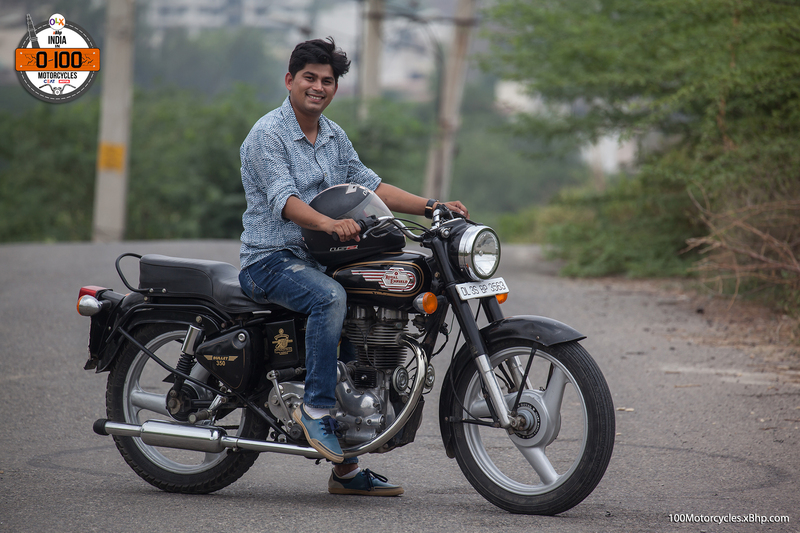 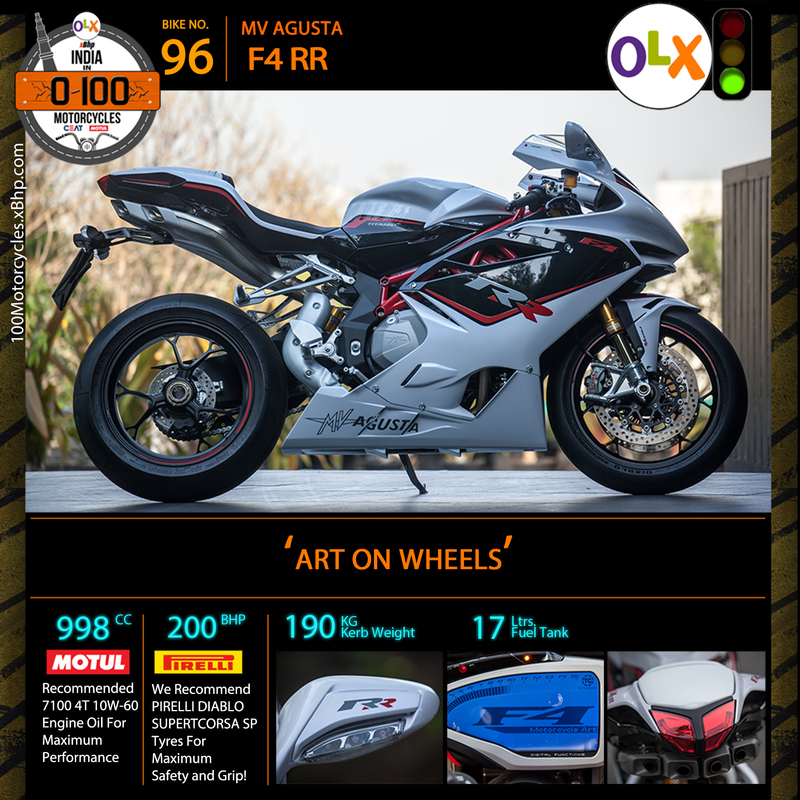 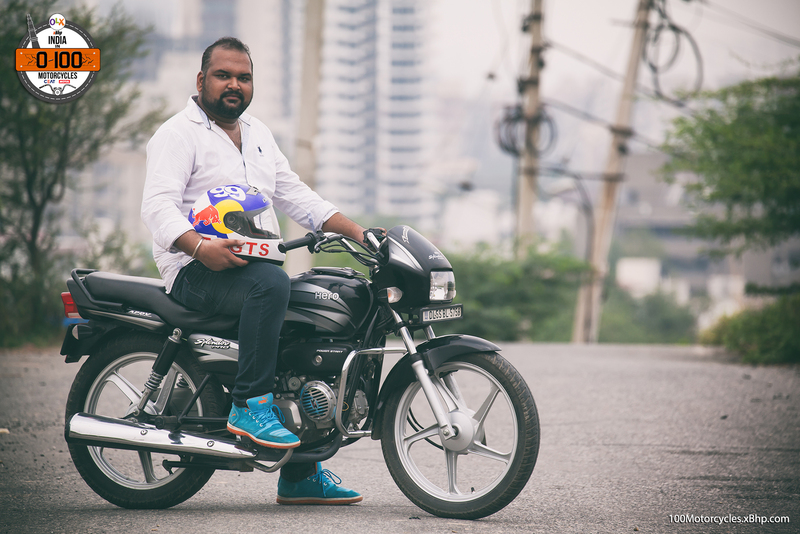 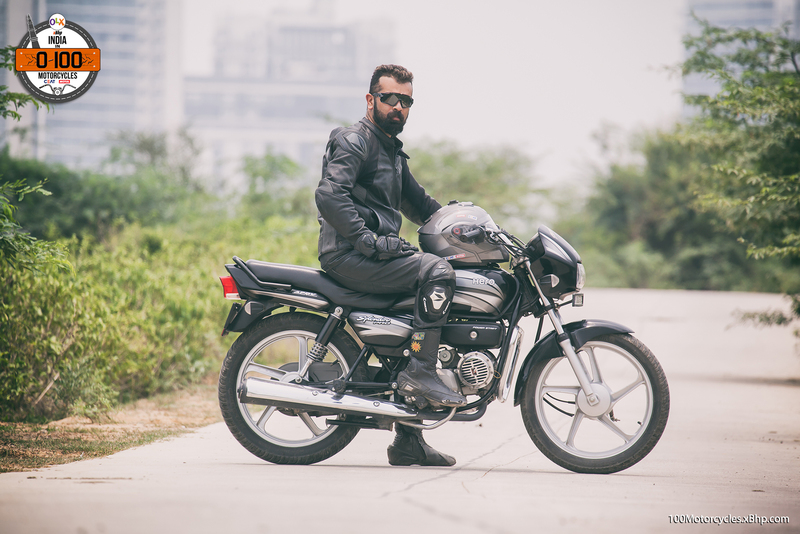 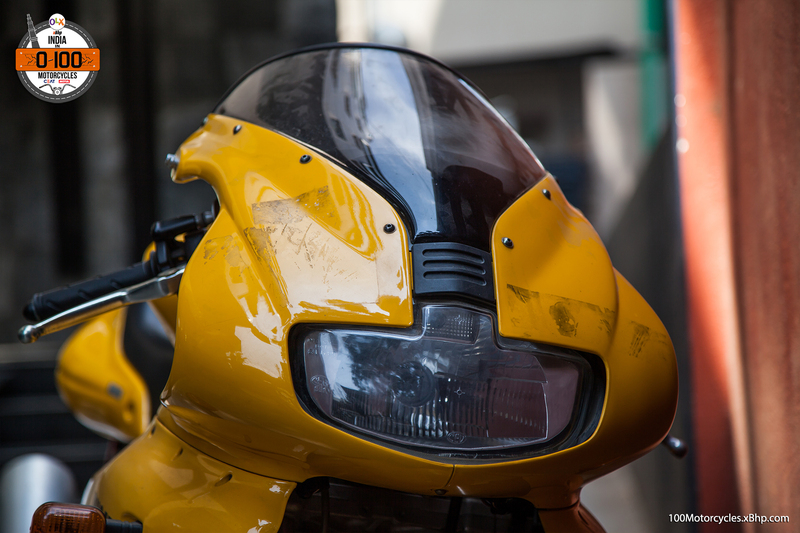 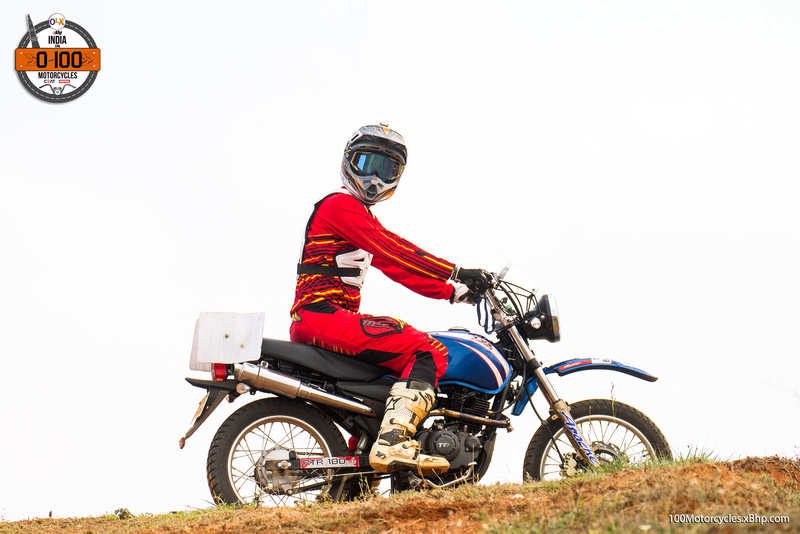 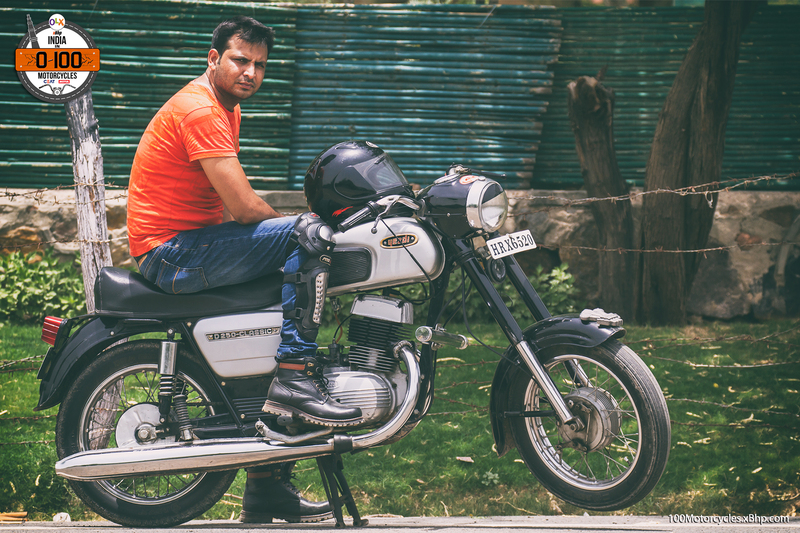 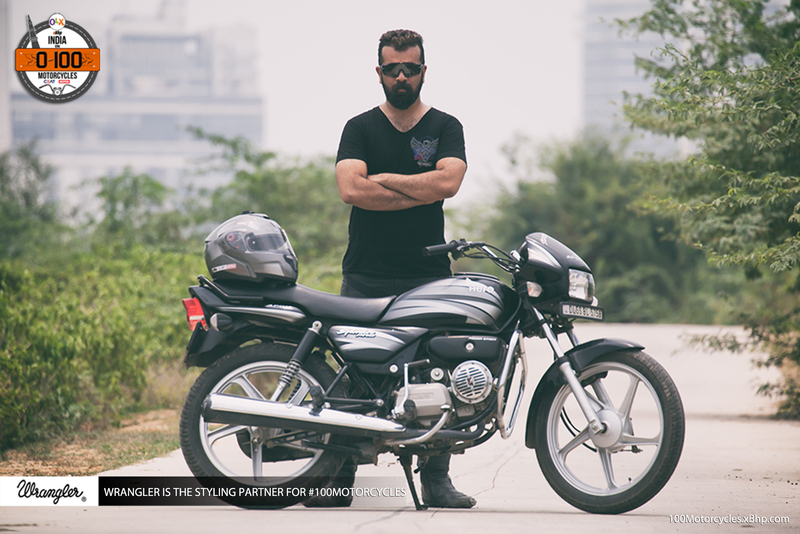 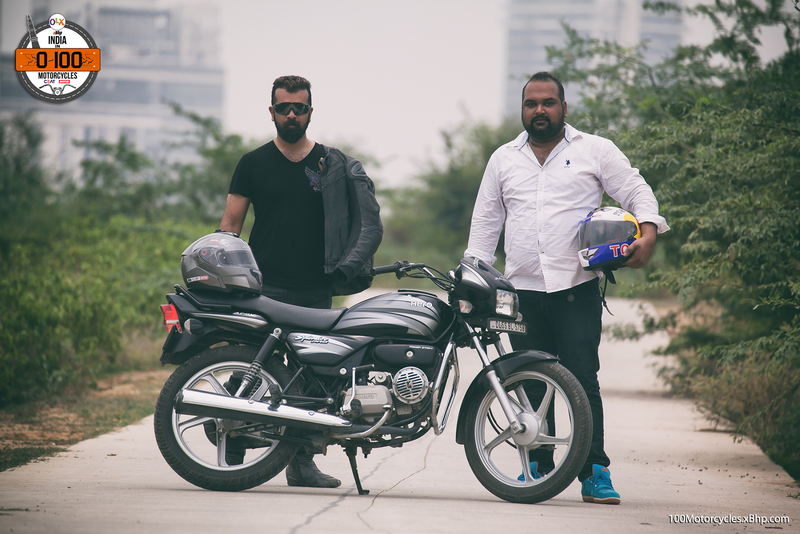 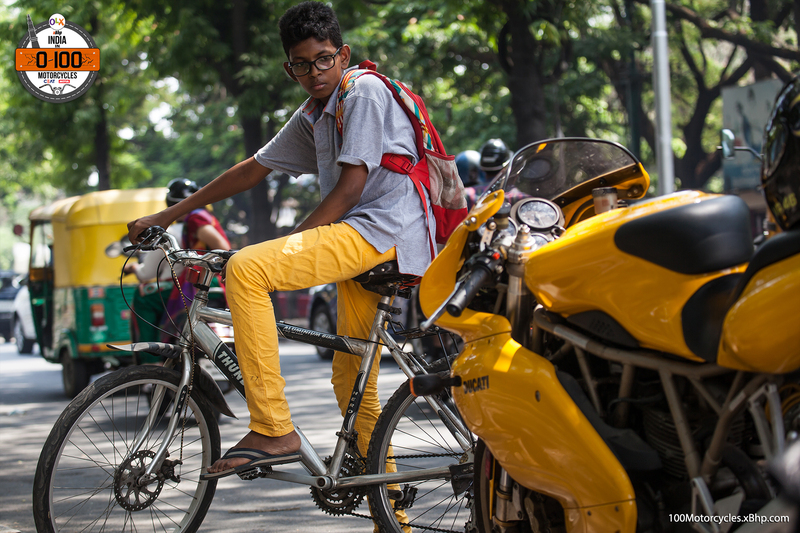 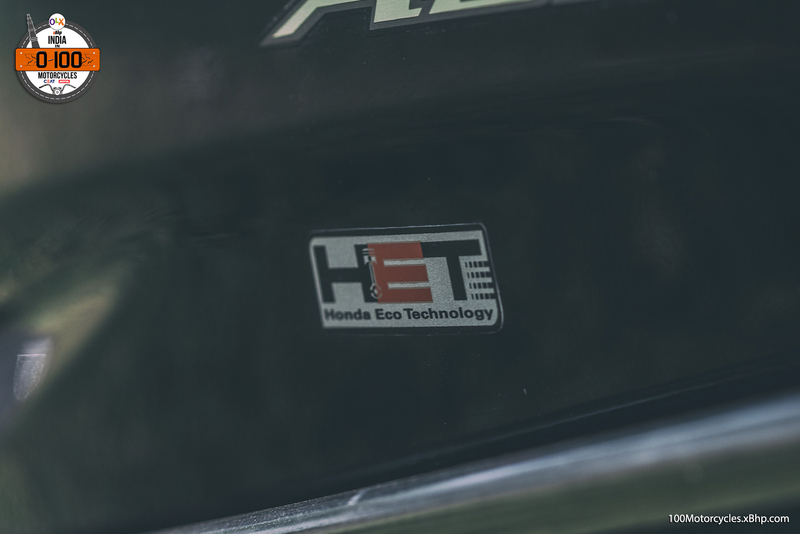 Anand told us that the changes that are made to the bike make the motorcycle very sensitive, and as such this machine needs the skill of a rider like Nataraj, to be able to extract the performance out of it. 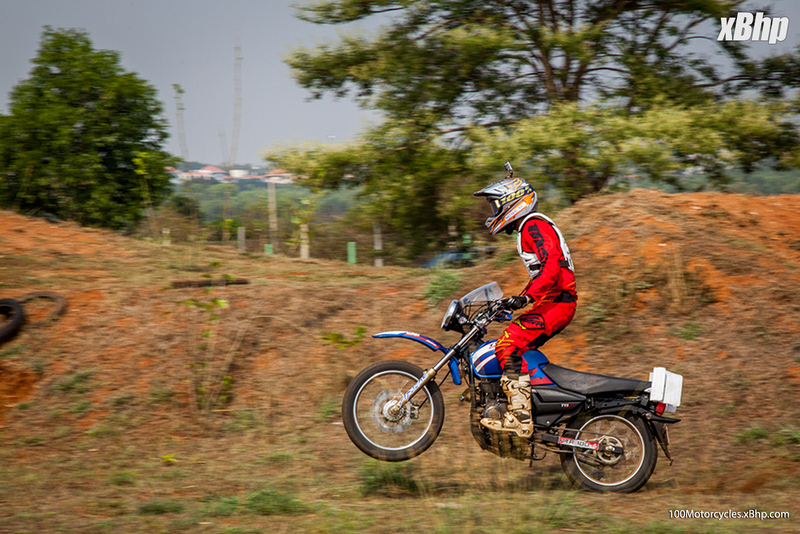 A regular rider would probably be slower than on a stock machine! 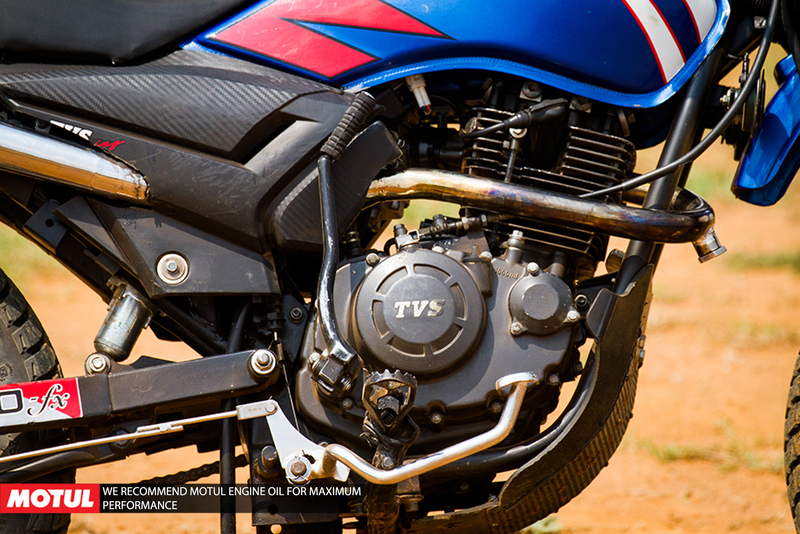 From an engineering standpoint, TVS already has such machines lined up. 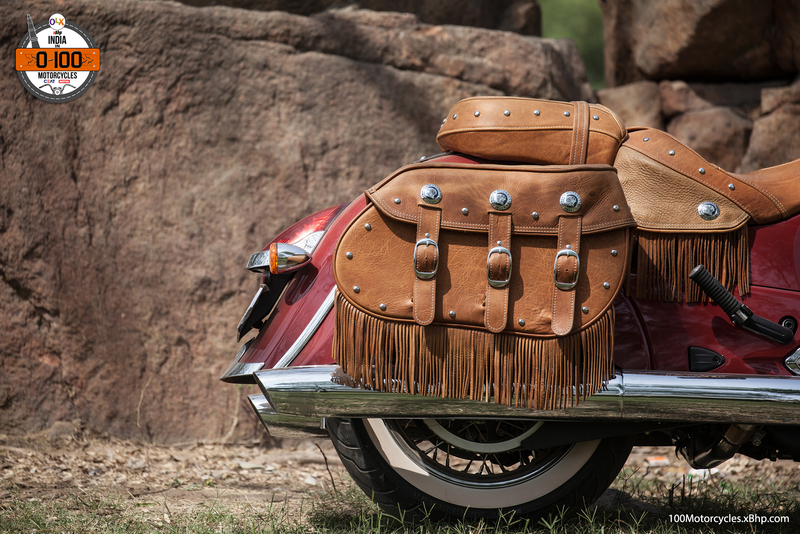 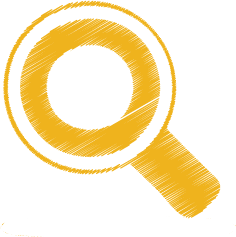 But to bringing it to the showrooms is a marketing and business decision. 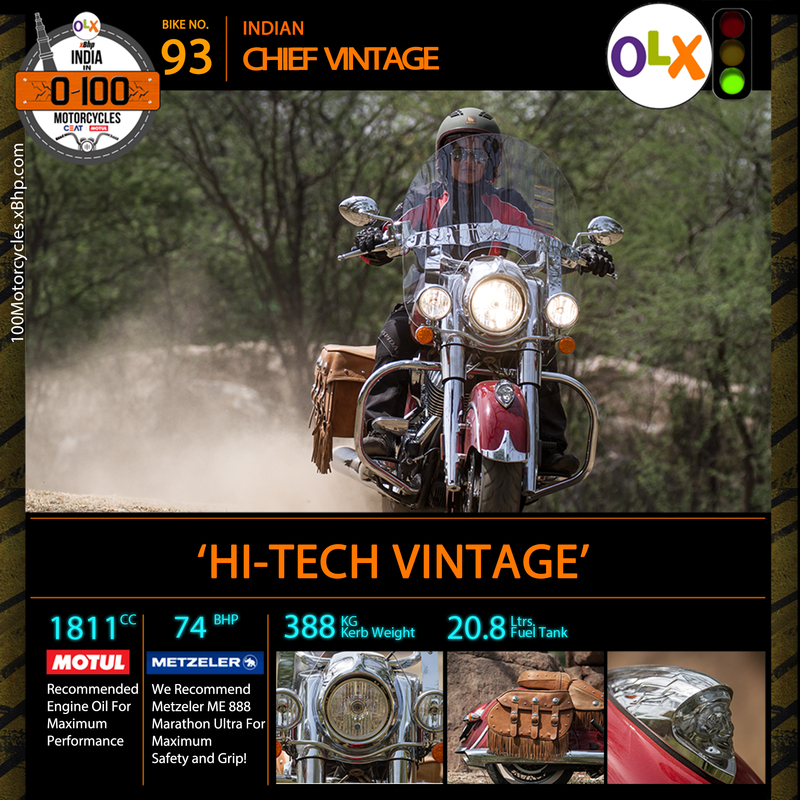 When the market demands, TVS will definitely bring it out they said! 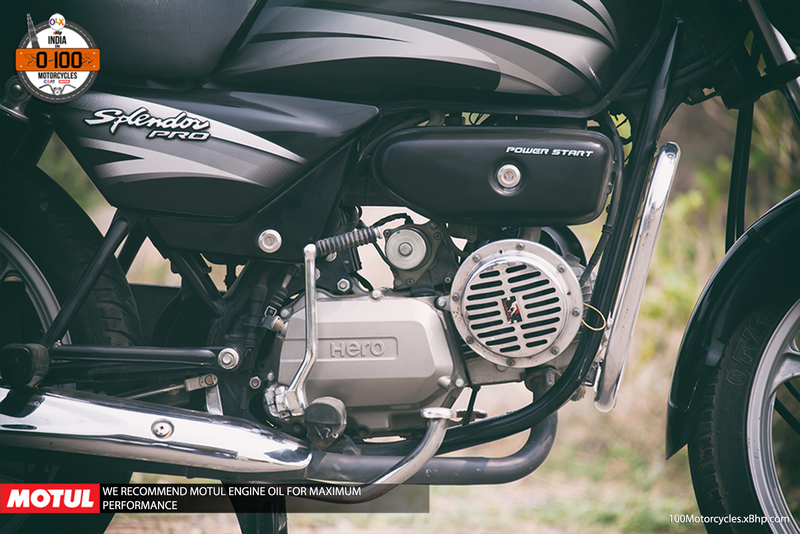 This tuned engine produces around 24-25bhp as compared to the standard 17bhp of the stock Apache. 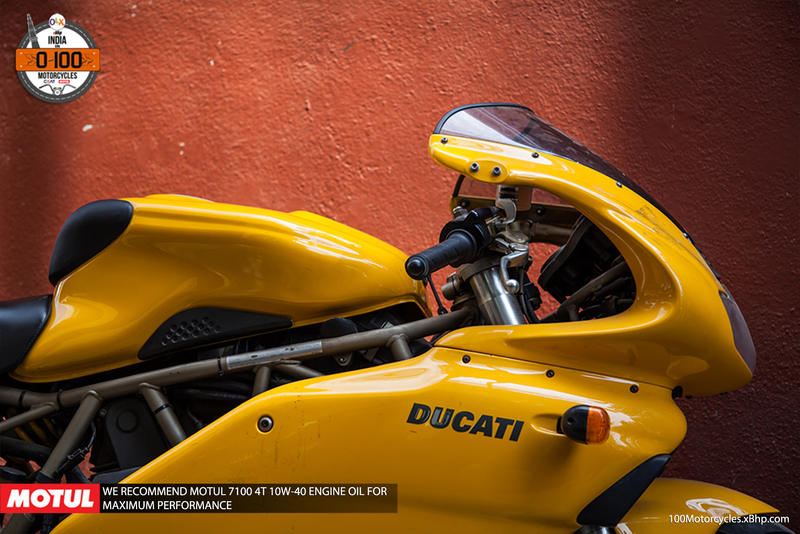 That would be quite a stressed engine. 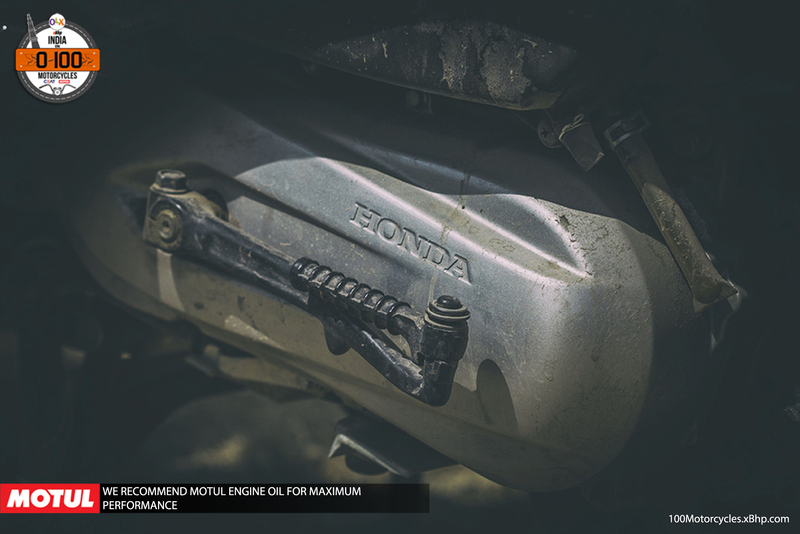 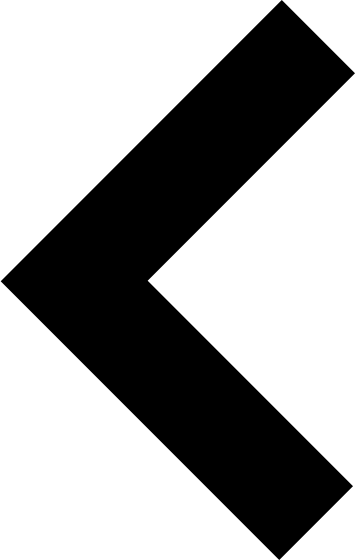 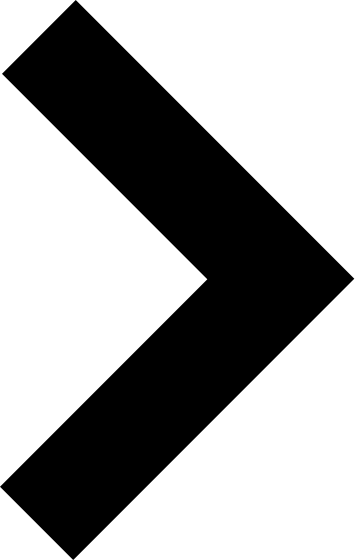 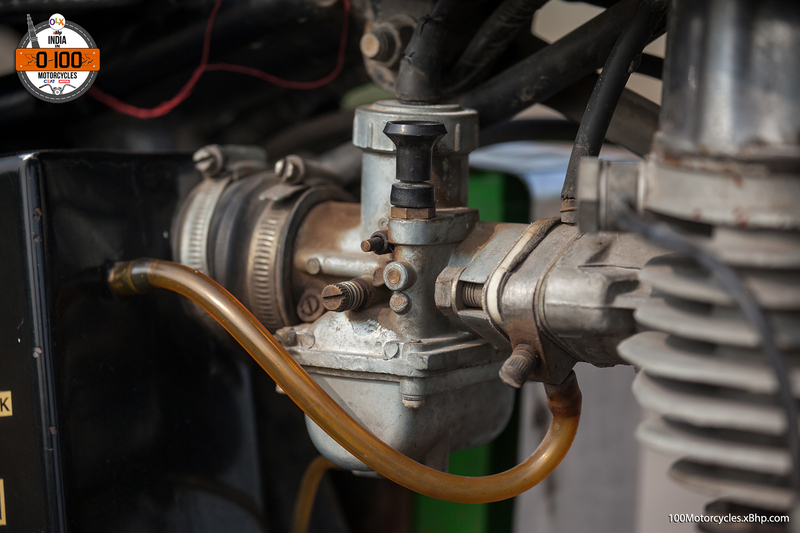 A race tuned engine will have a life of around 20-40 hours, depending on the various internal parts. 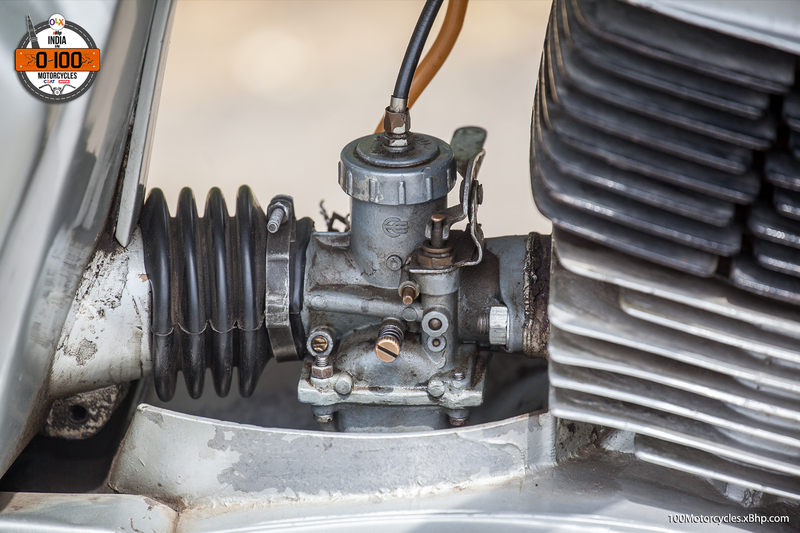 That doesn’t mean that the parts are scrapped after that, but you need to service, inspect and then assemble the engines again. 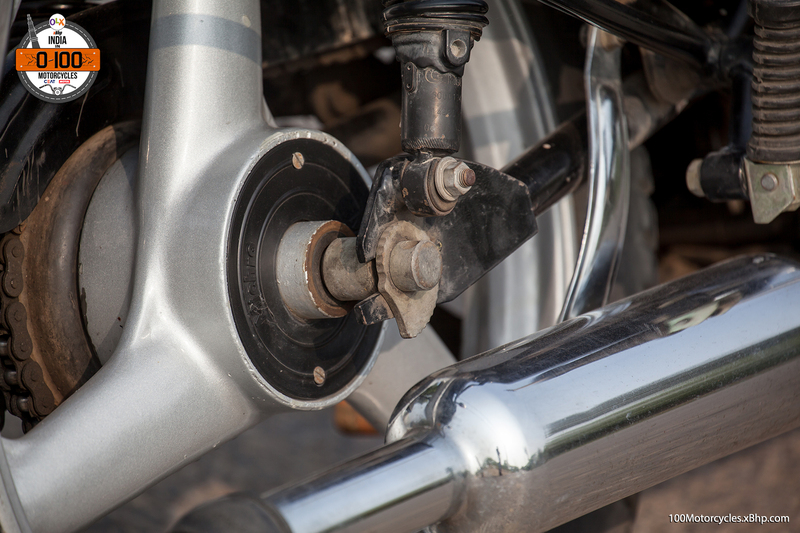 And of course, for doing this job you need expert mechanics like the ones that are in the TVS Factory. 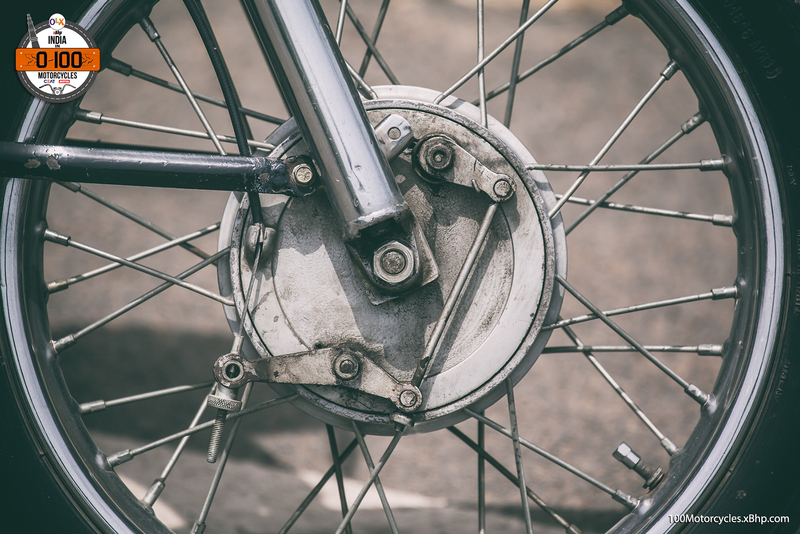 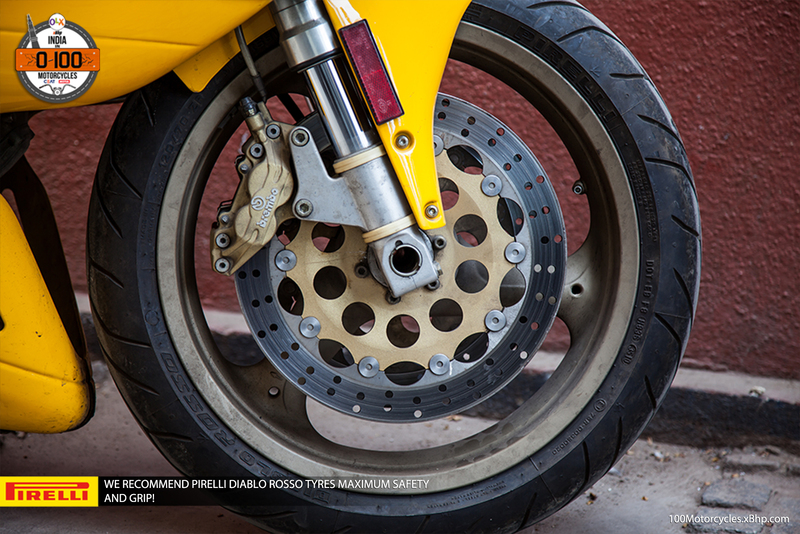 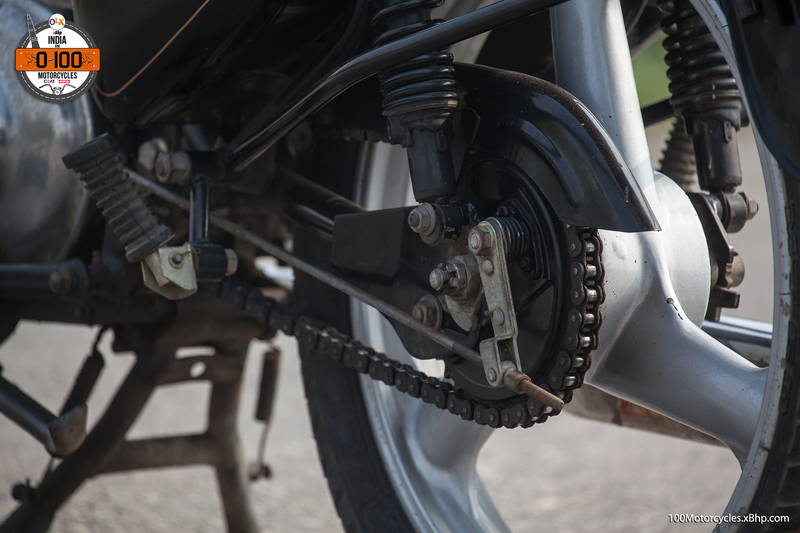 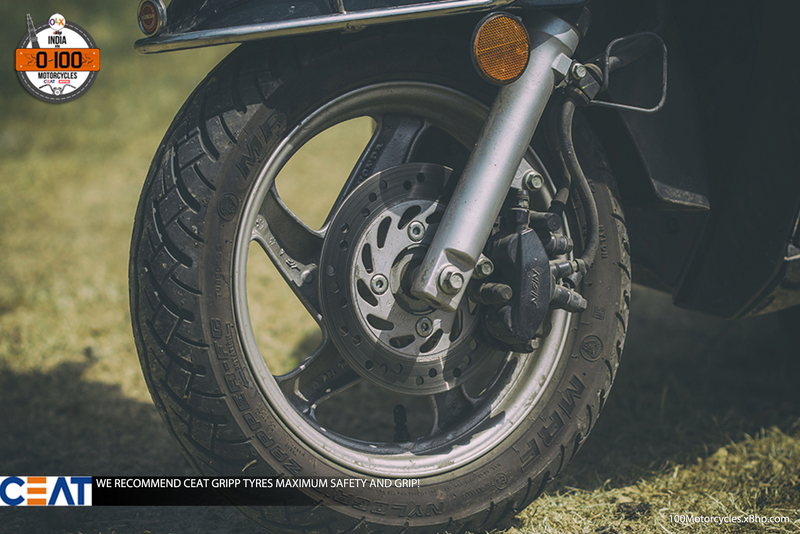 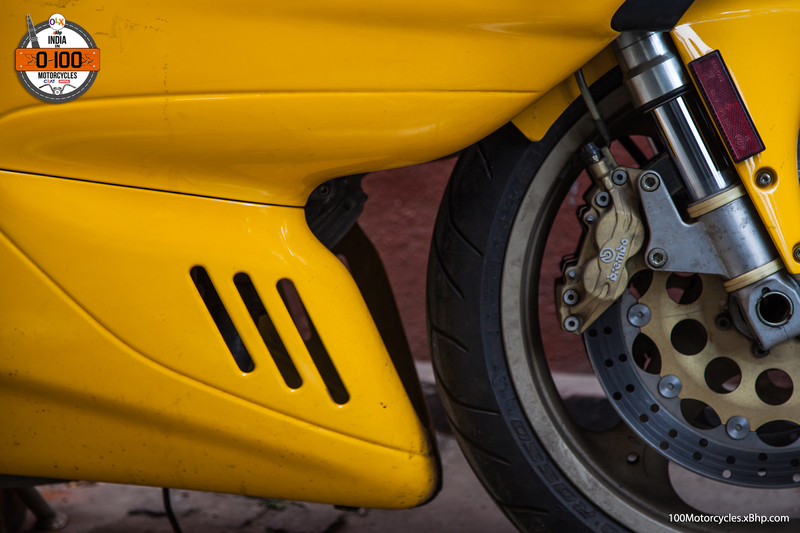 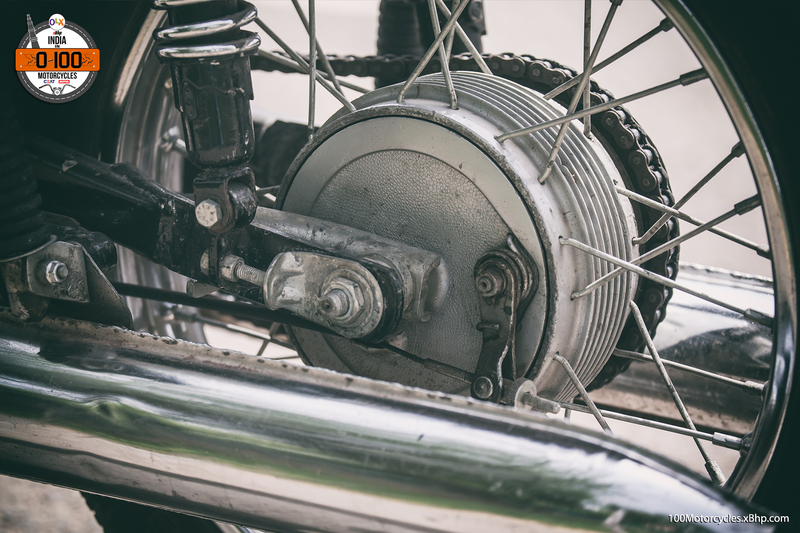 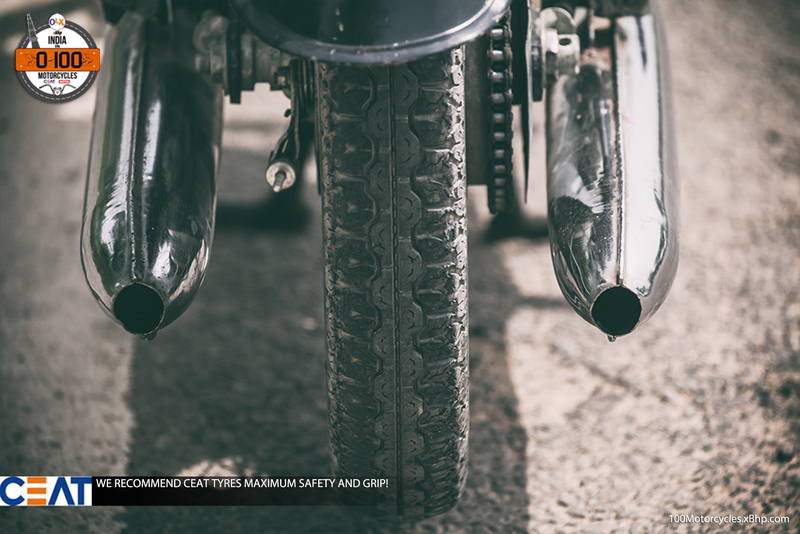 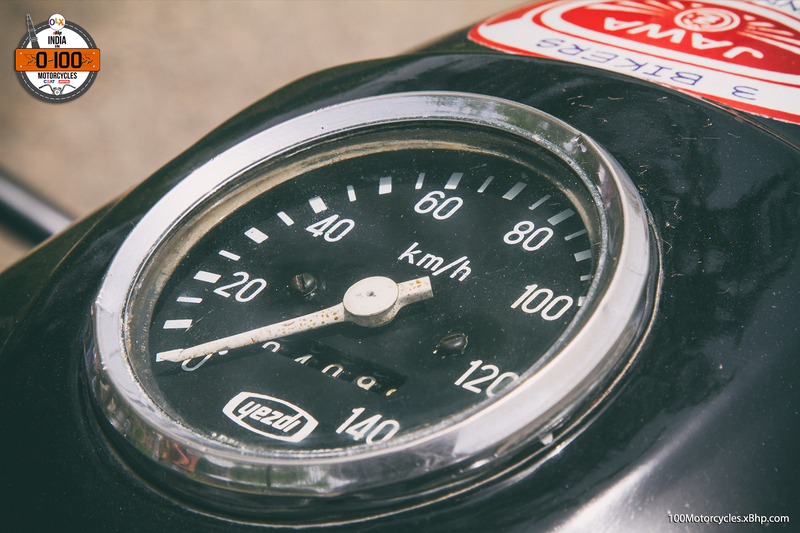 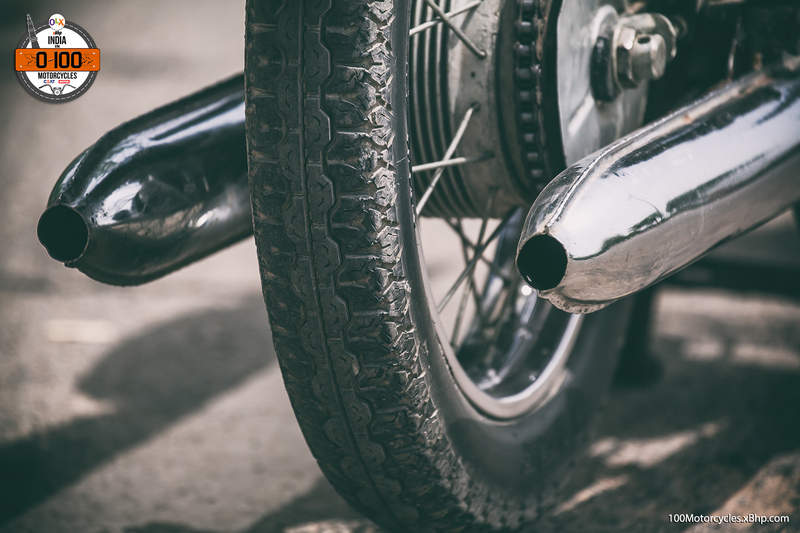 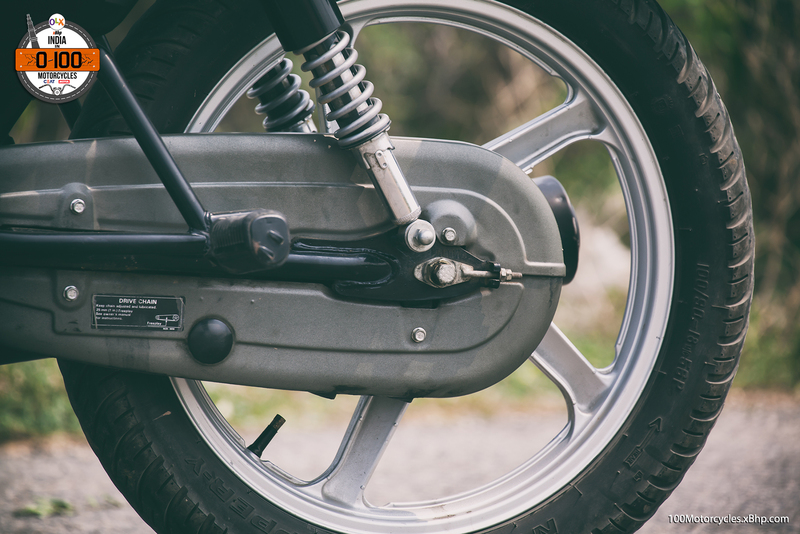 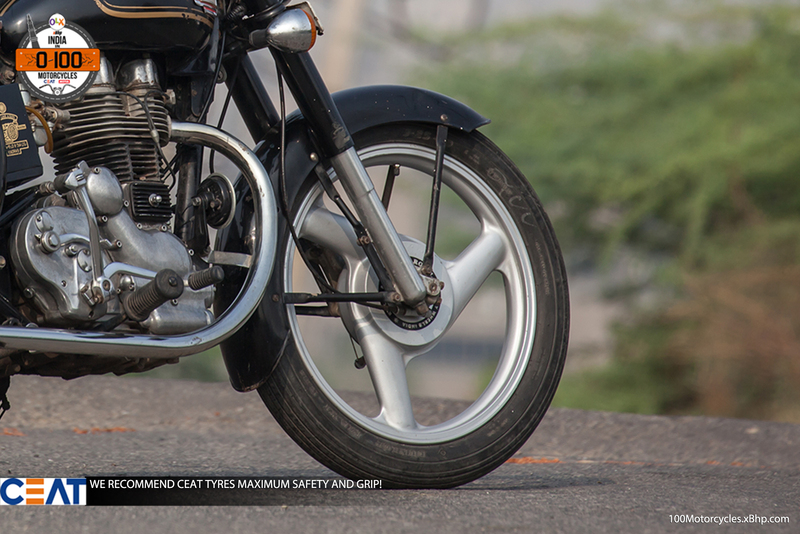 A street bike, on the other hand, is built to last many years/ kilometers with minimal maintenance. 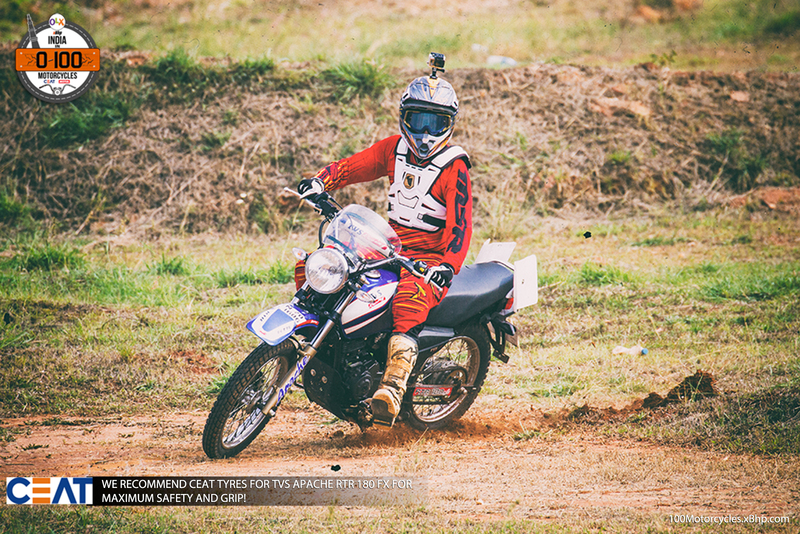 We sincerely hope that TVS will bring a road legal motorcycle which is dirt inclined soon to the Indian market. 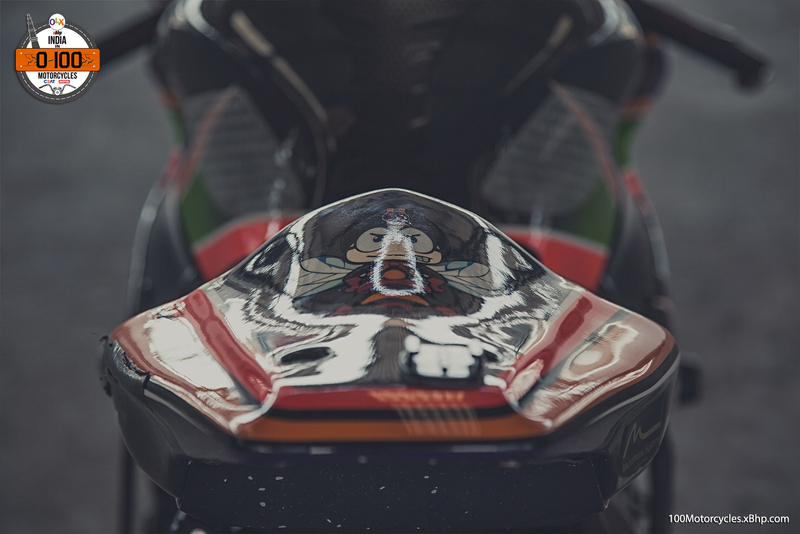 It would be crazy fun!